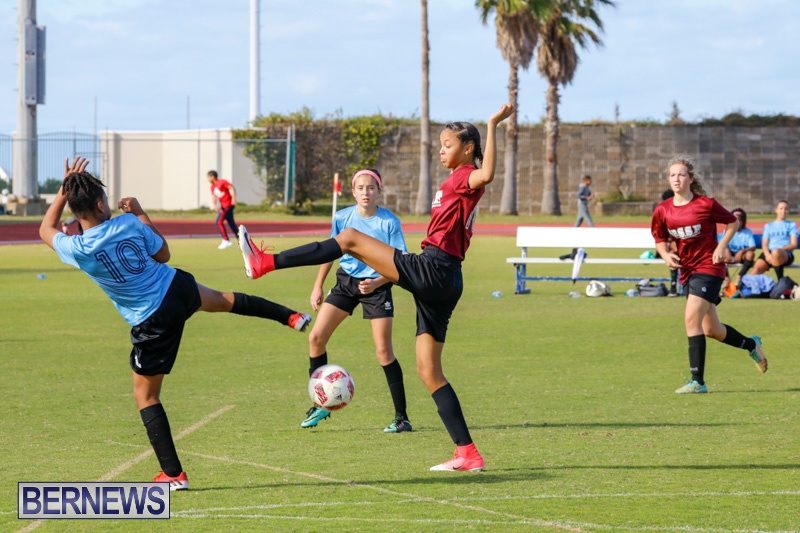 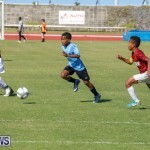 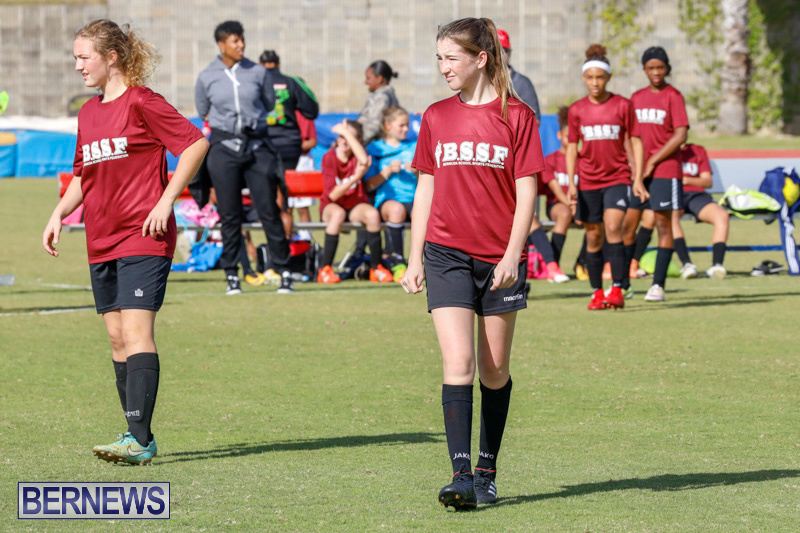 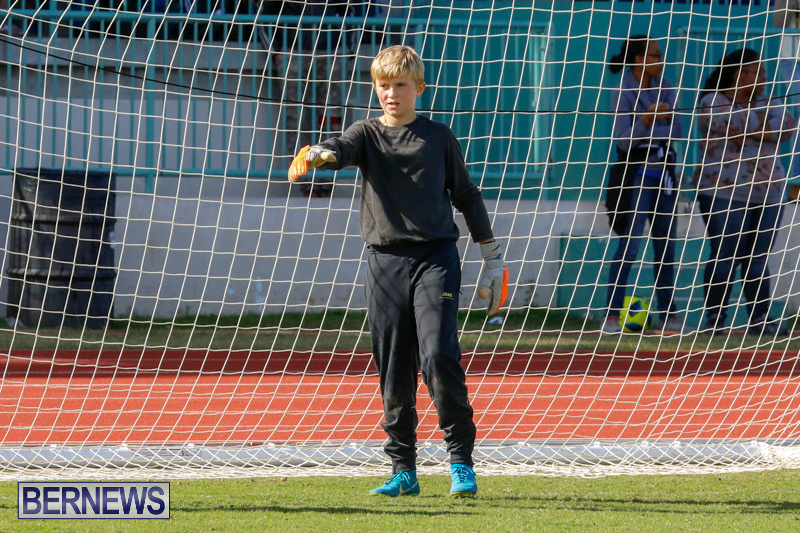 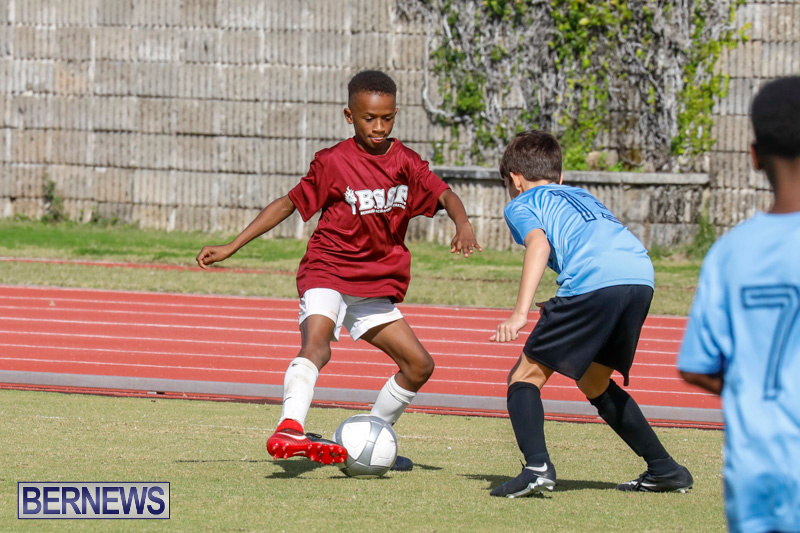 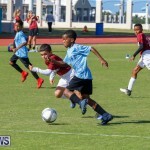 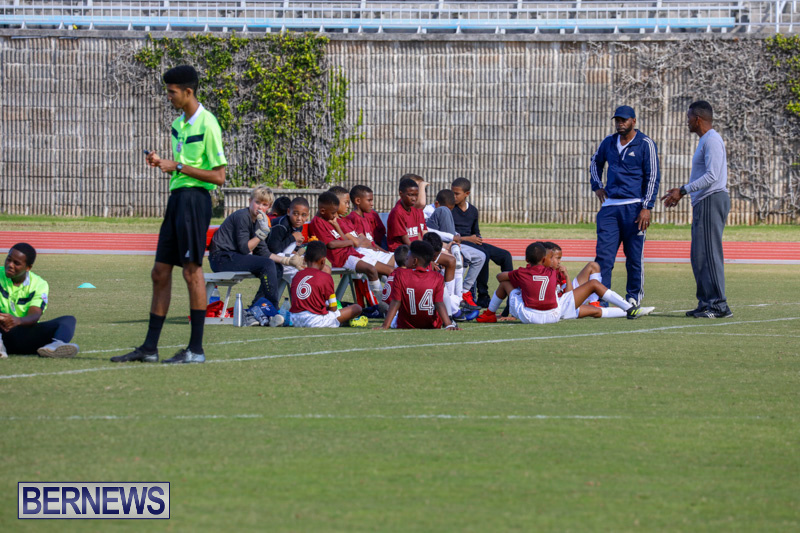 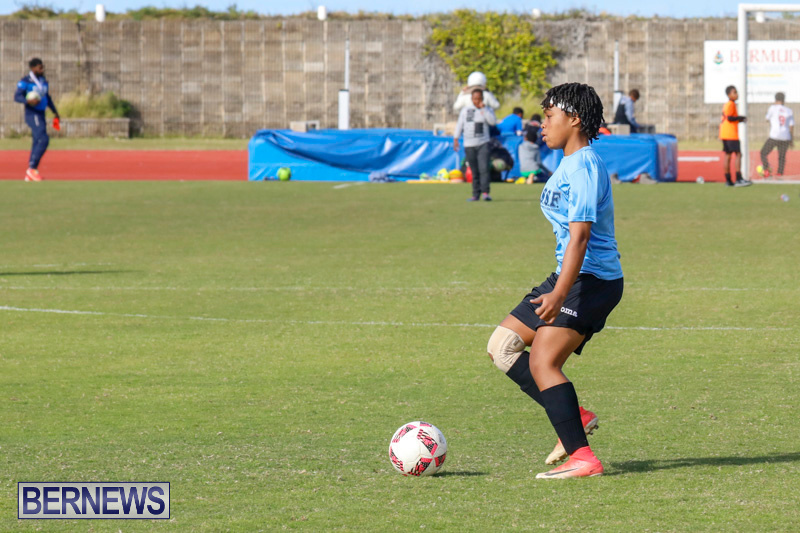 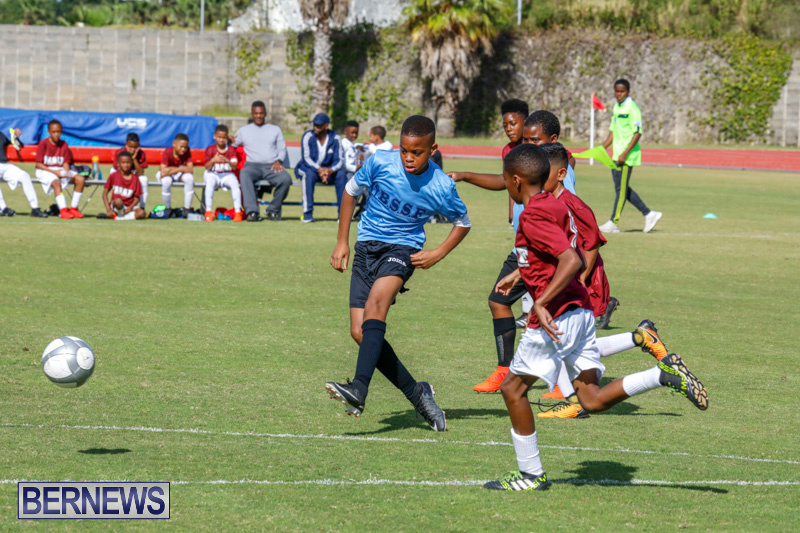 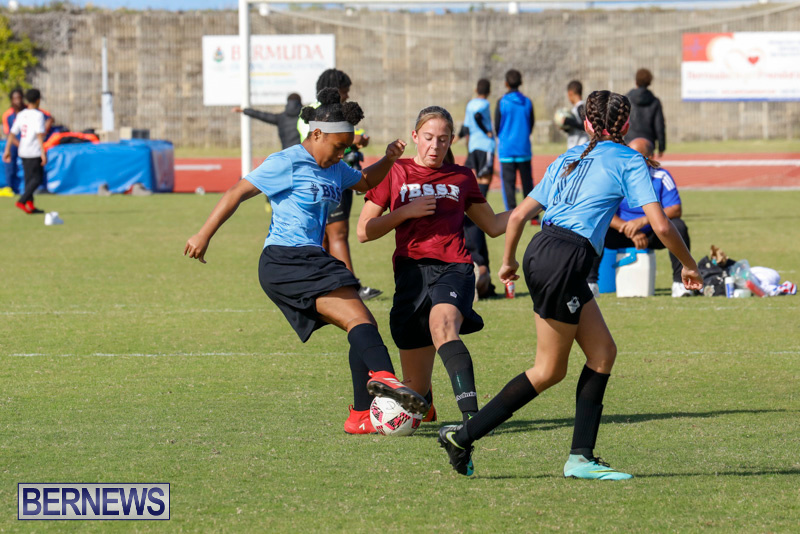 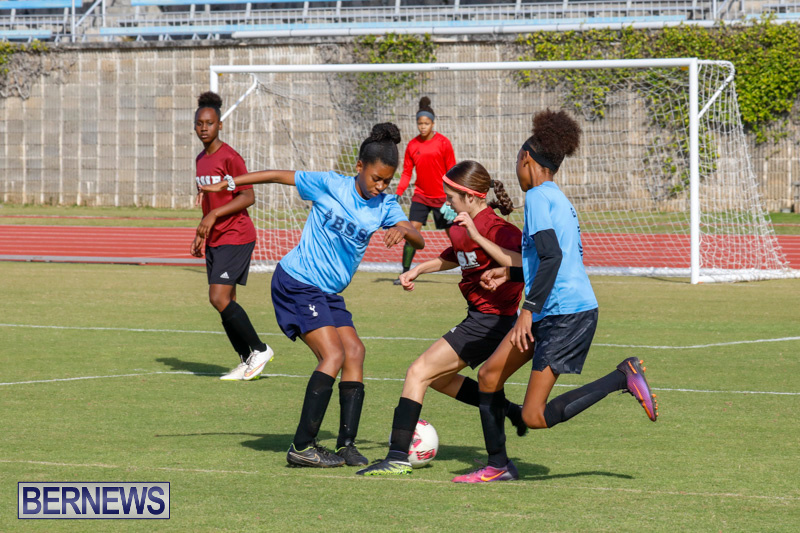 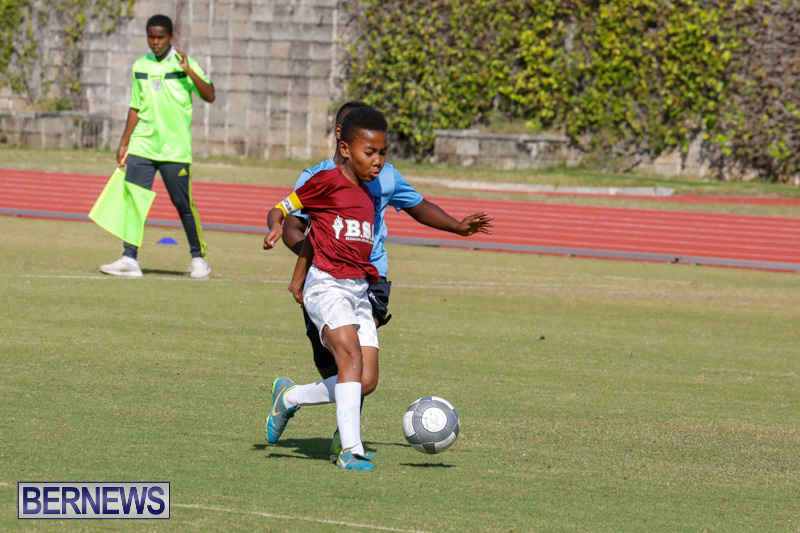 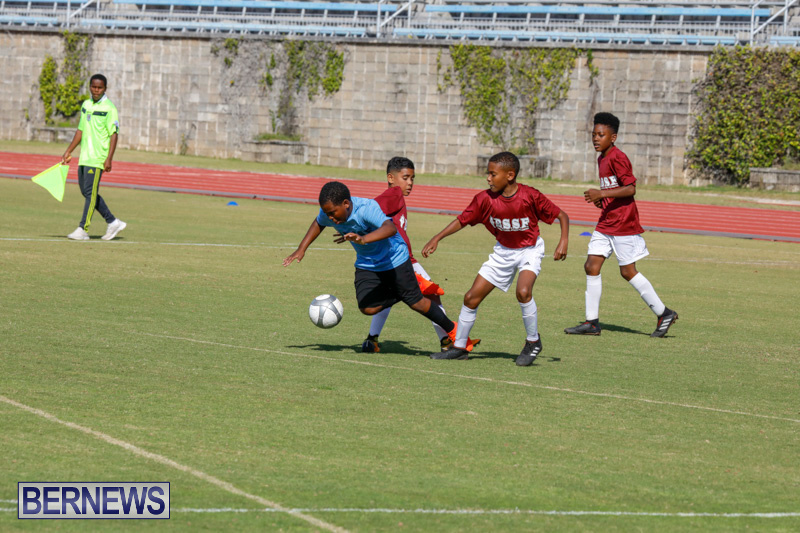 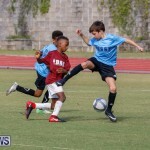 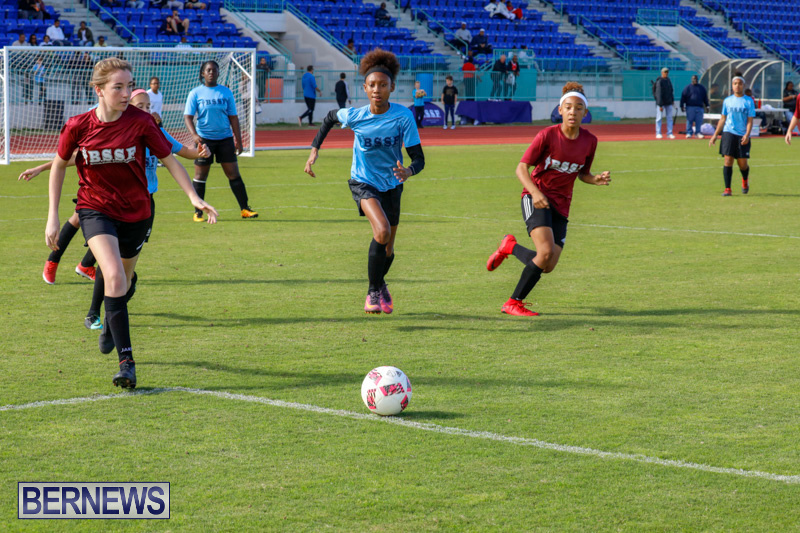 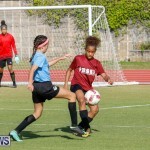 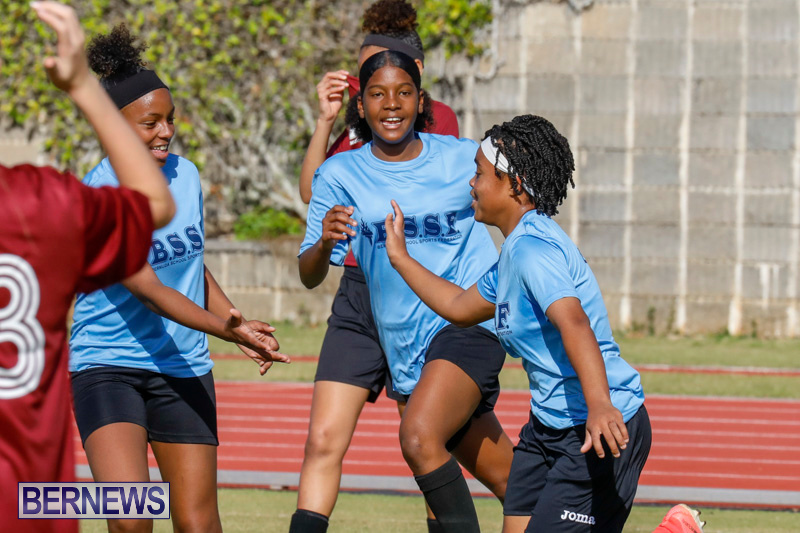 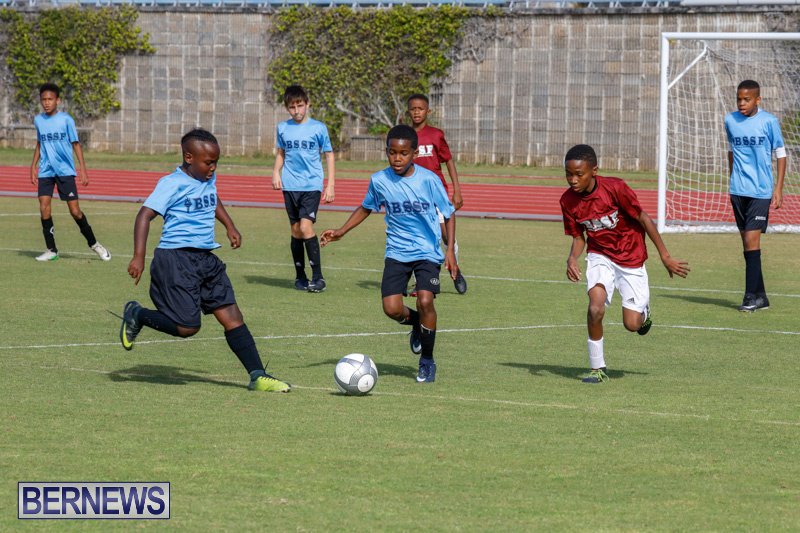 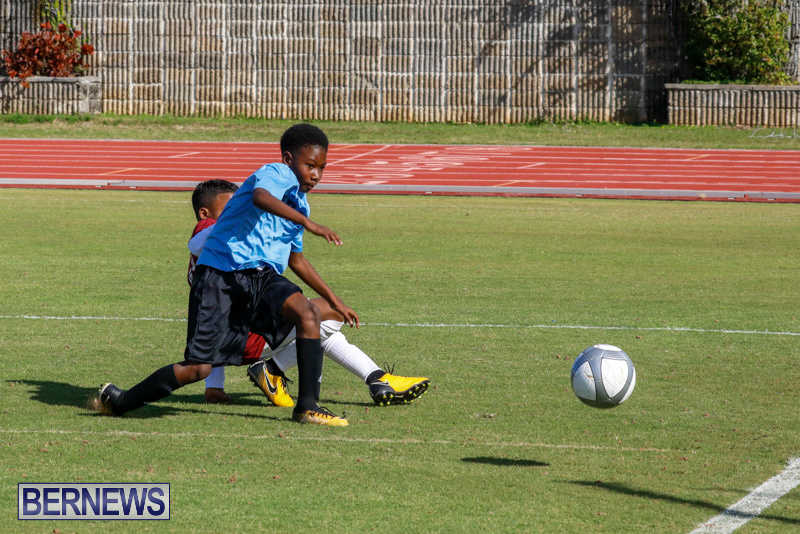 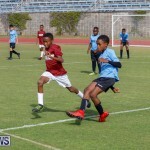 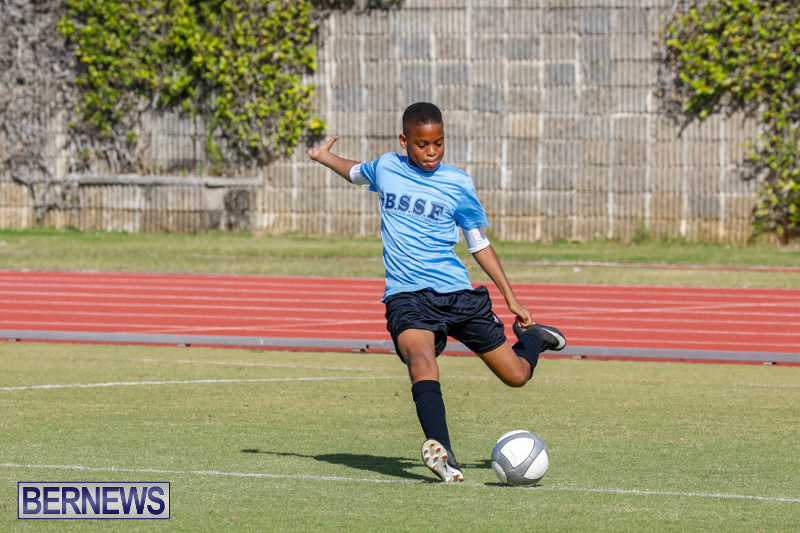 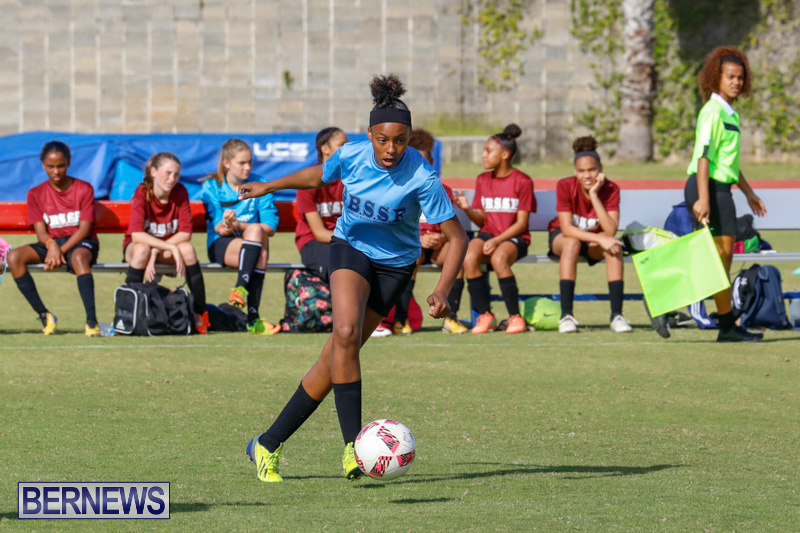 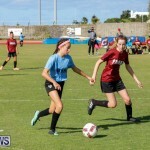 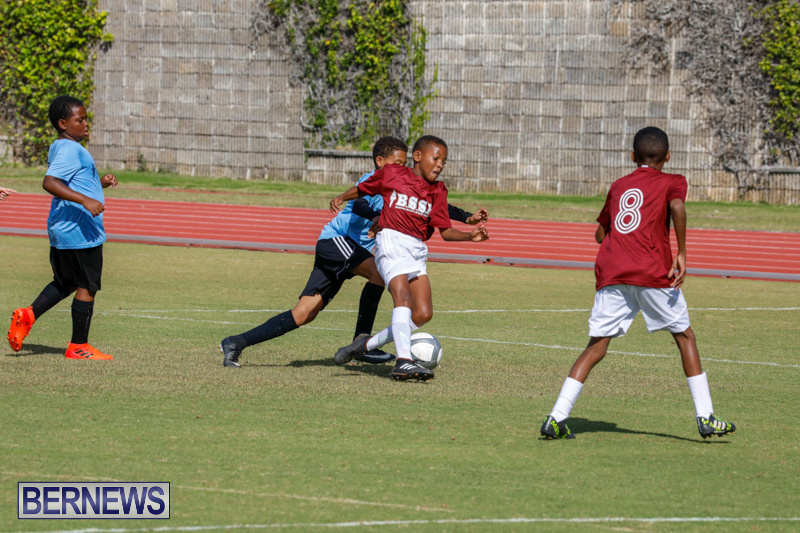 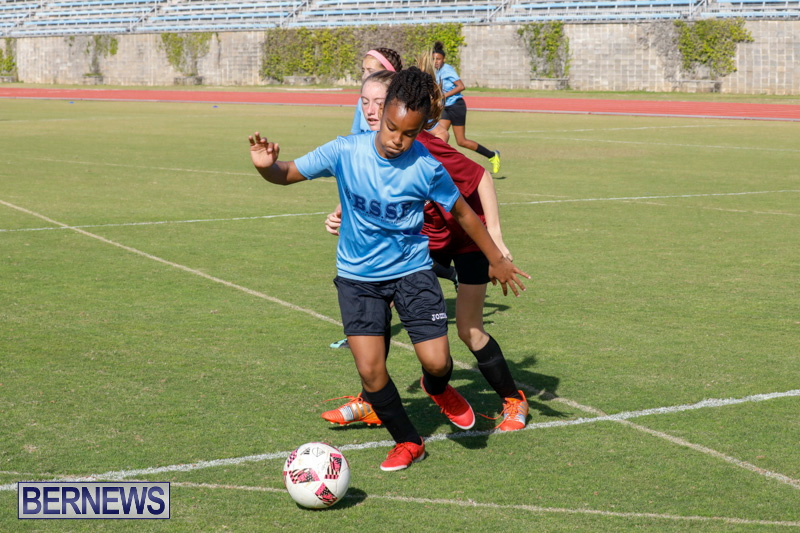 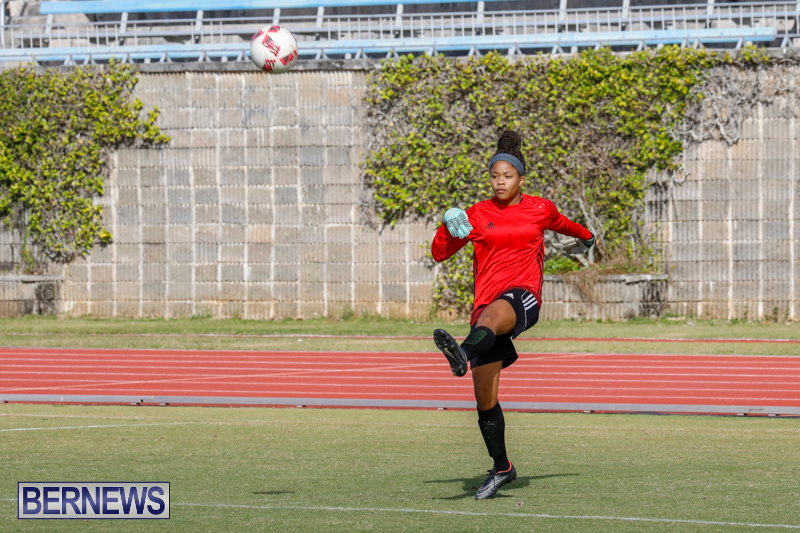 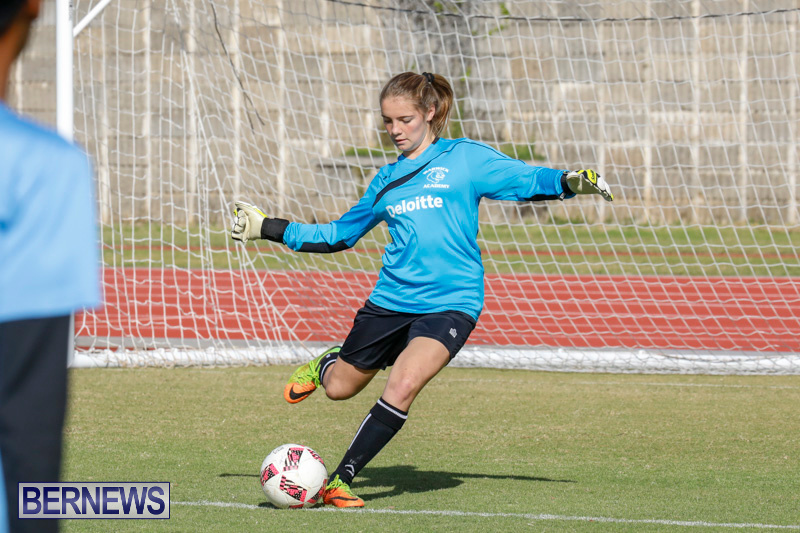 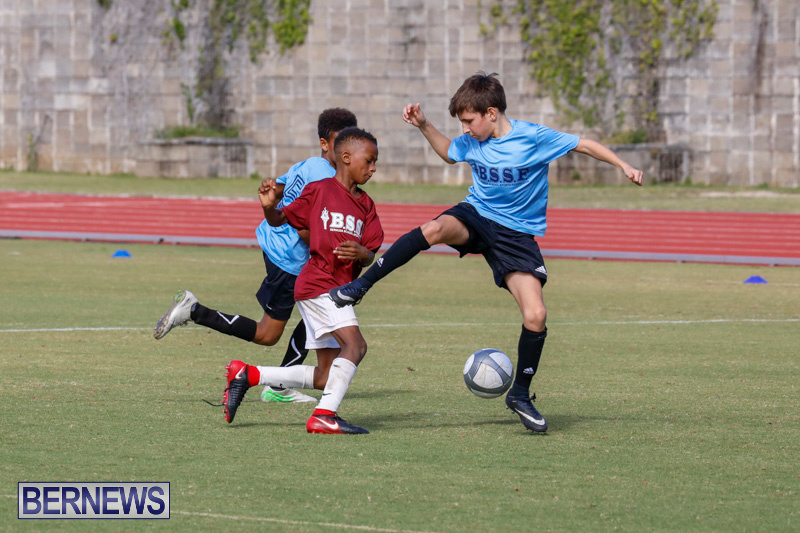 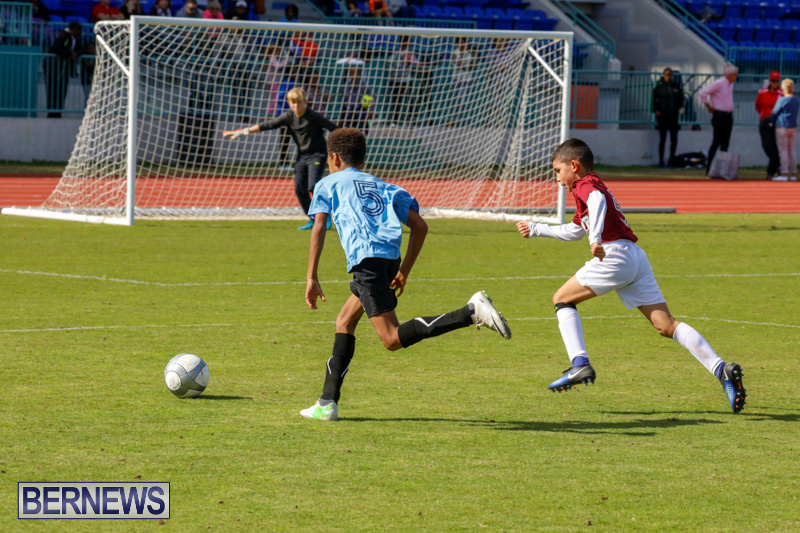 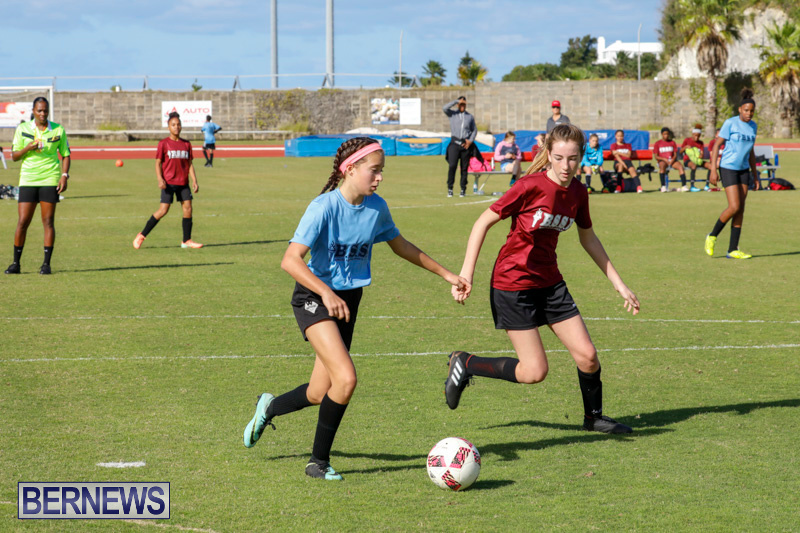 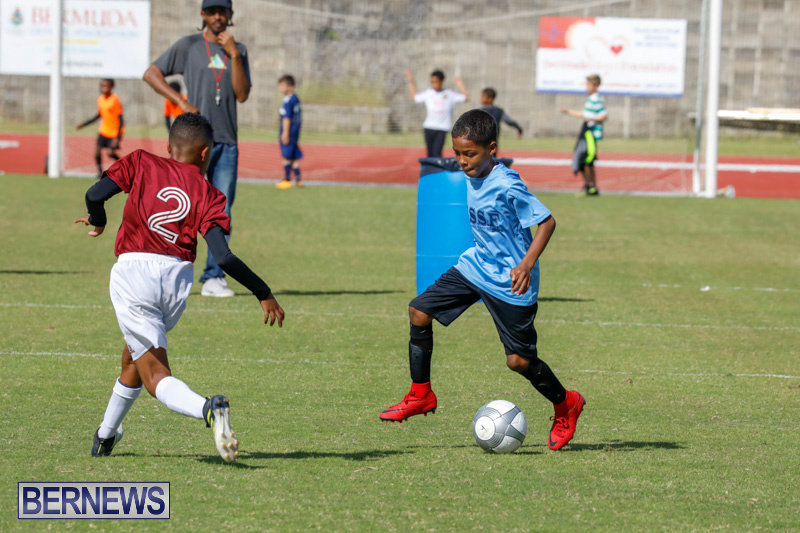 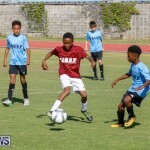 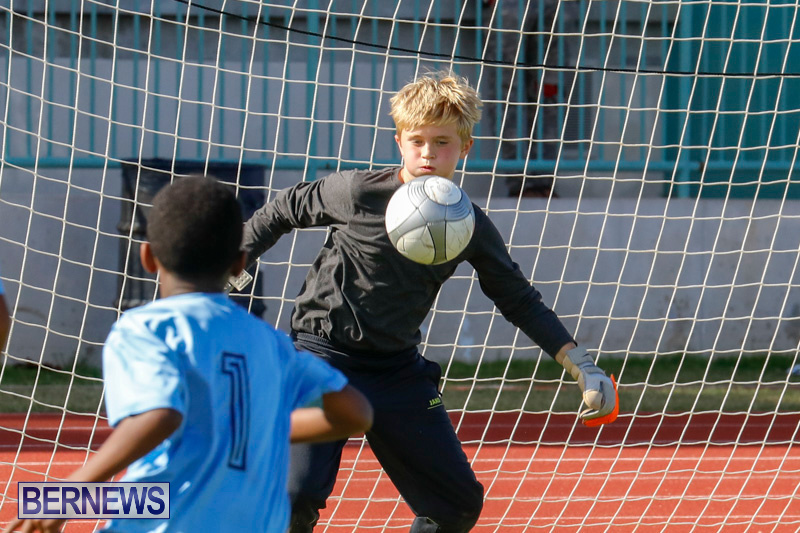 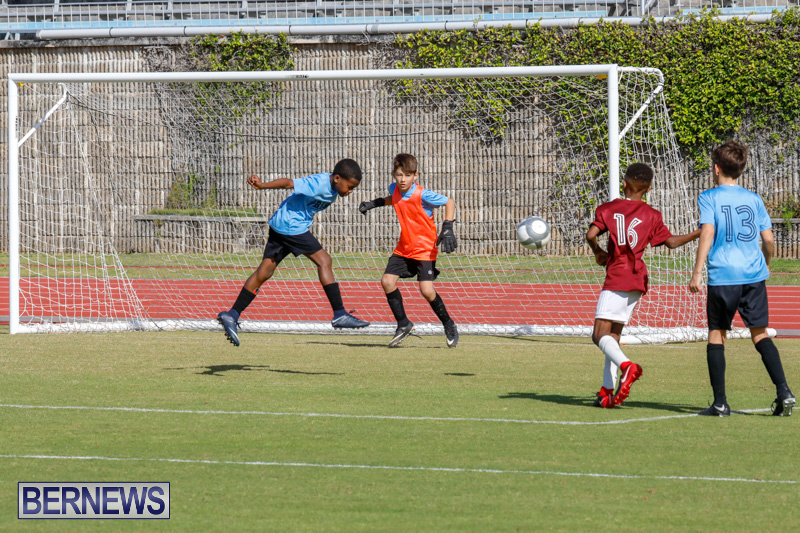 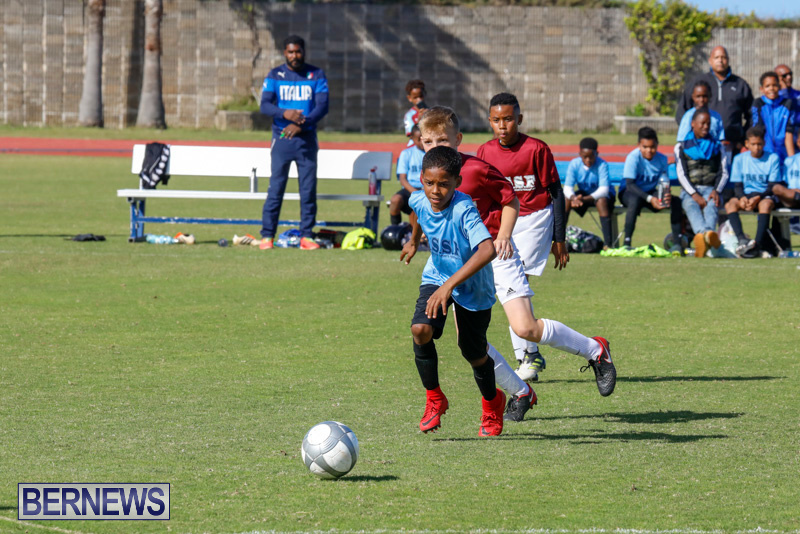 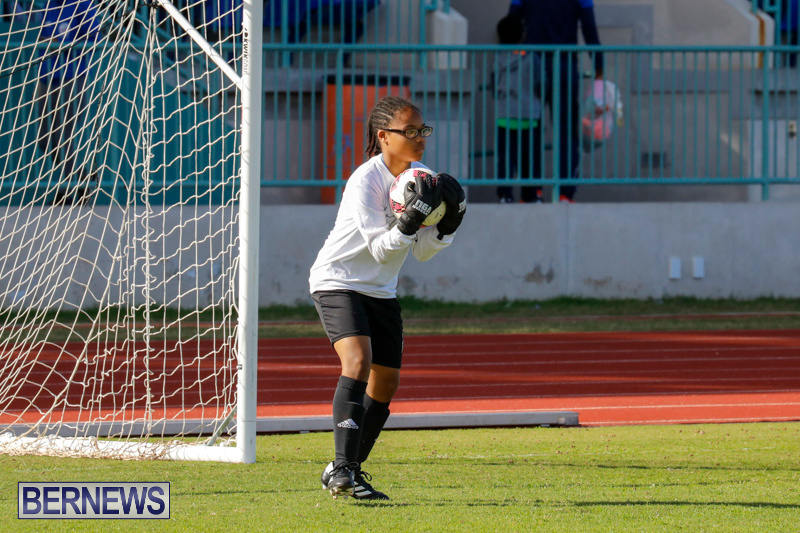 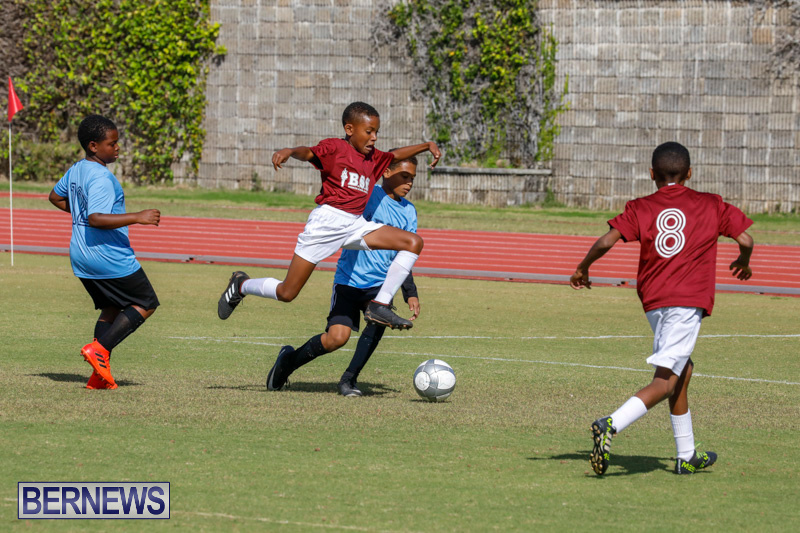 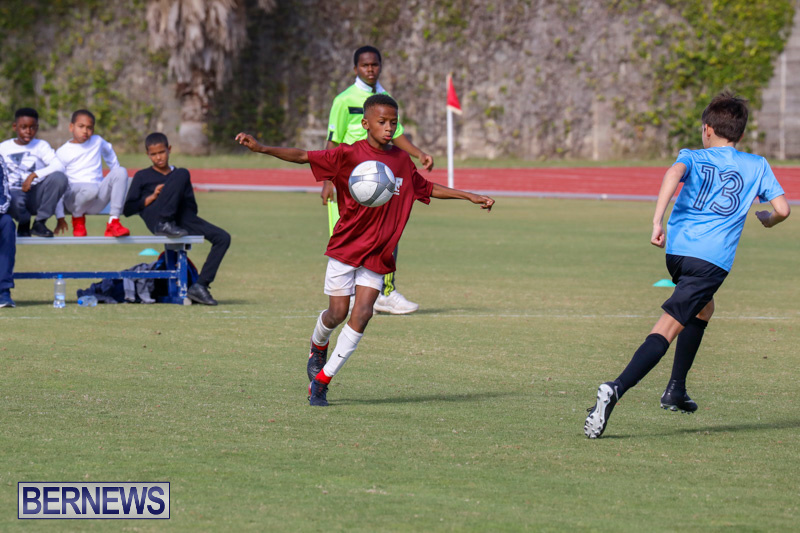 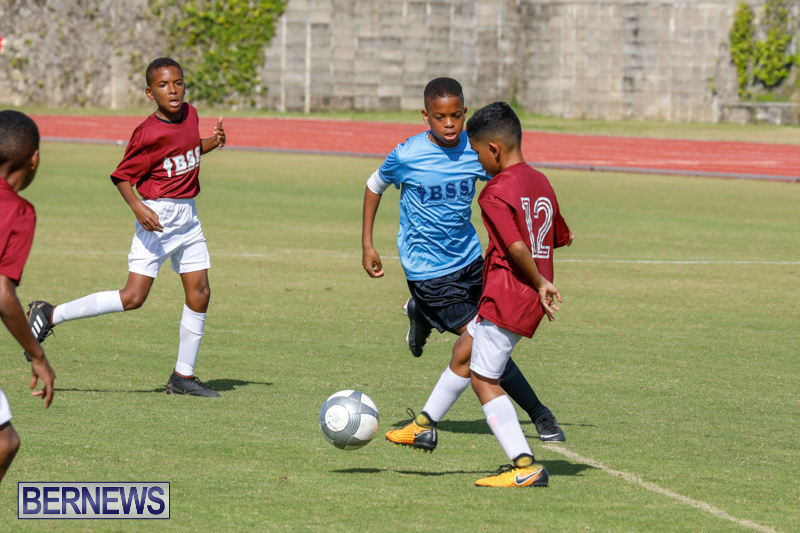 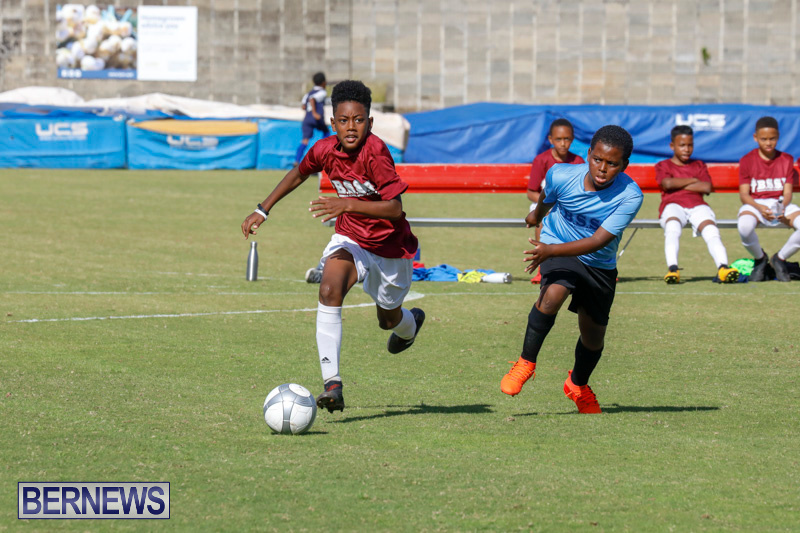 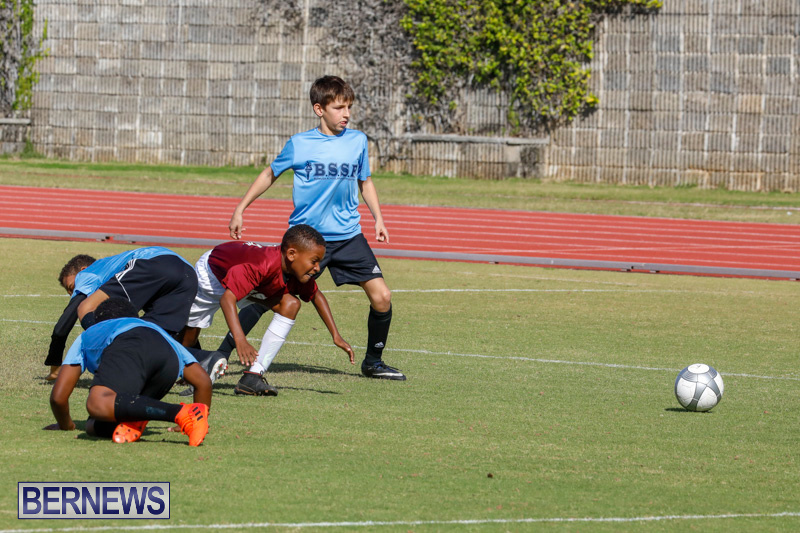 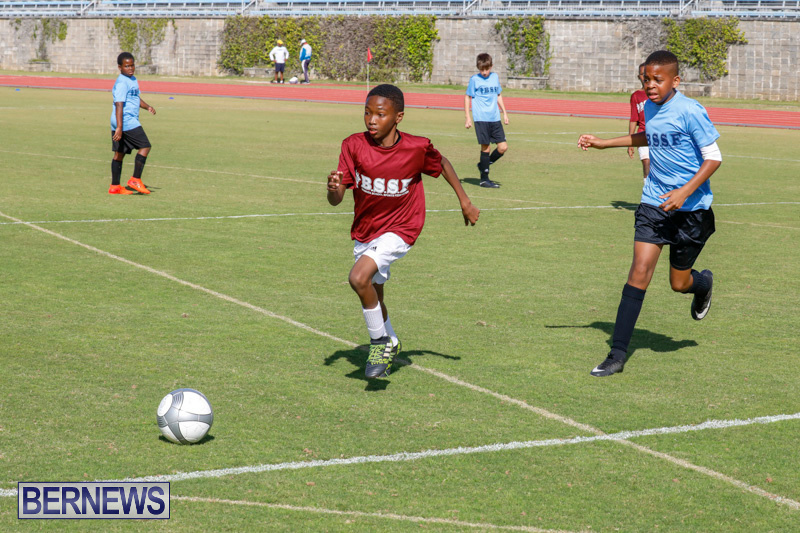 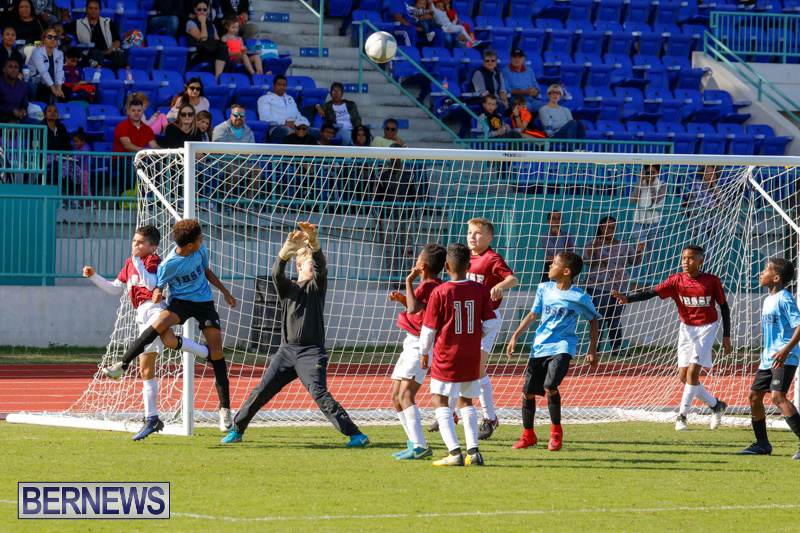 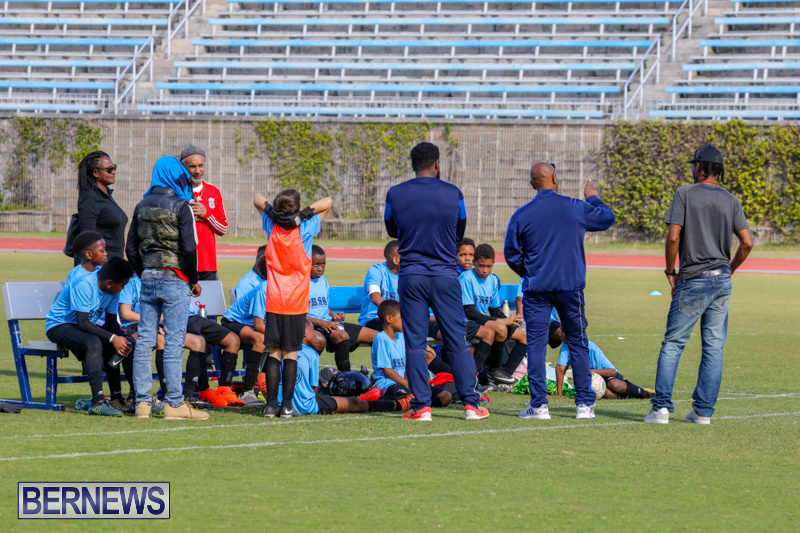 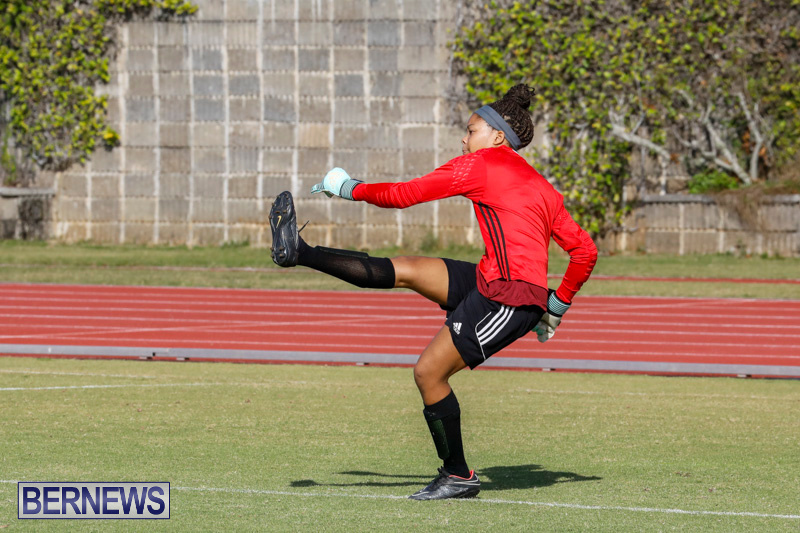 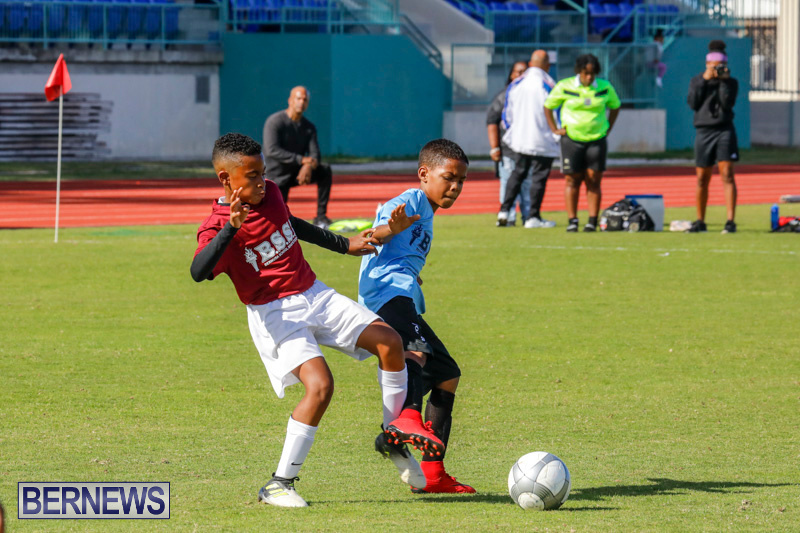 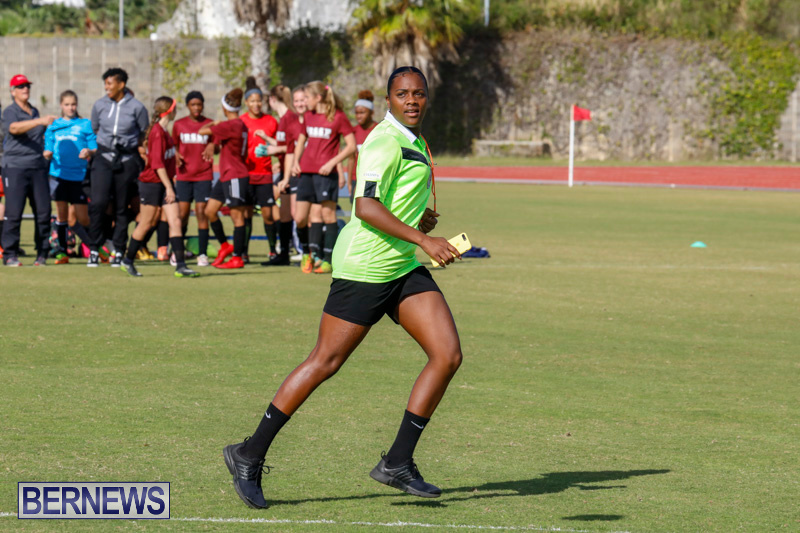 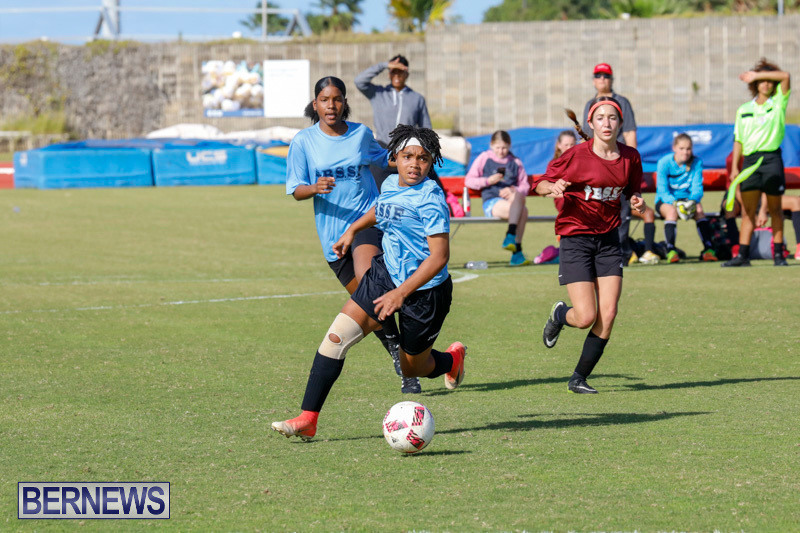 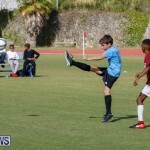 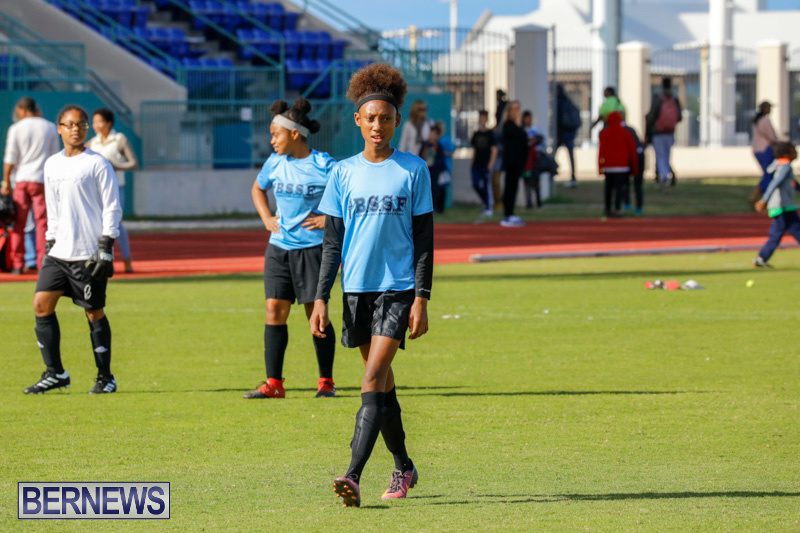 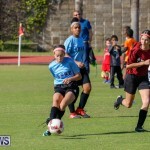 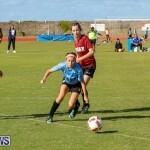 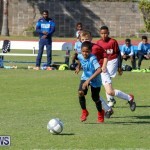 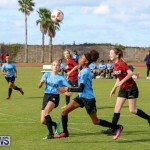 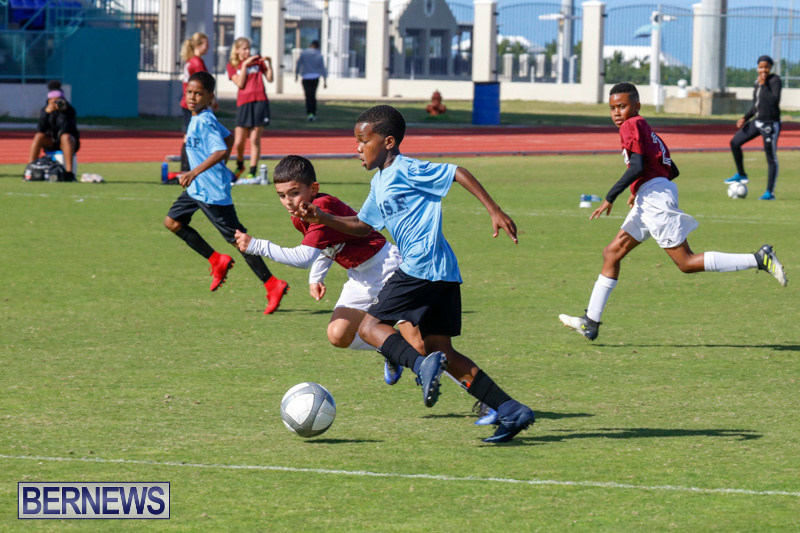 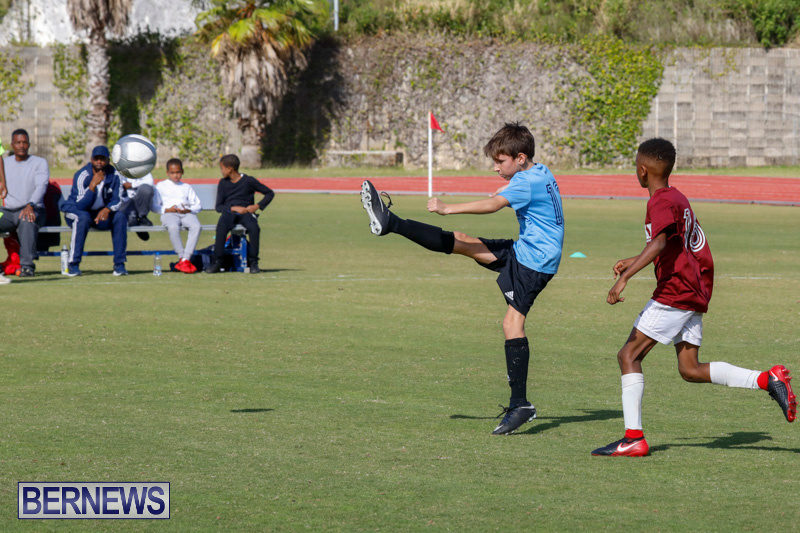 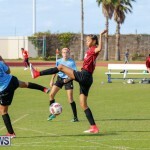 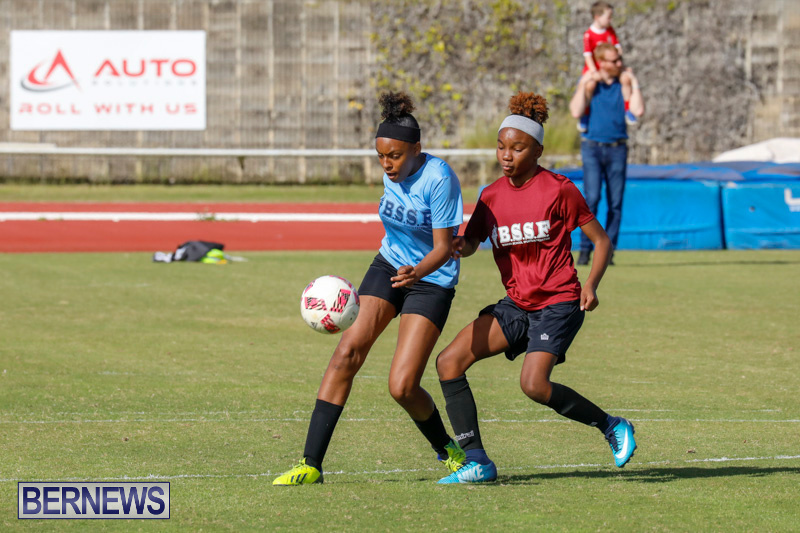 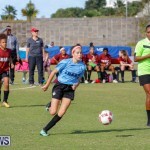 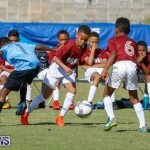 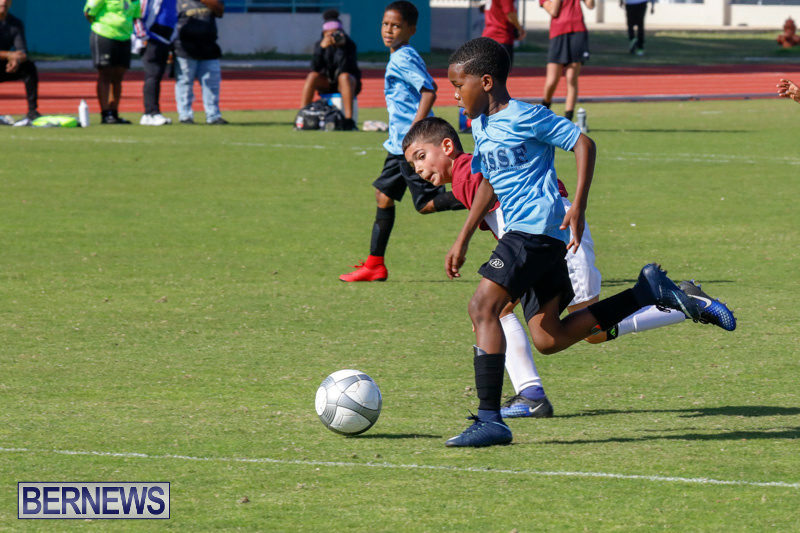 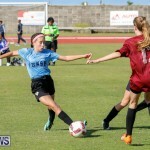 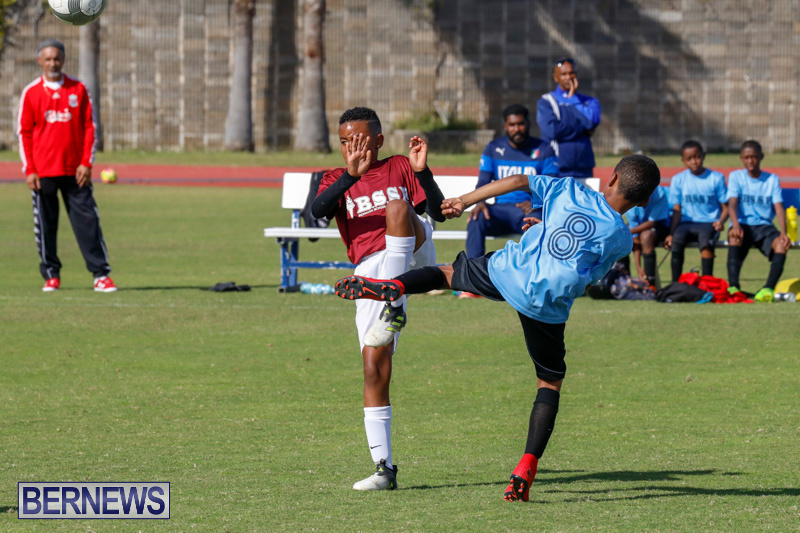 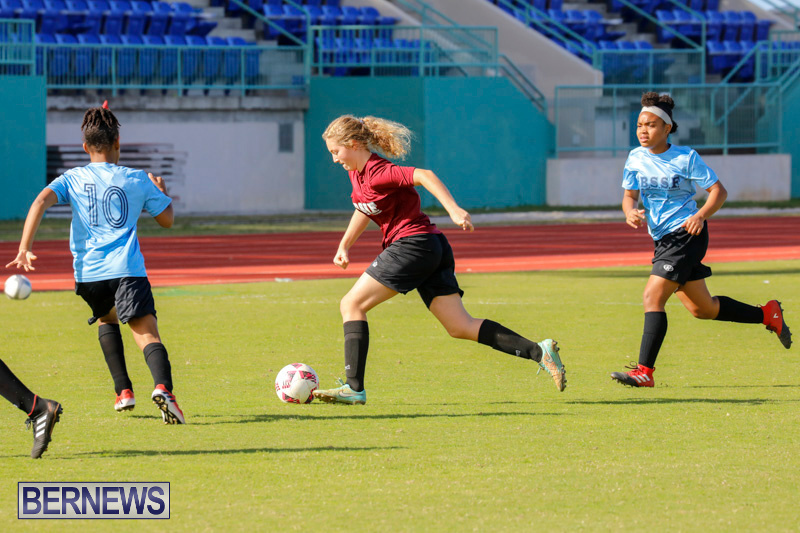 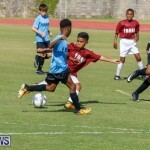 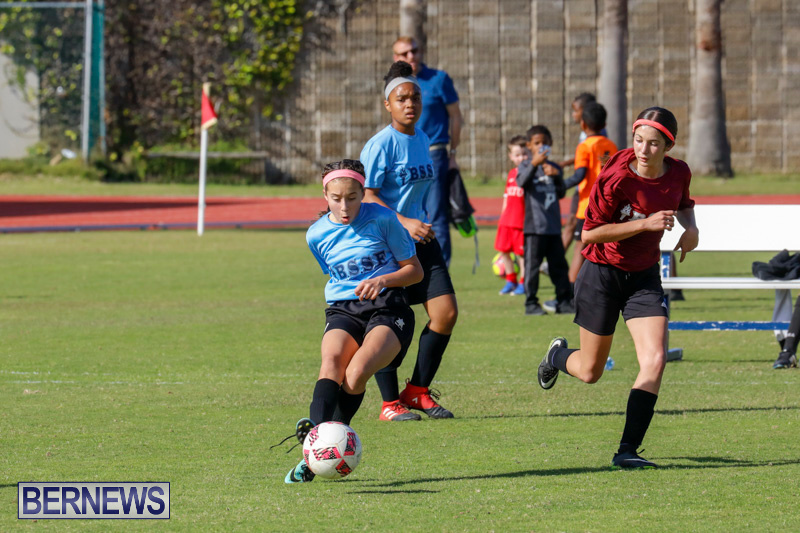 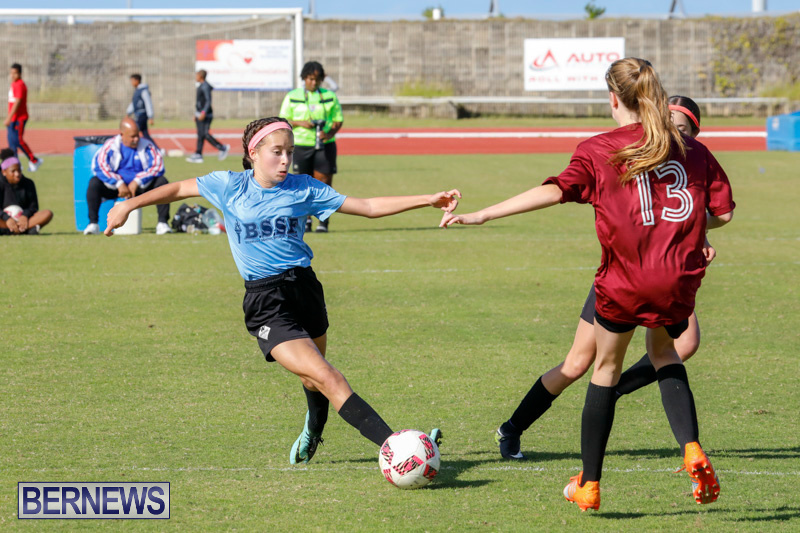 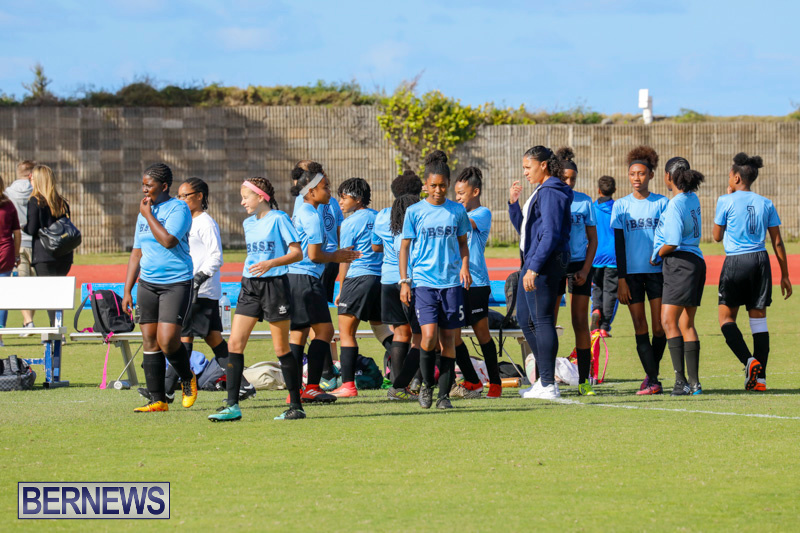 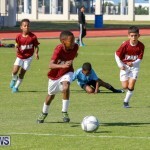 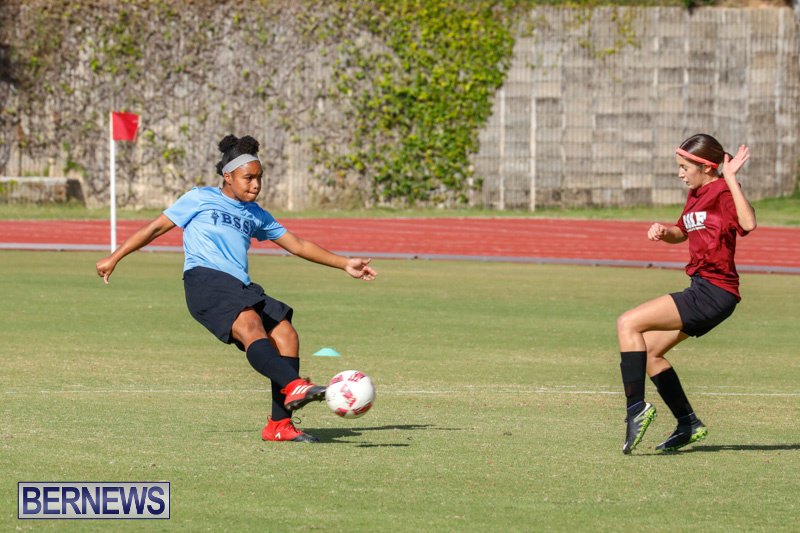 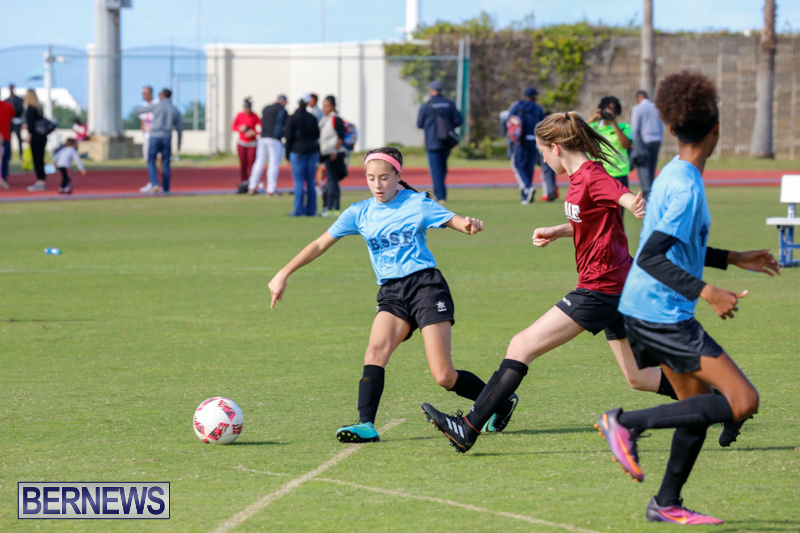 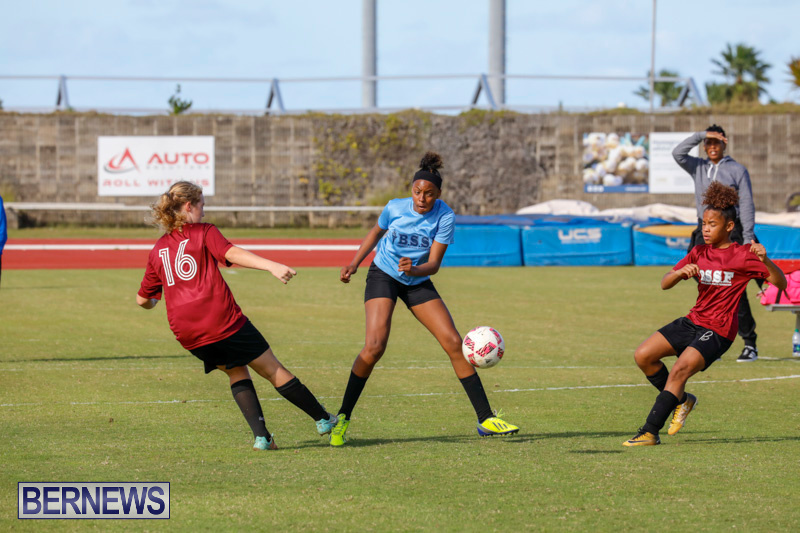 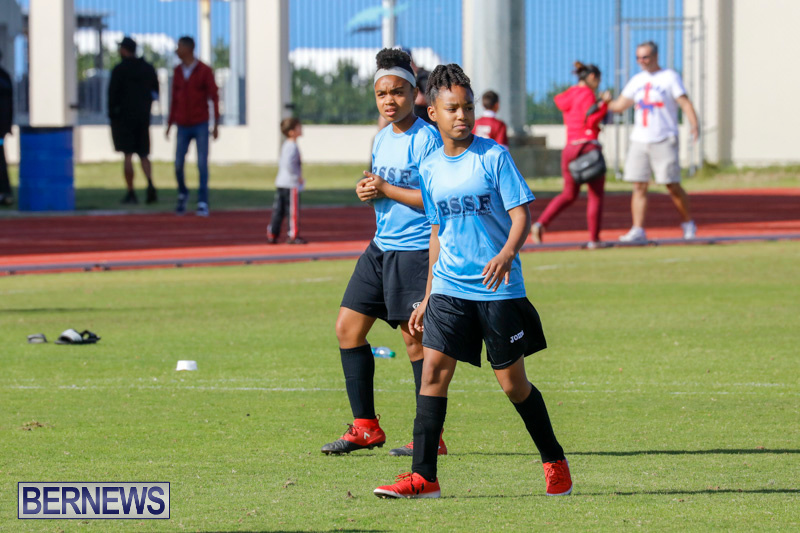 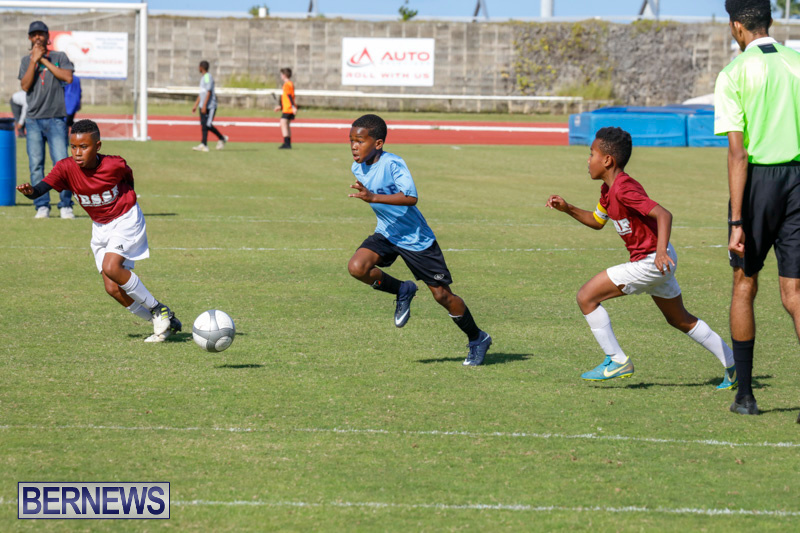 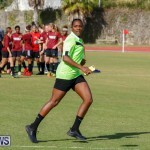 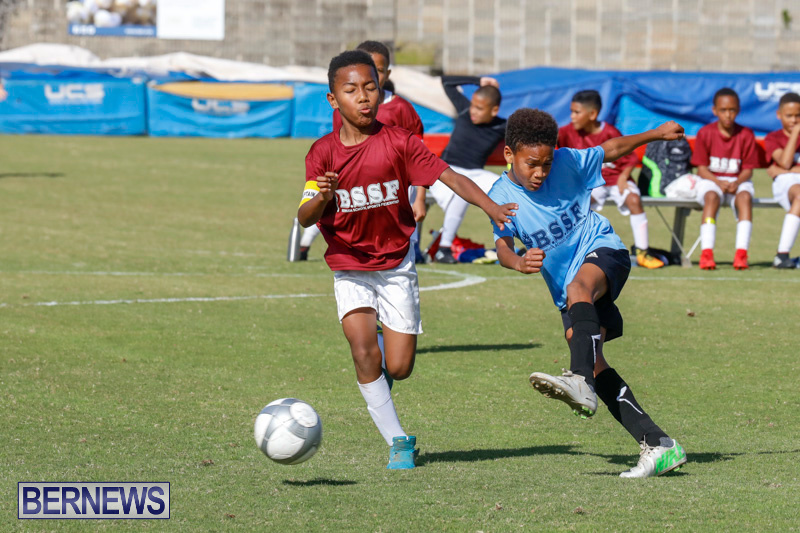 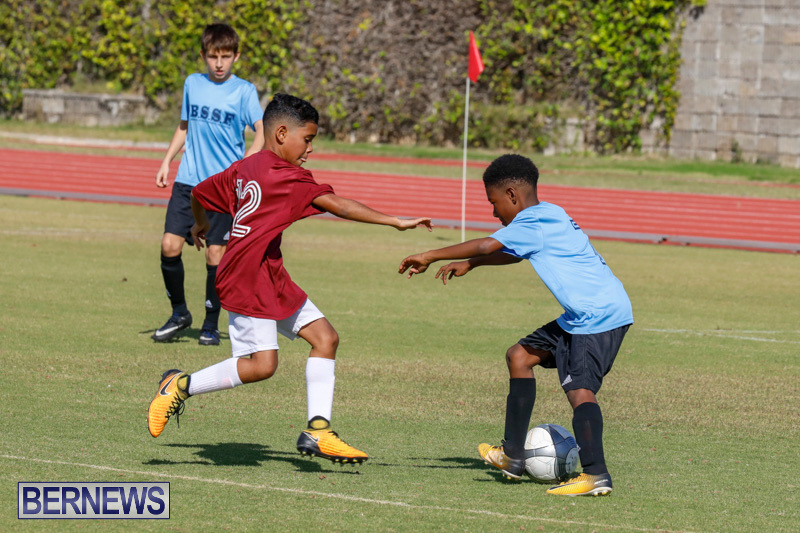 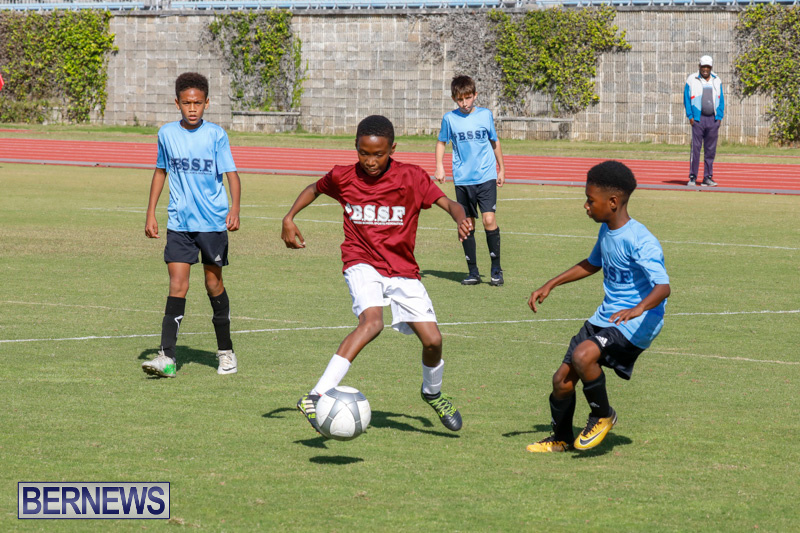 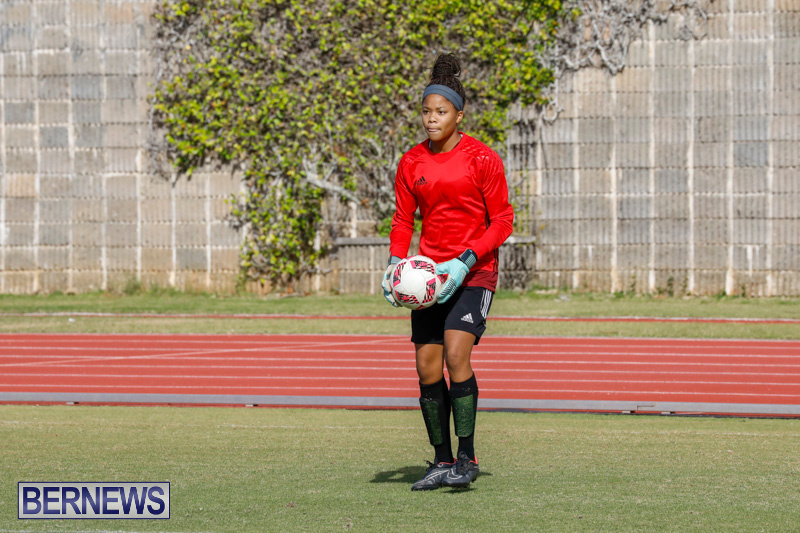 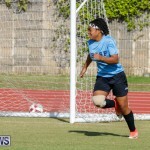 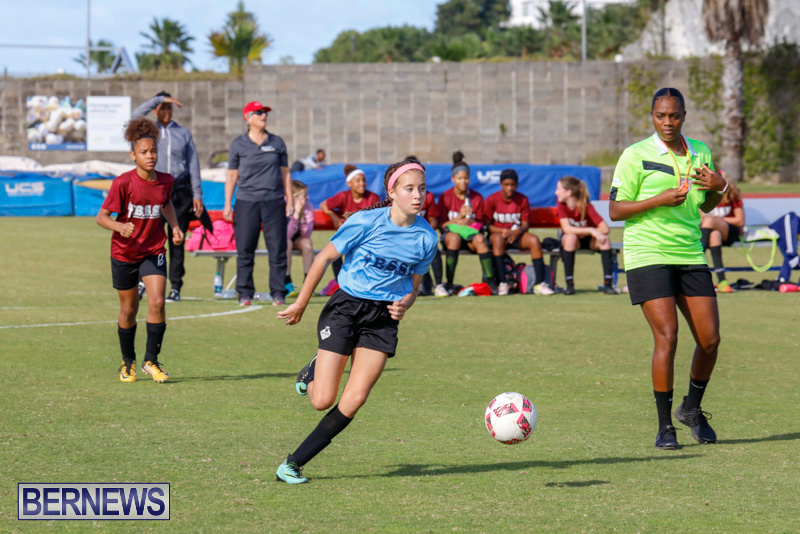 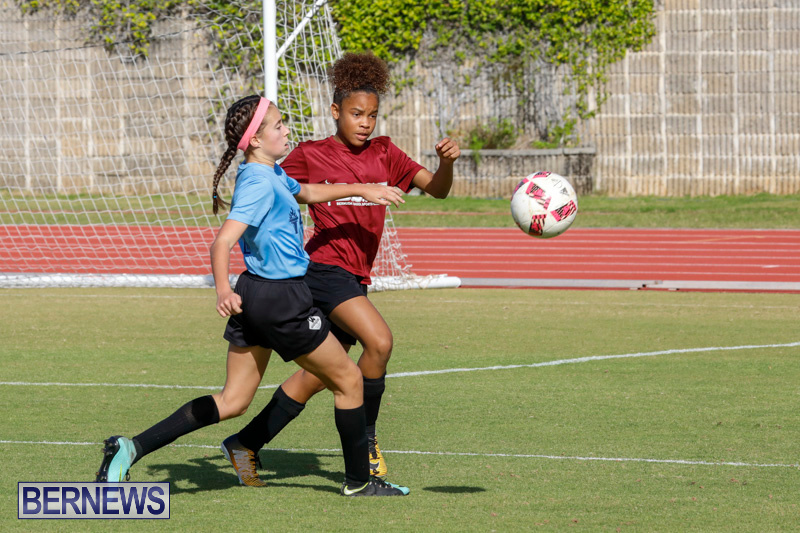 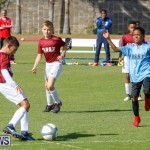 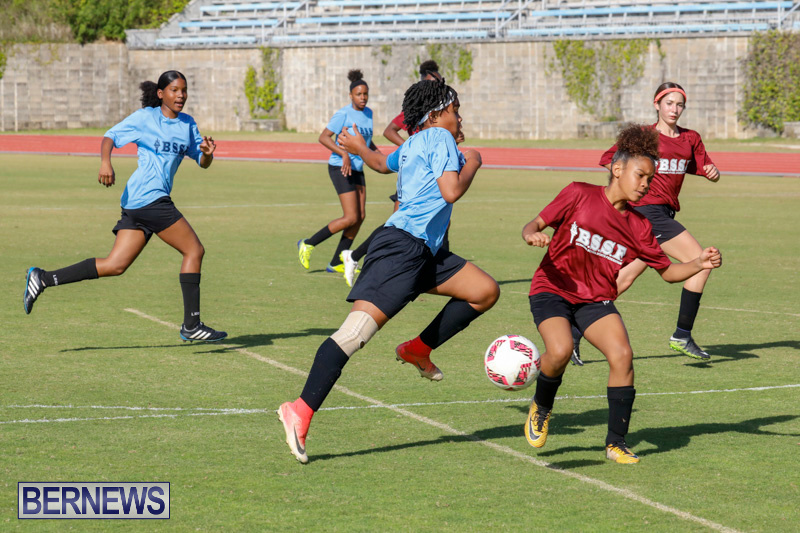 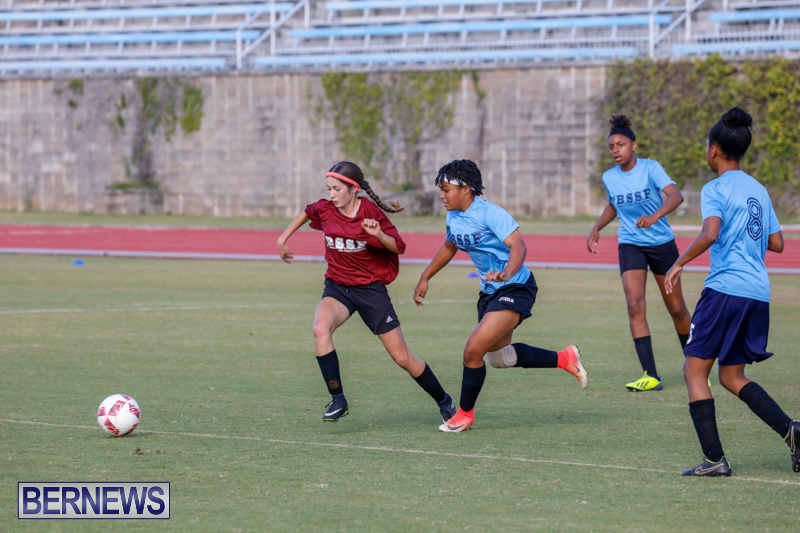 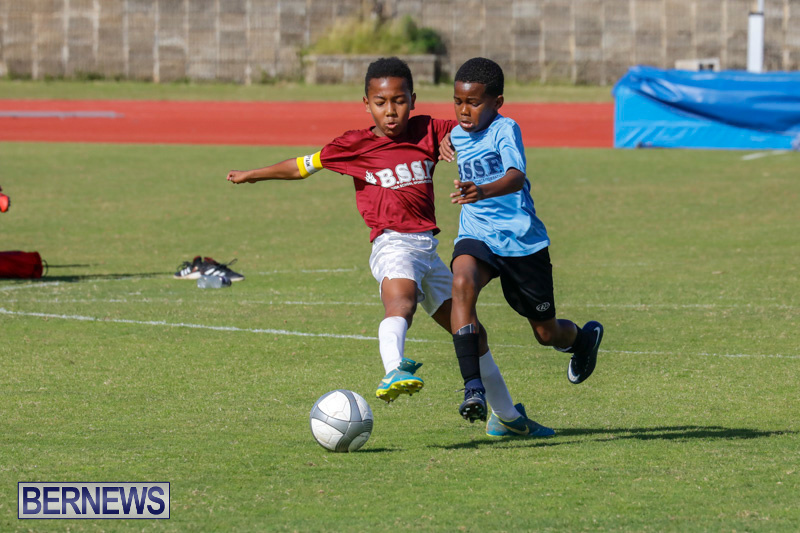 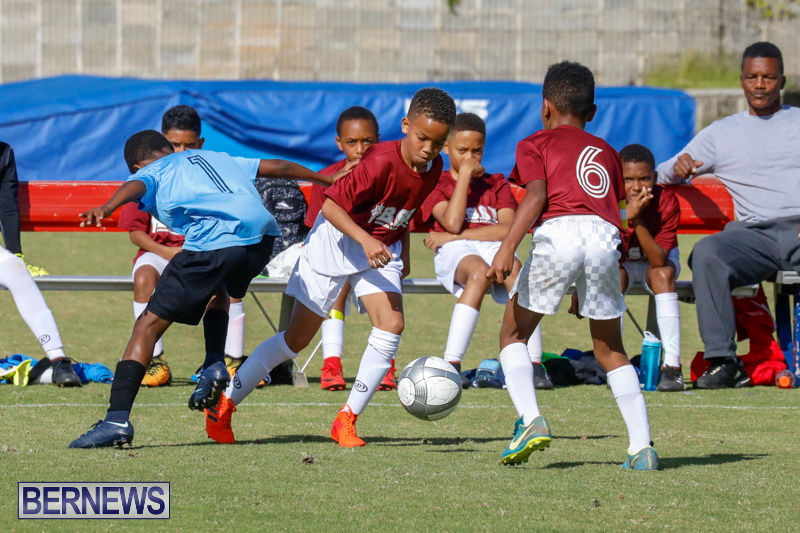 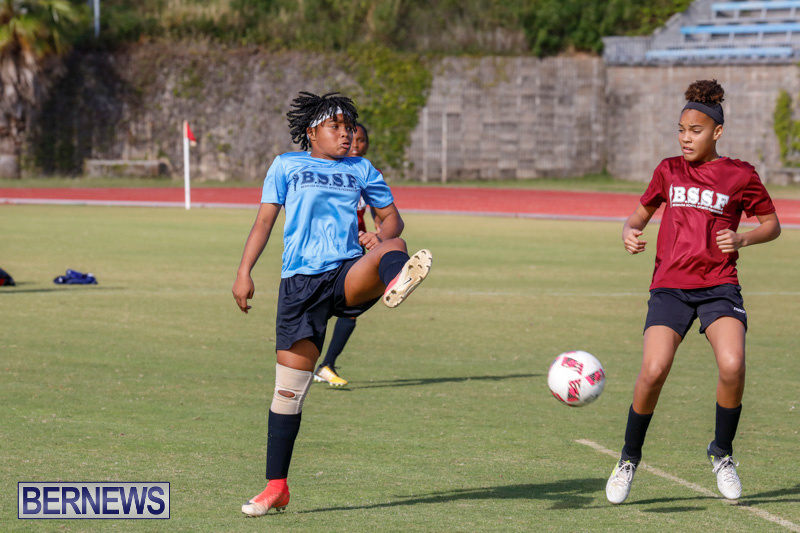 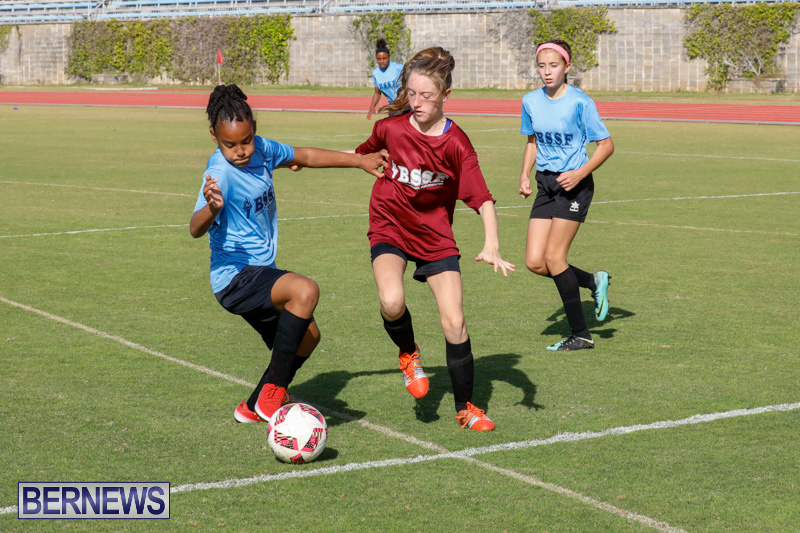 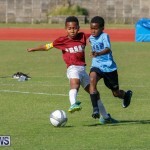 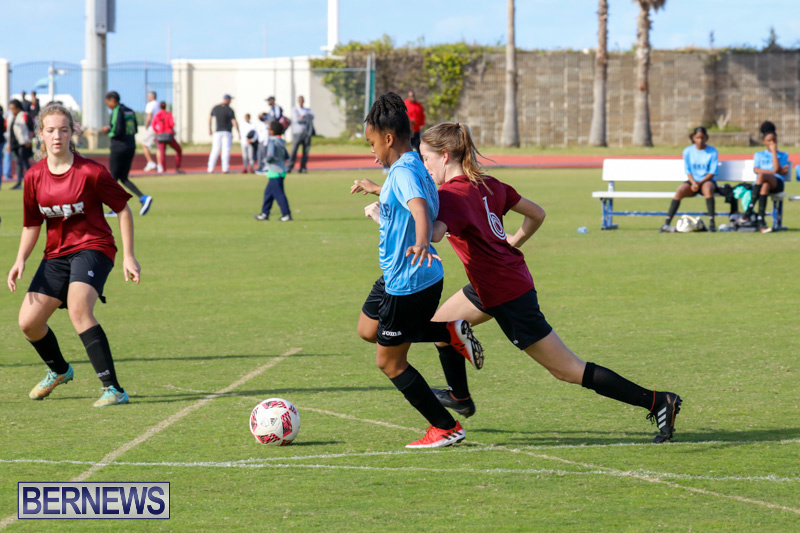 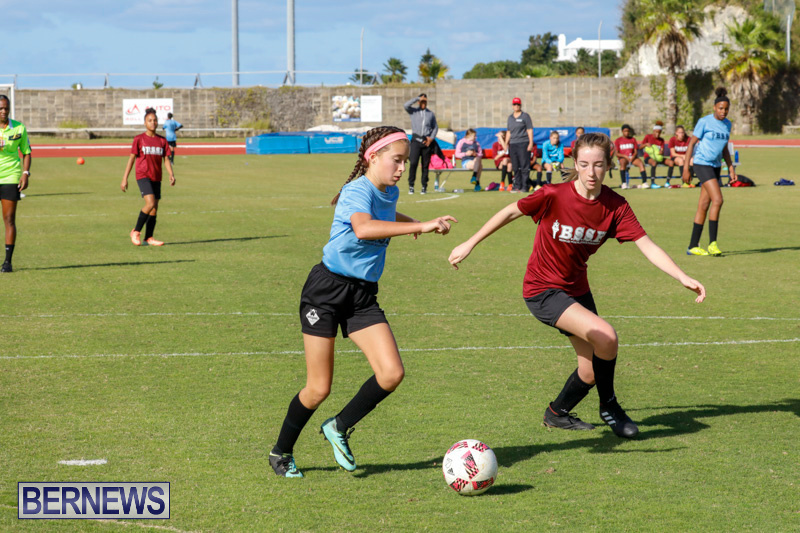 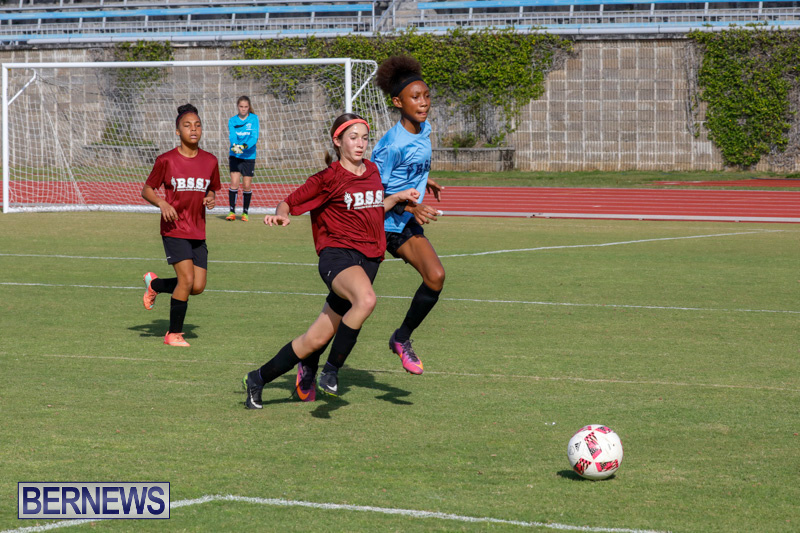 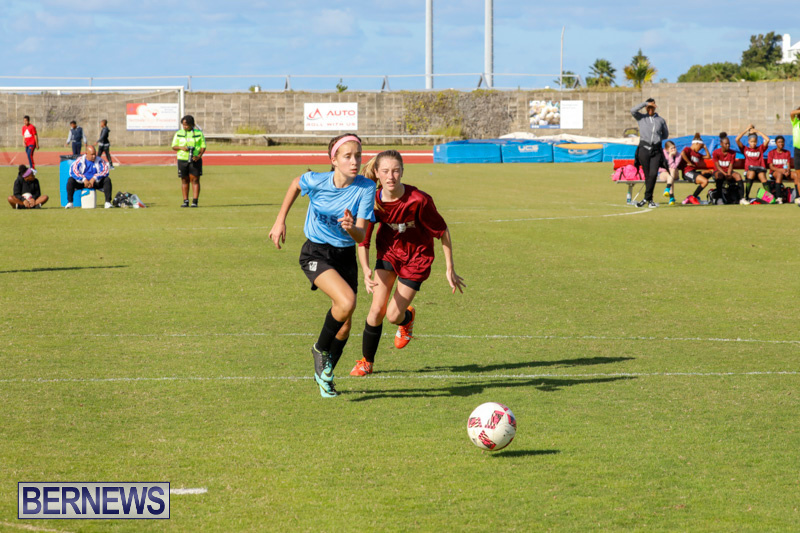 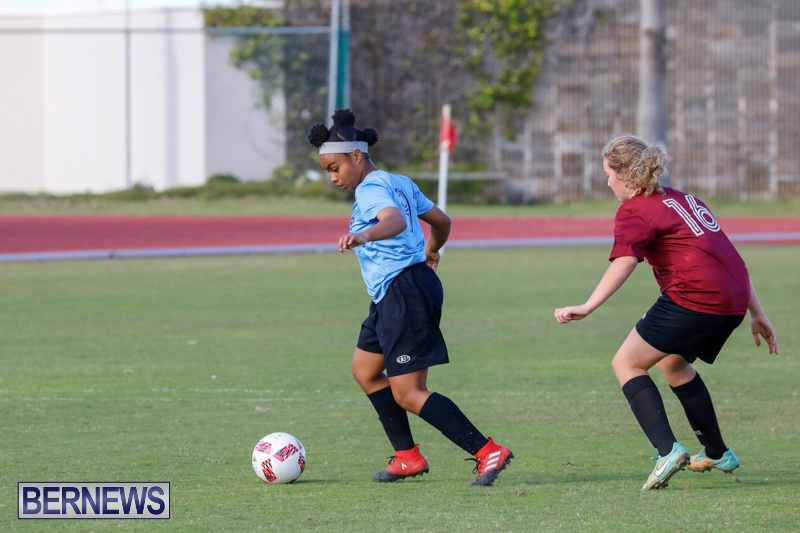 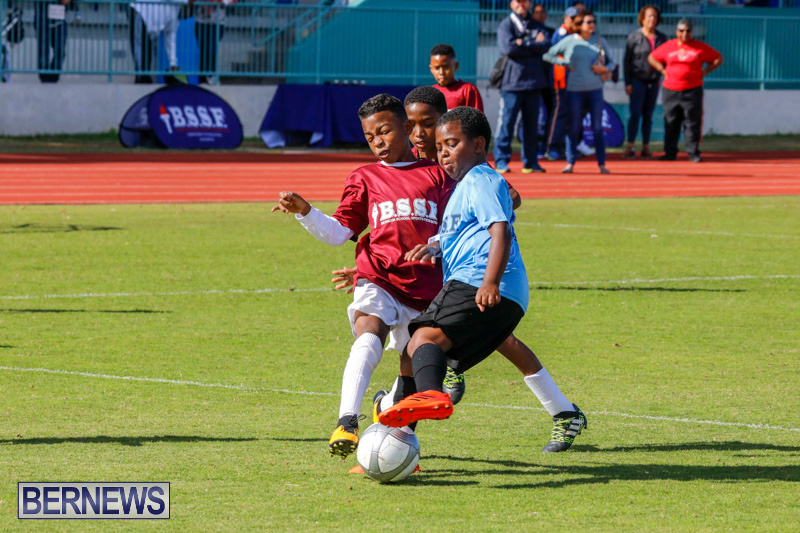 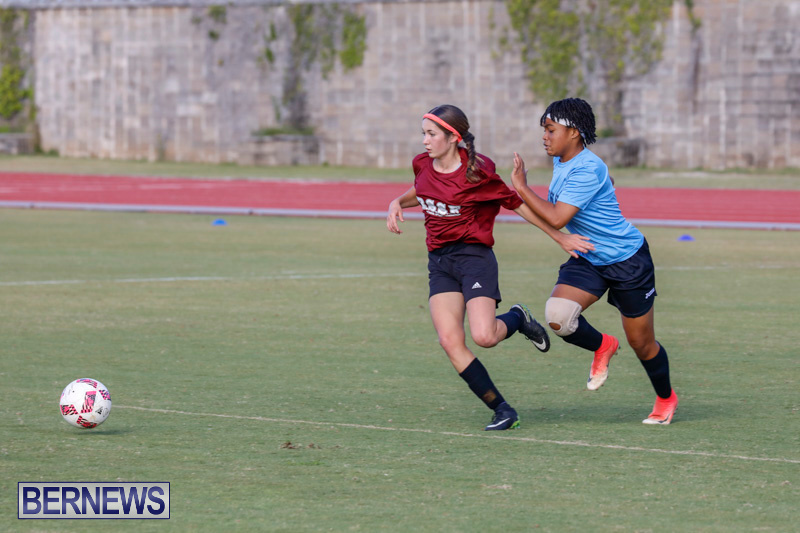 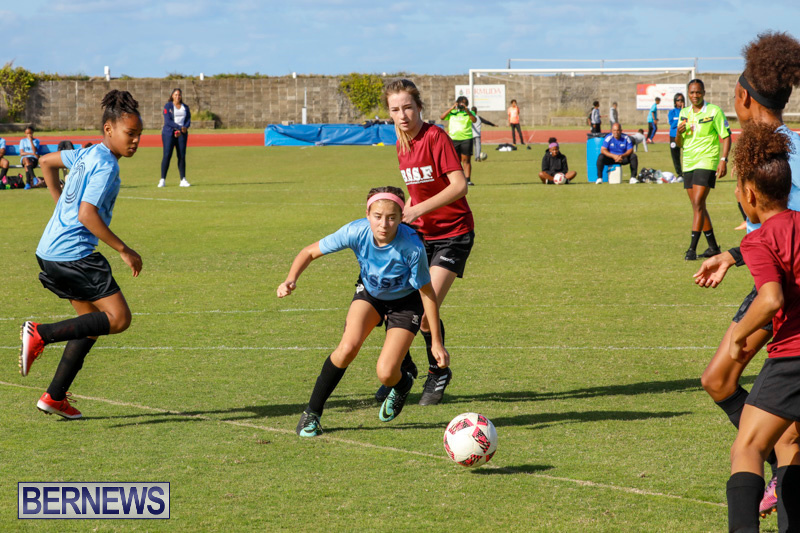 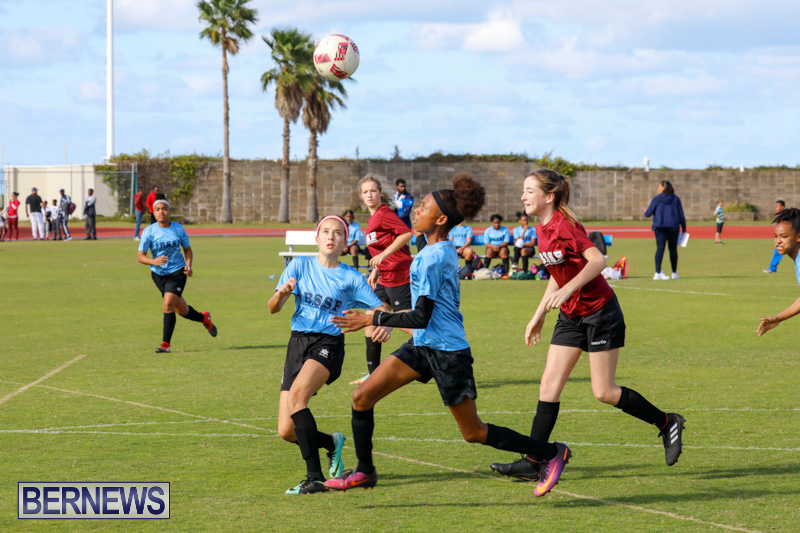 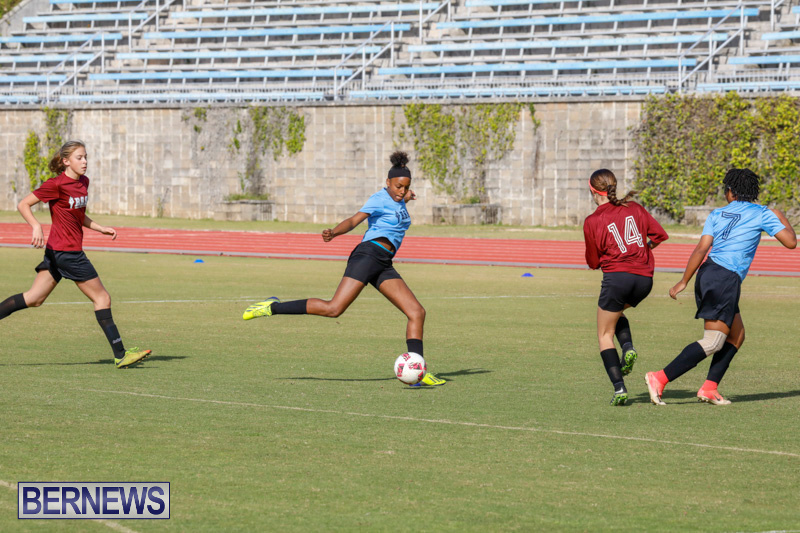 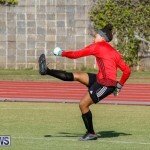 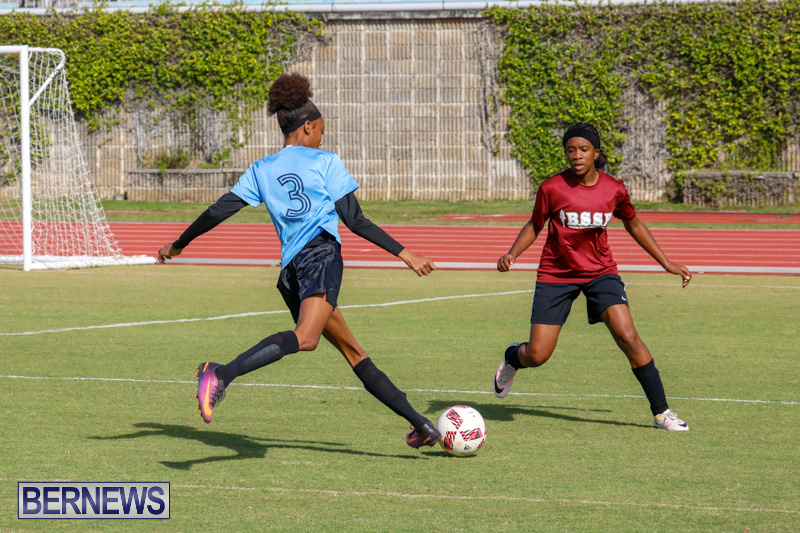 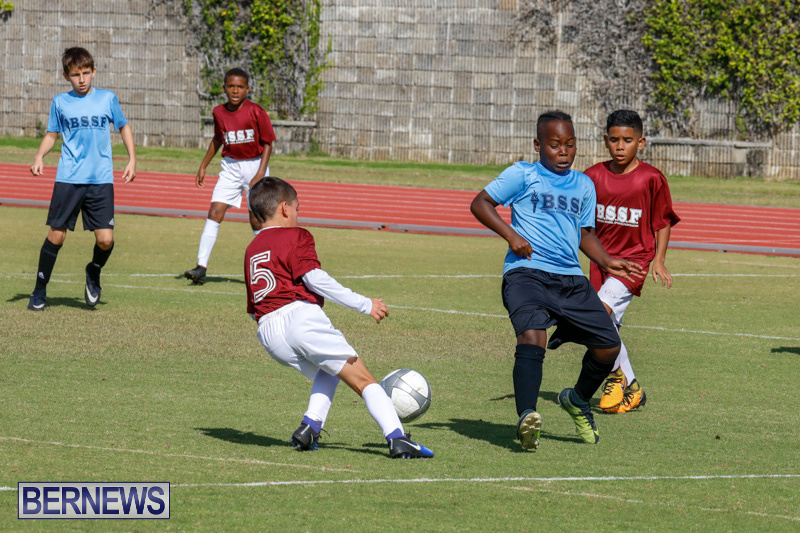 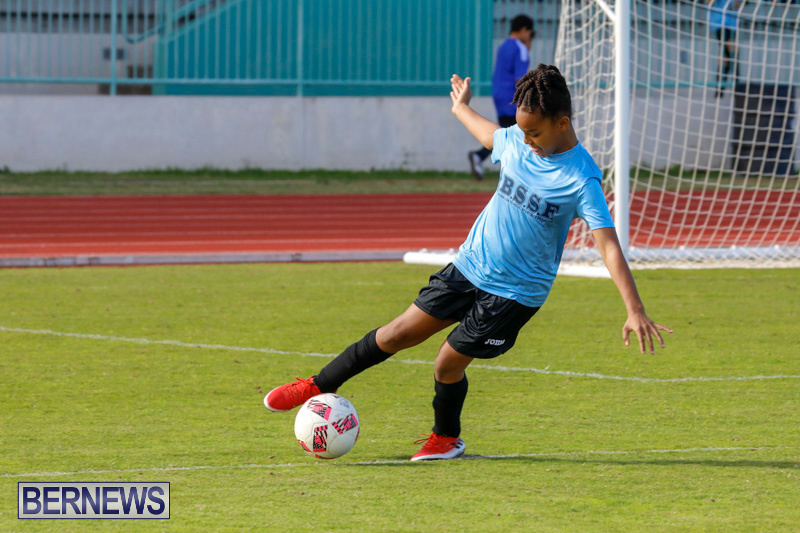 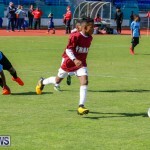 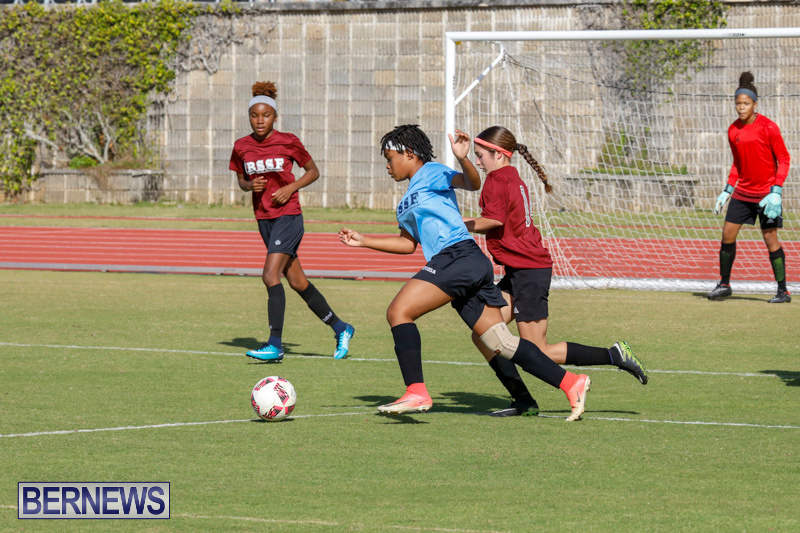 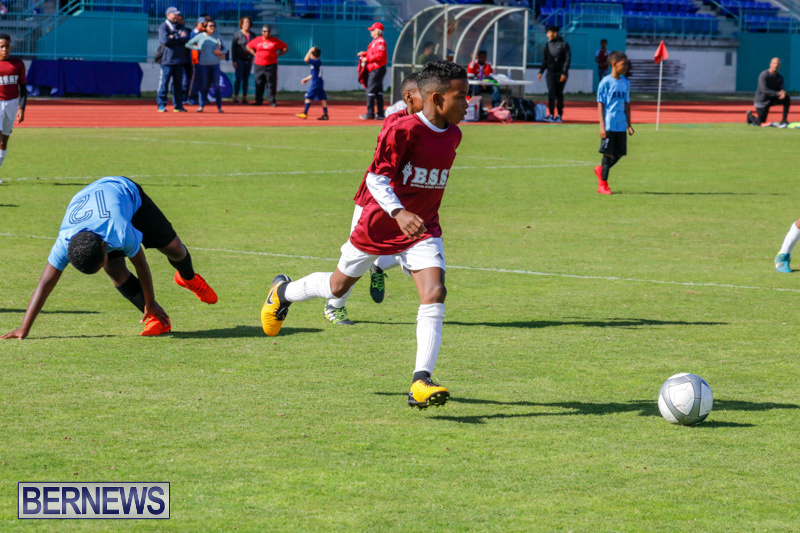 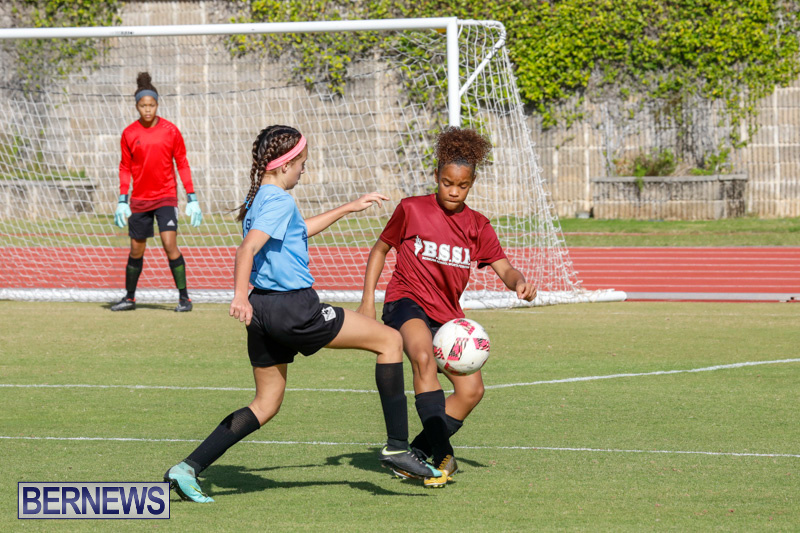 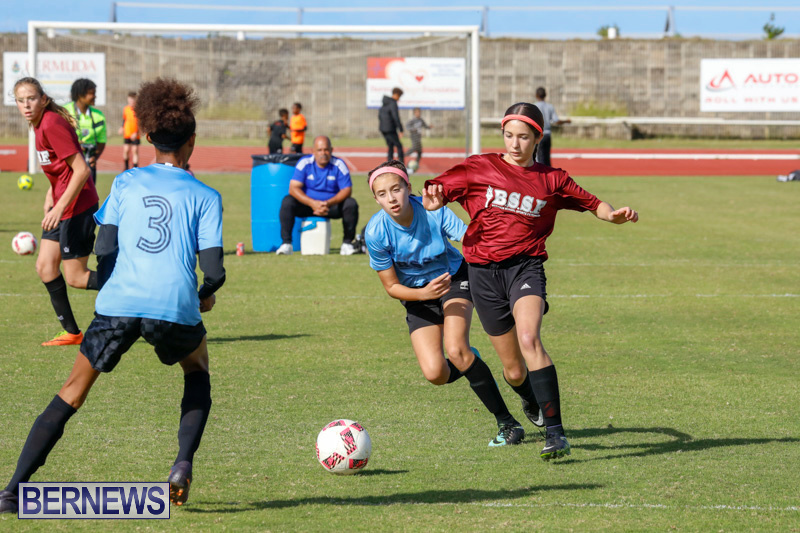 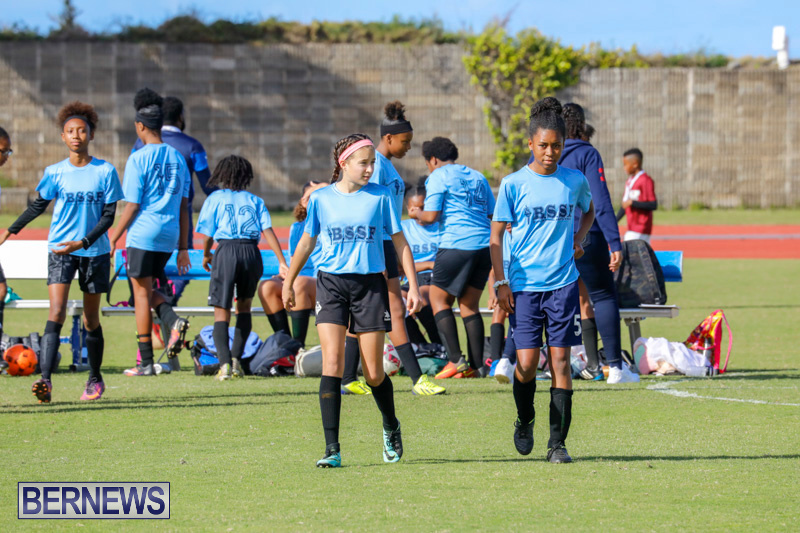 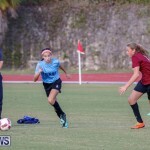 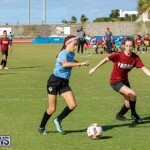 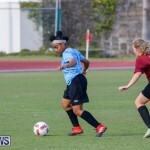 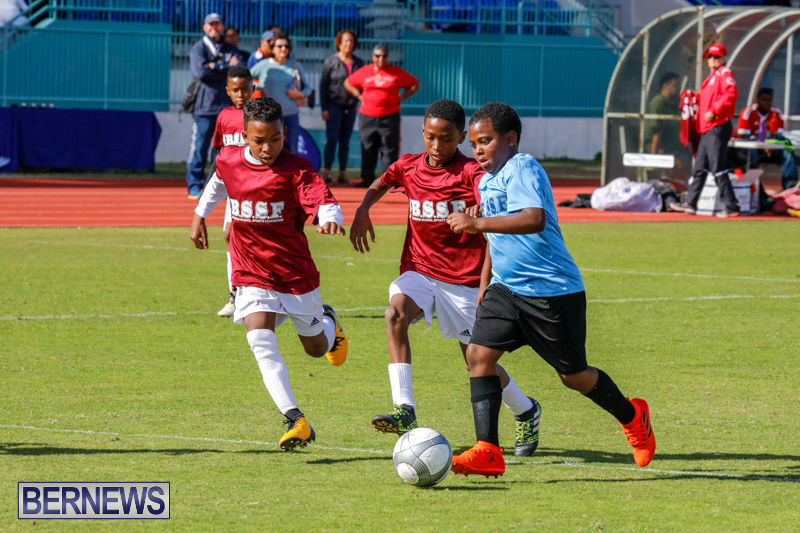 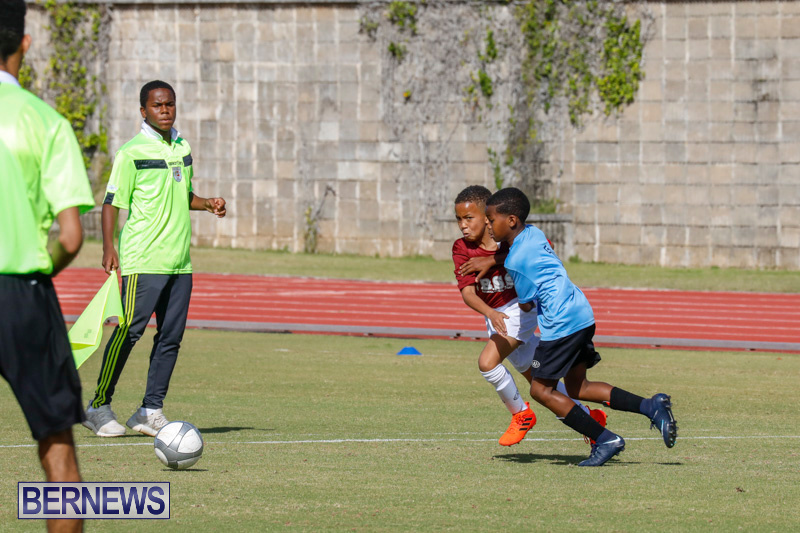 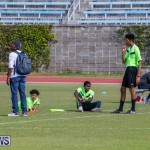 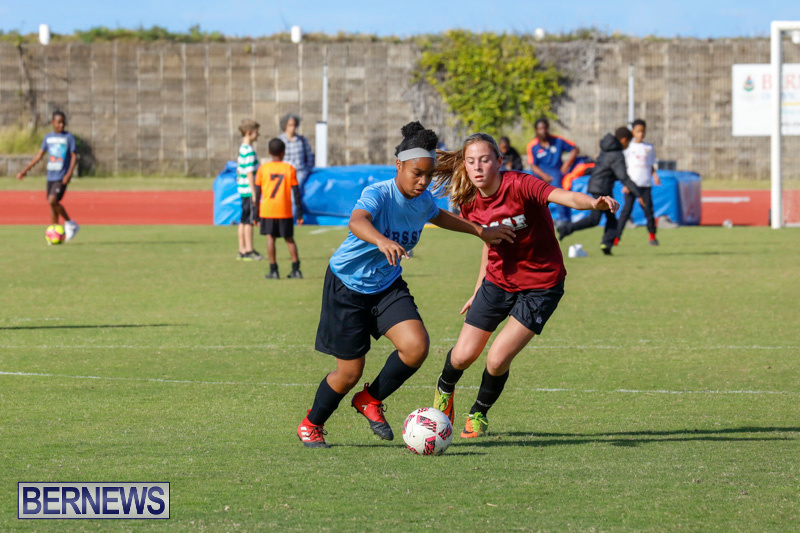 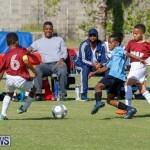 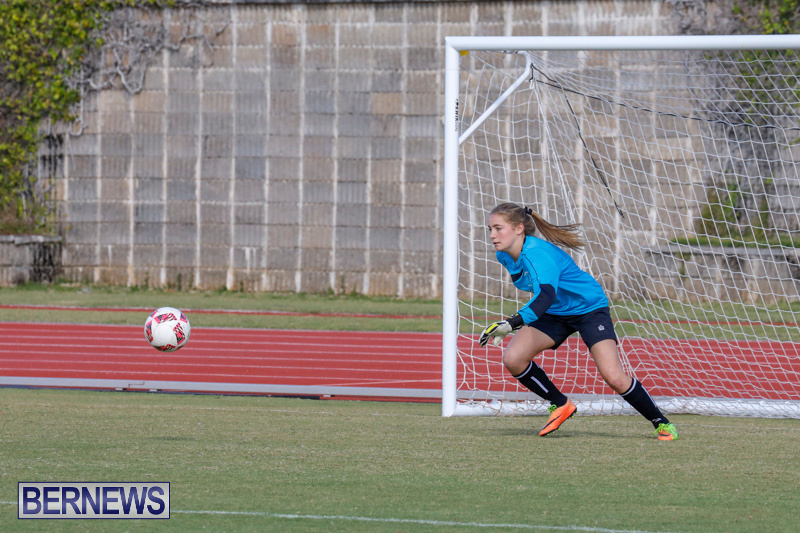 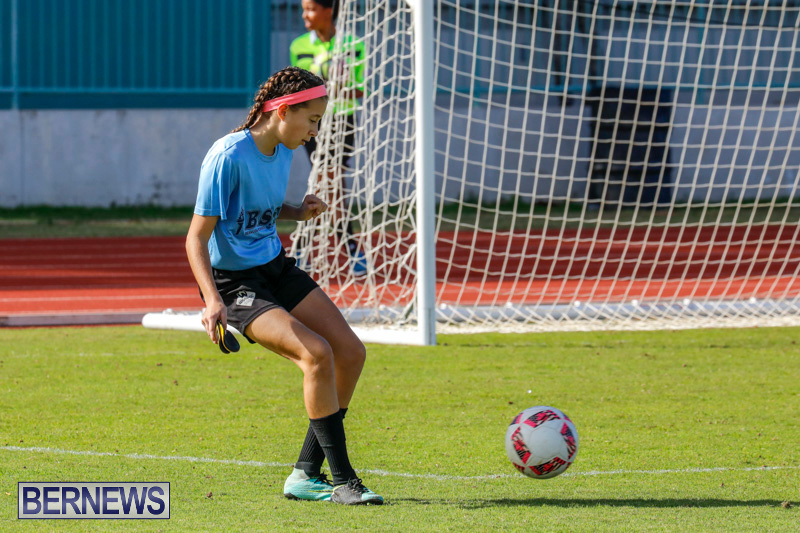 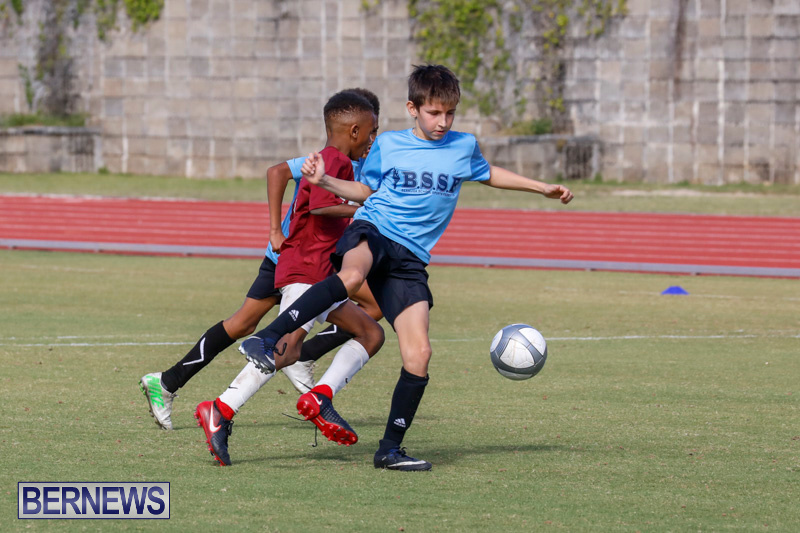 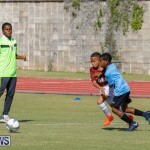 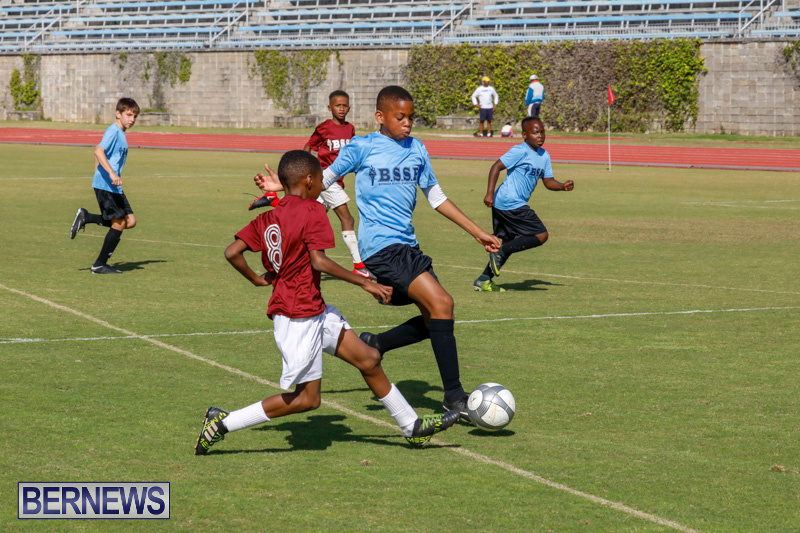 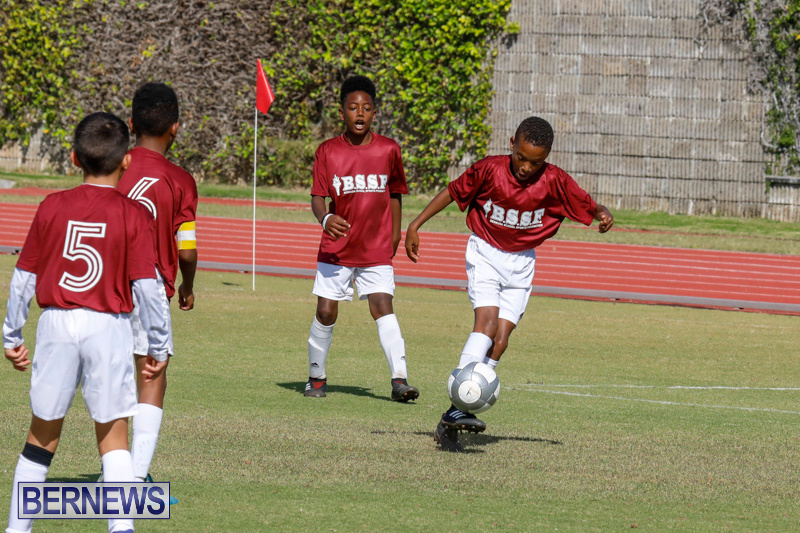 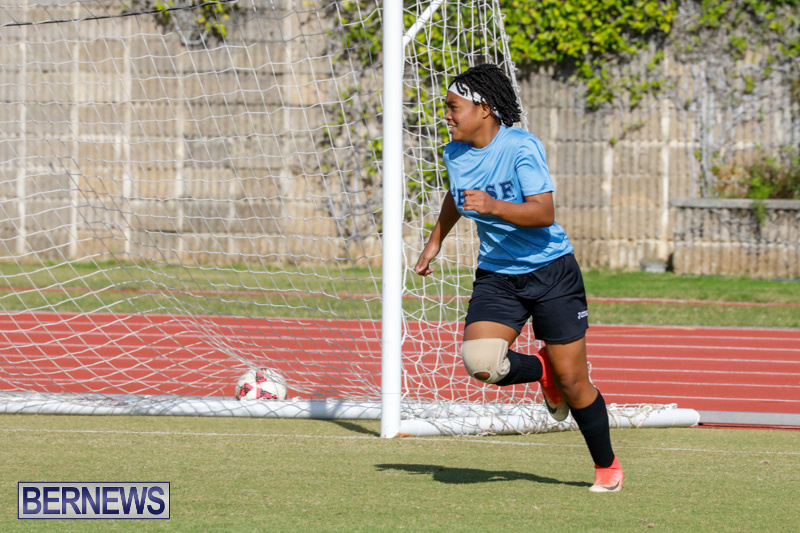 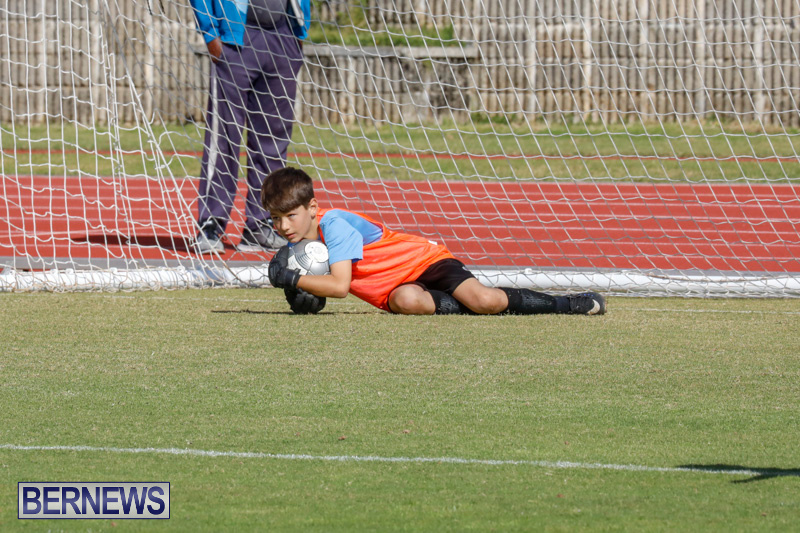 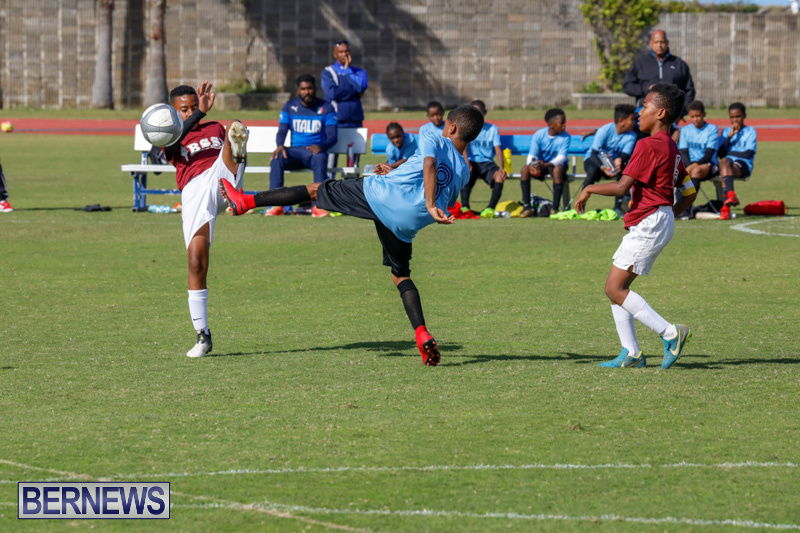 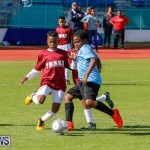 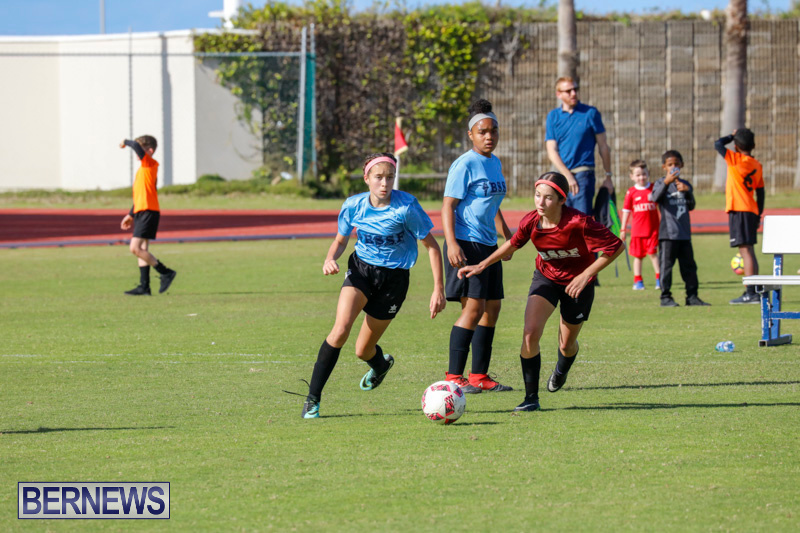 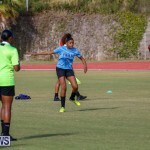 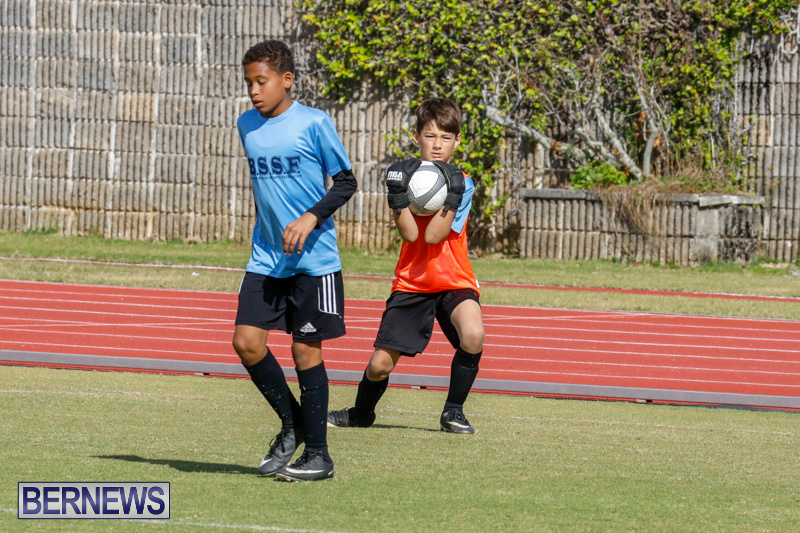 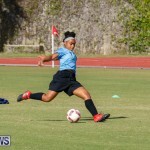 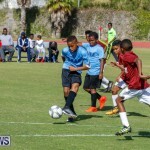 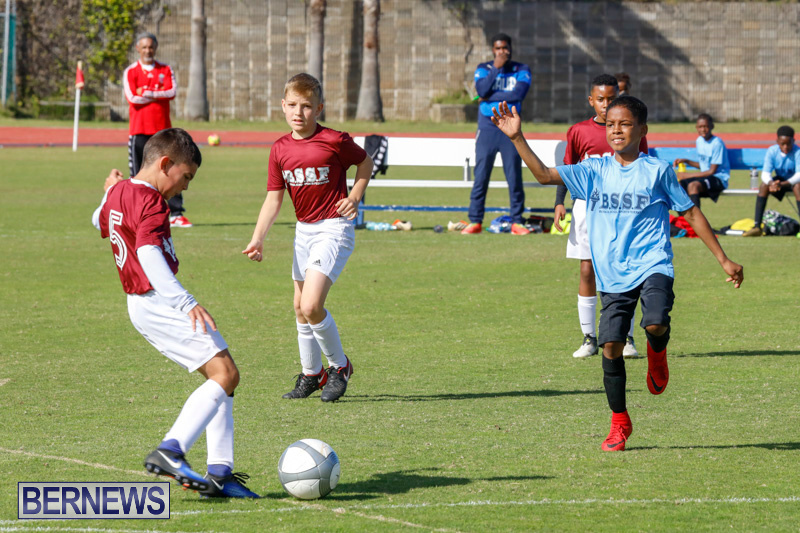 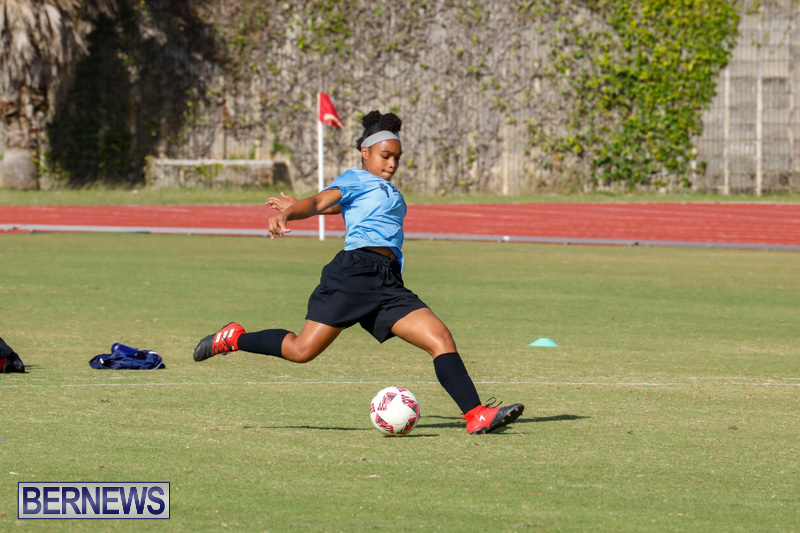 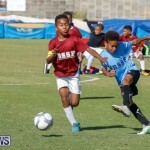 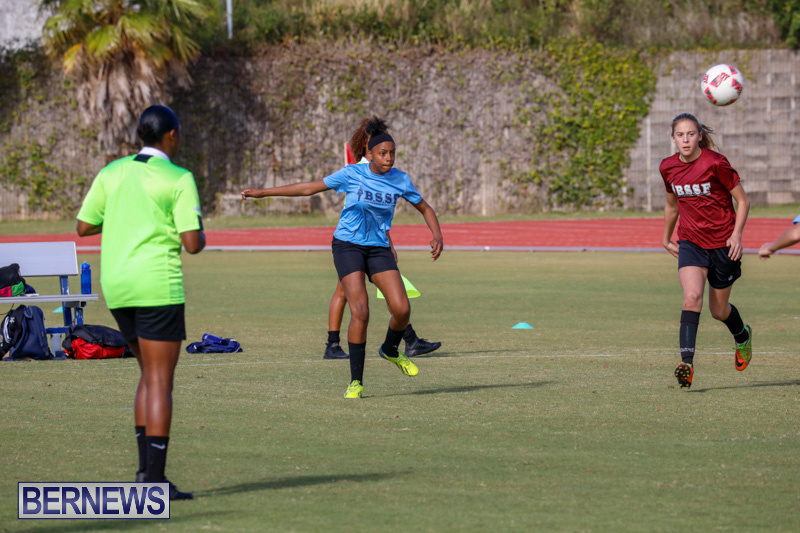 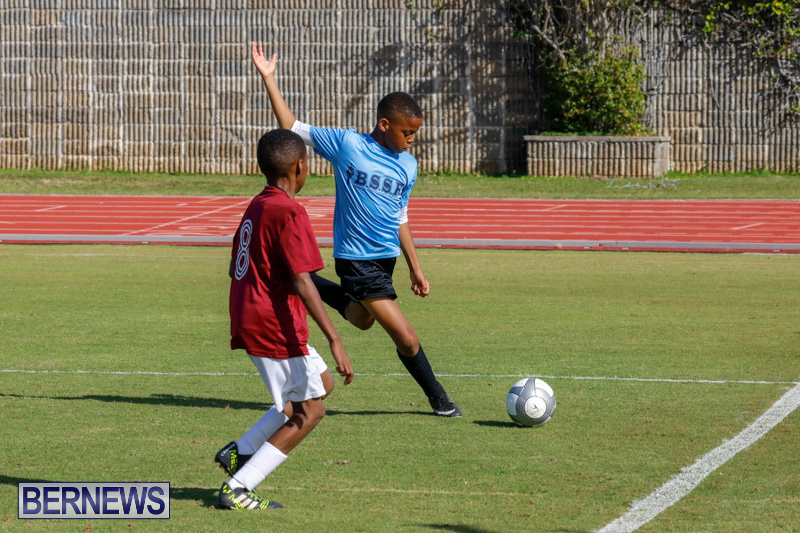 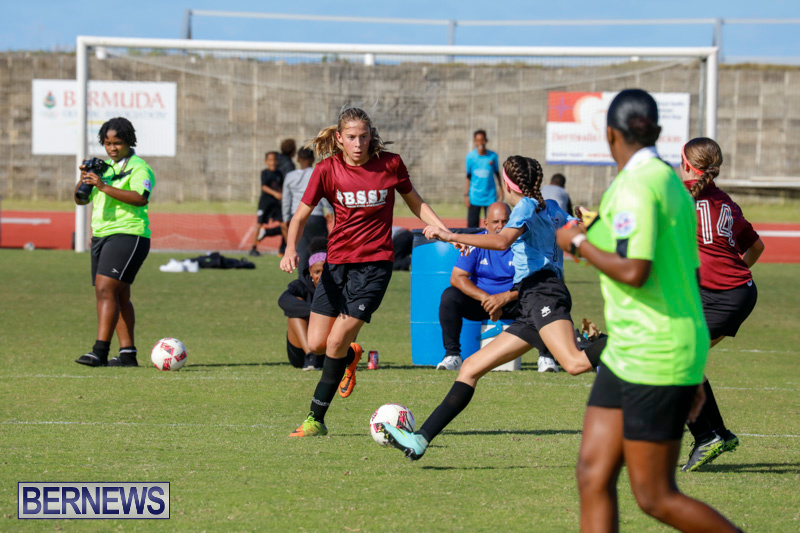 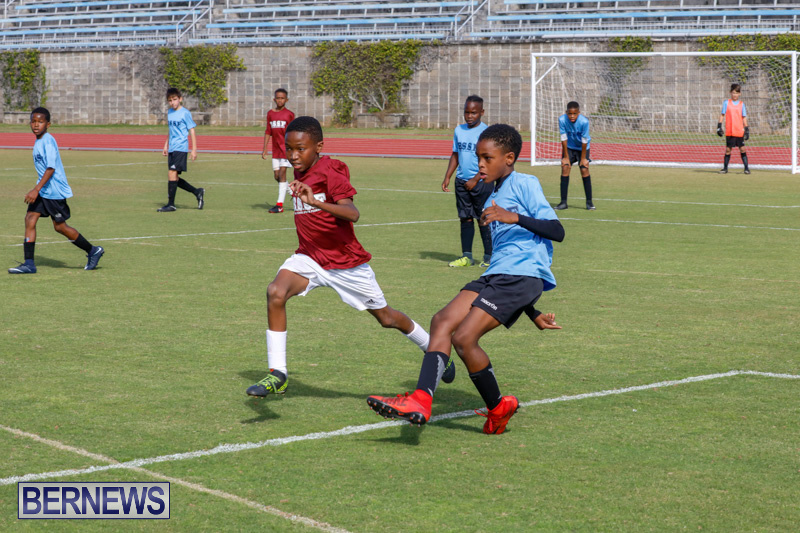 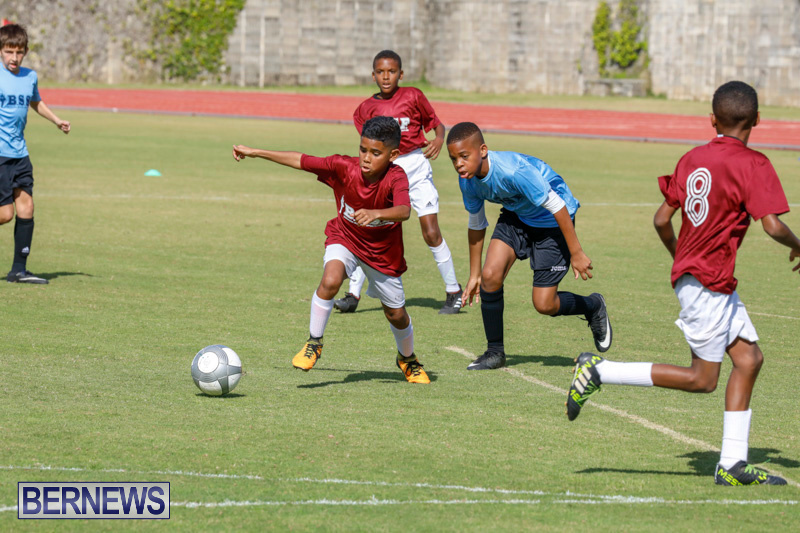 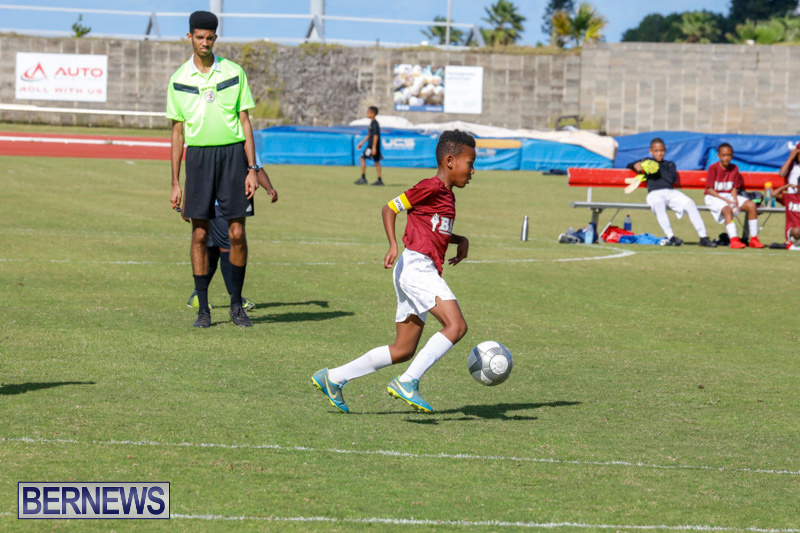 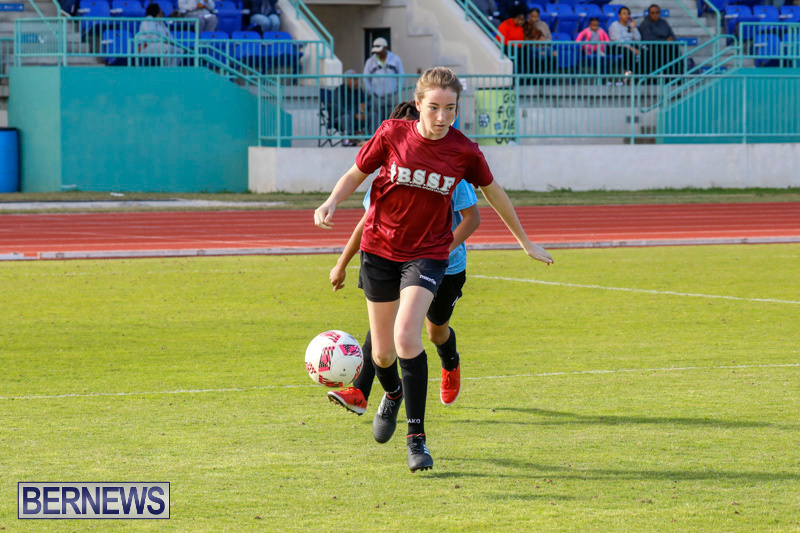 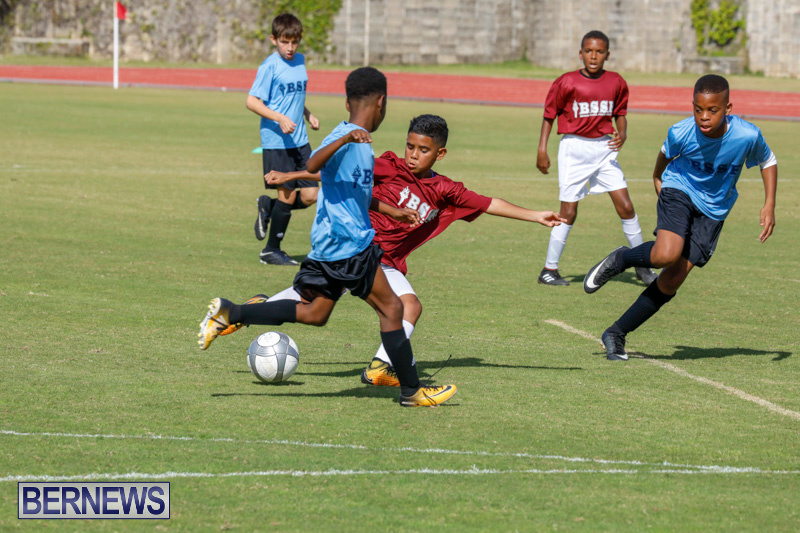 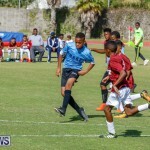 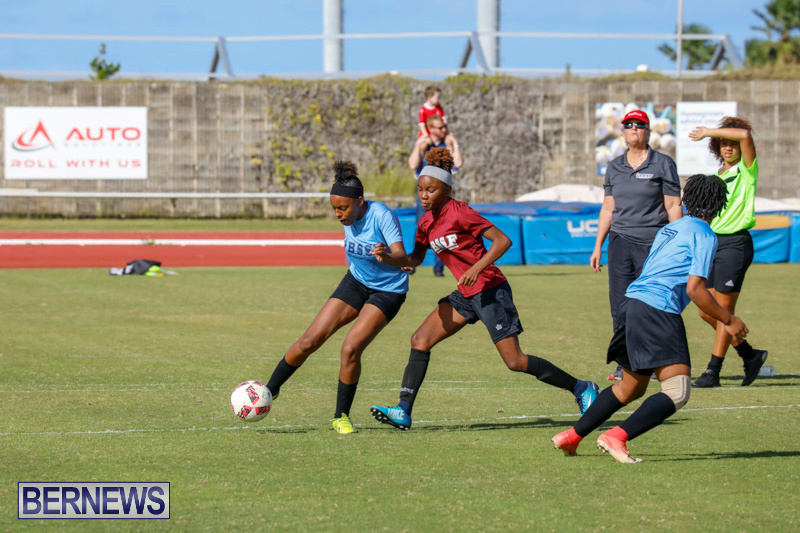 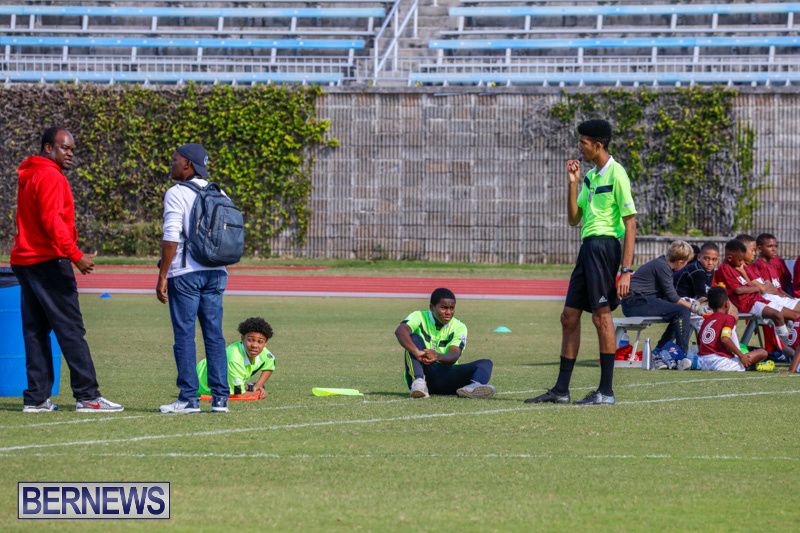 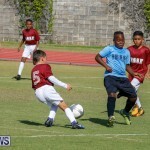 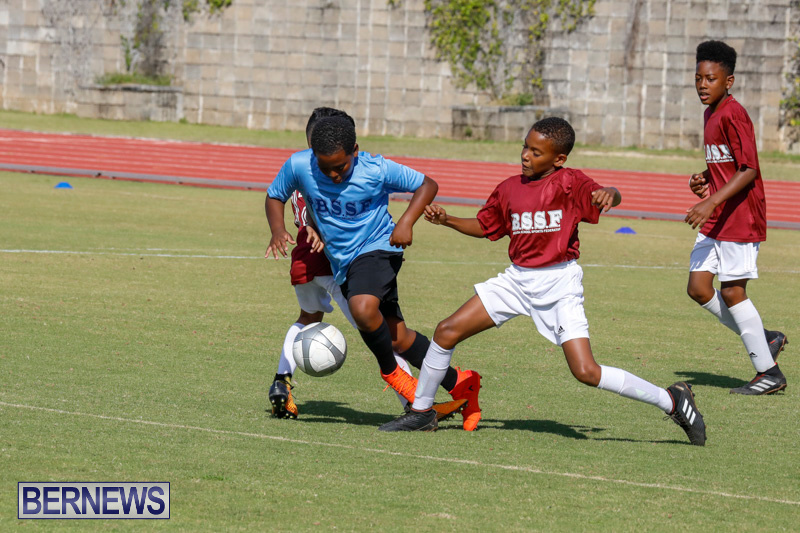 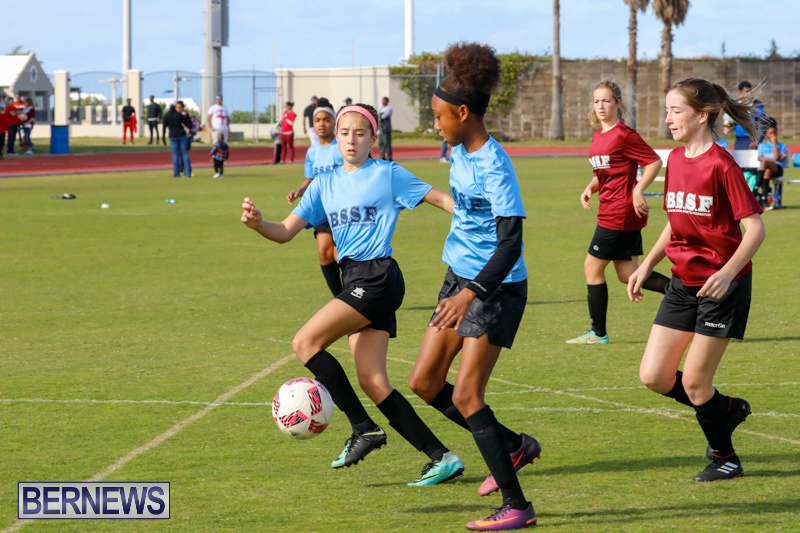 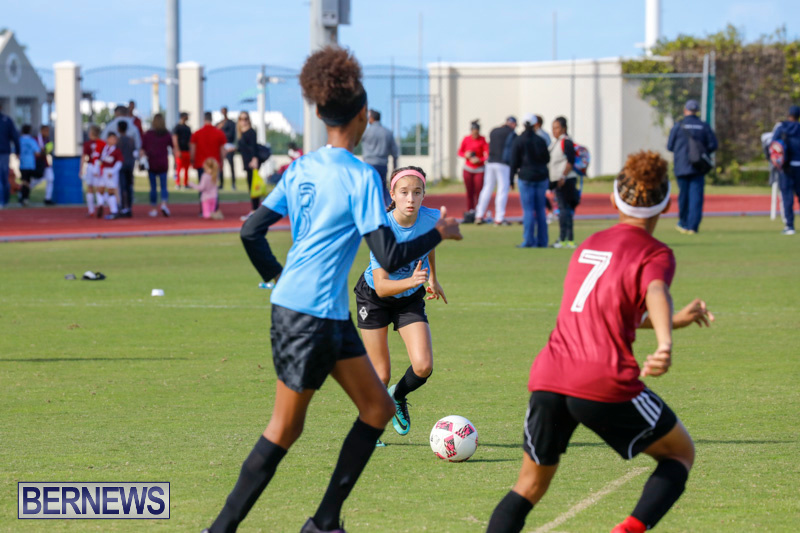 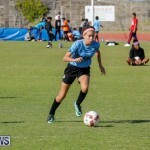 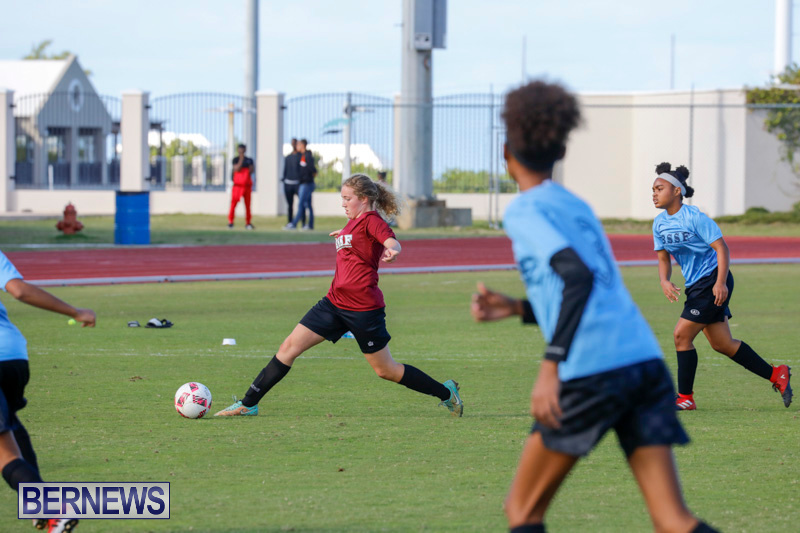 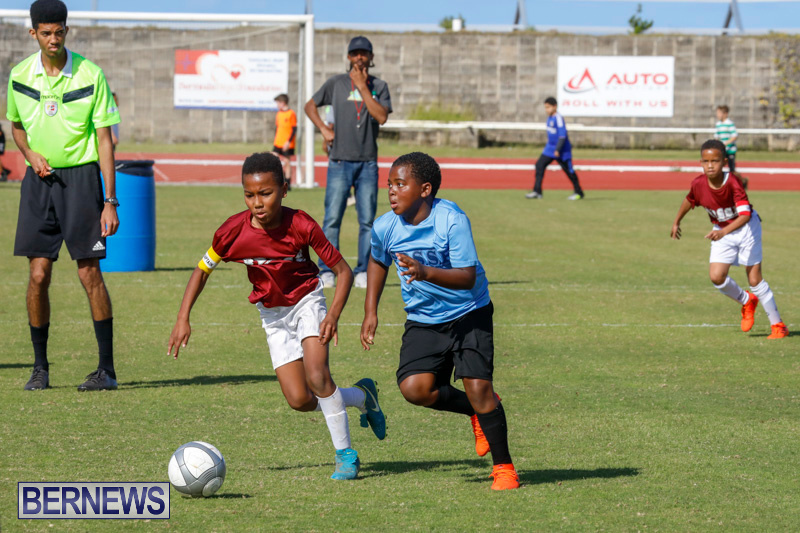 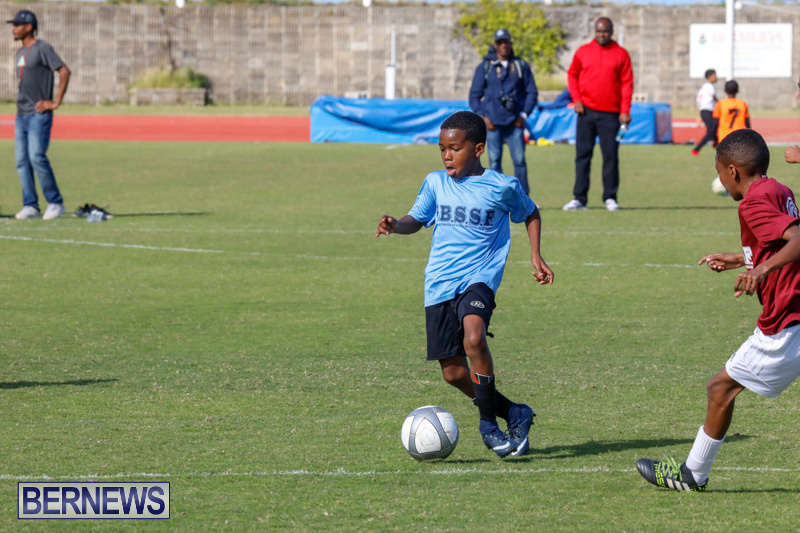 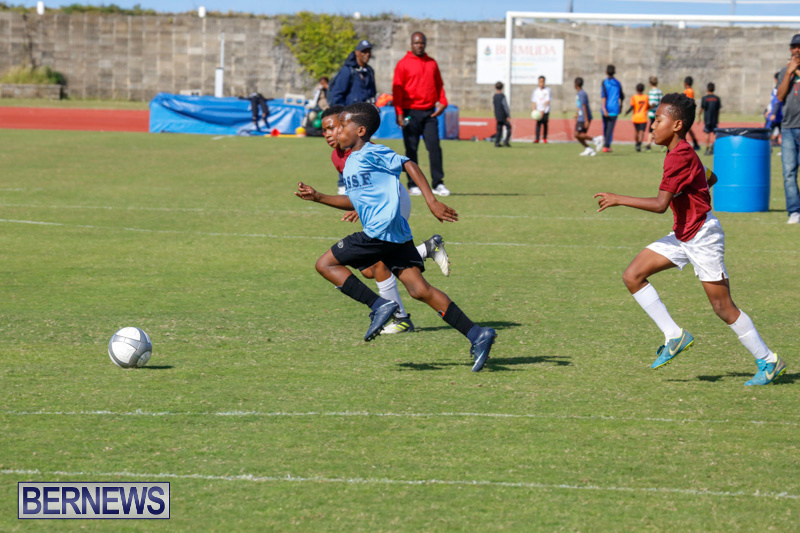 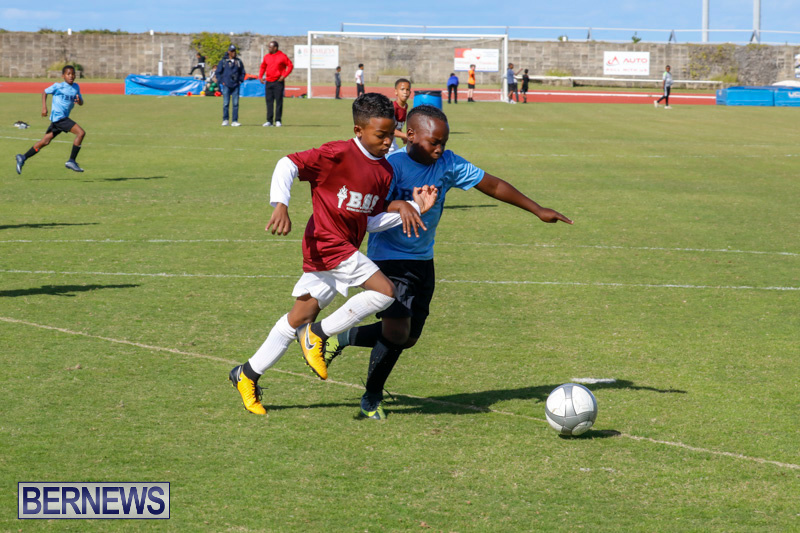 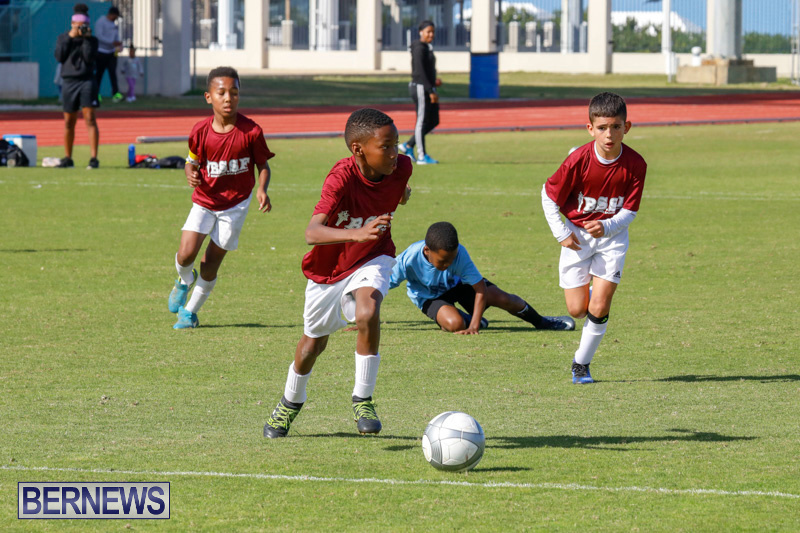 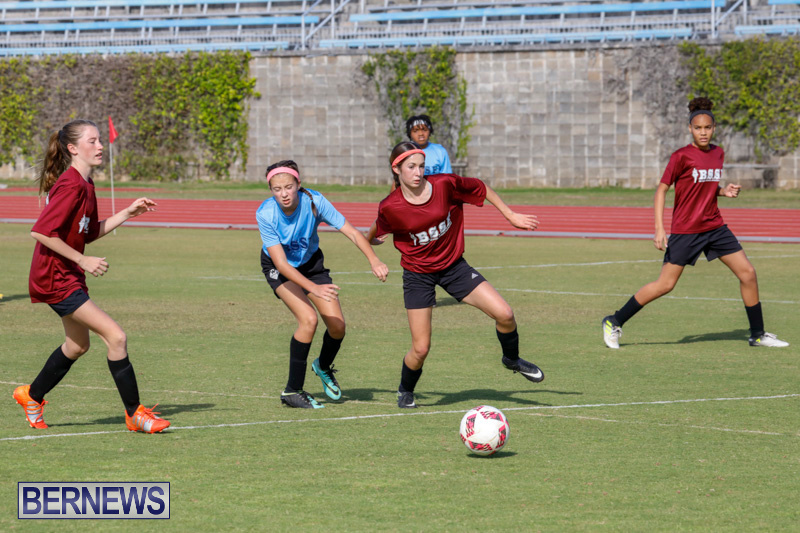 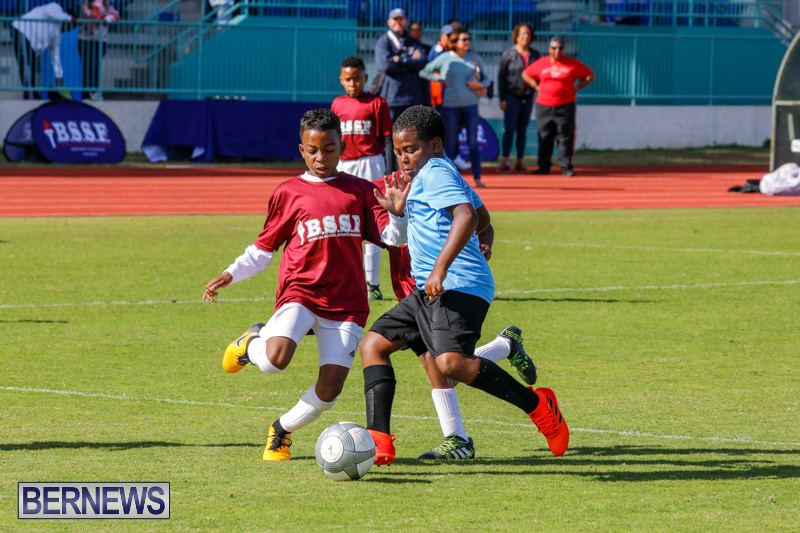 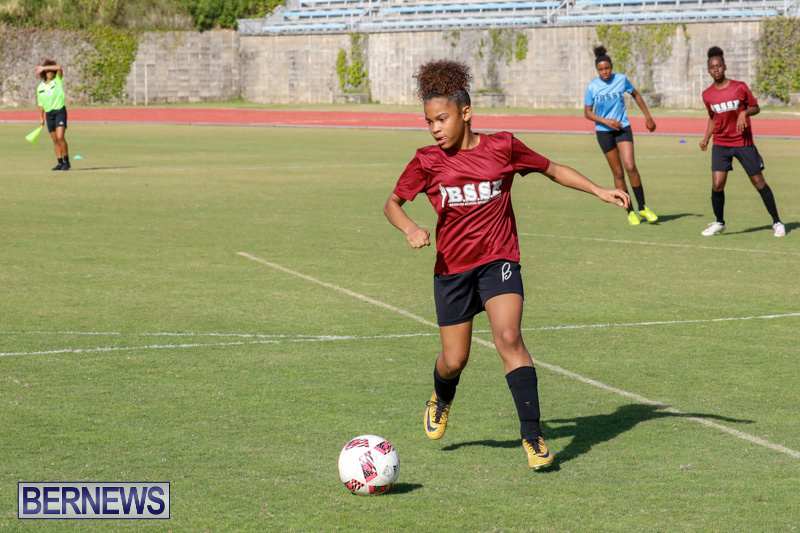 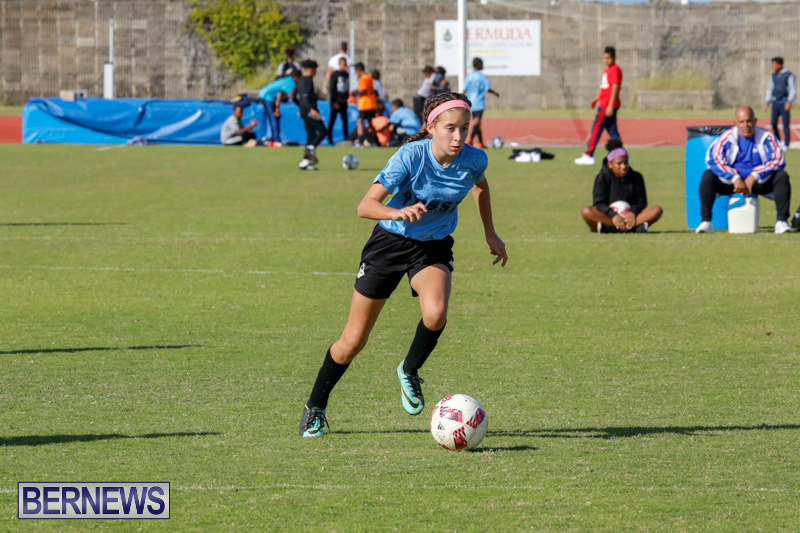 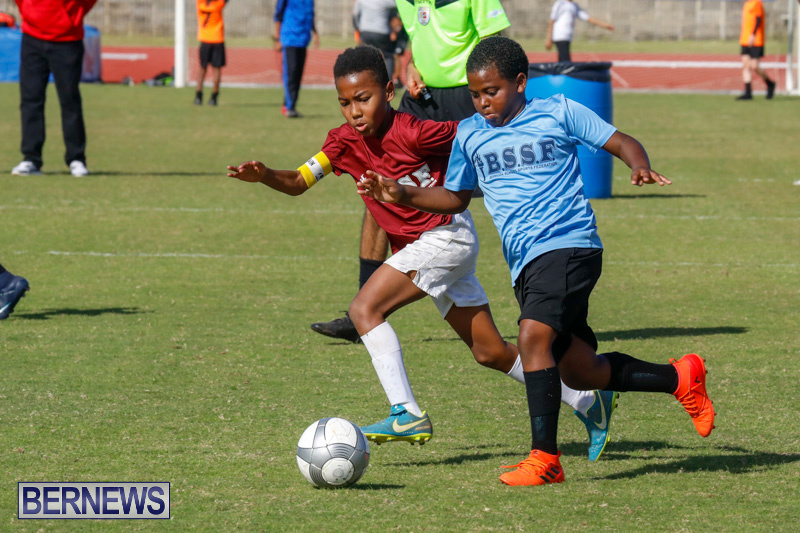 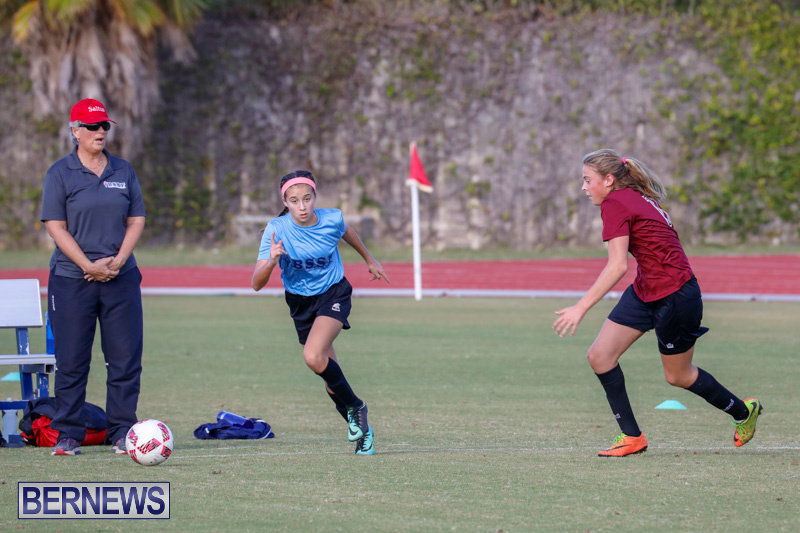 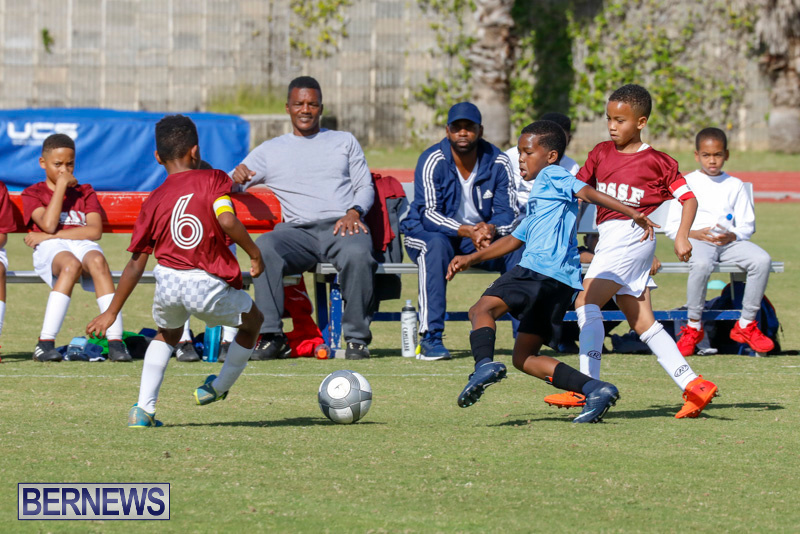 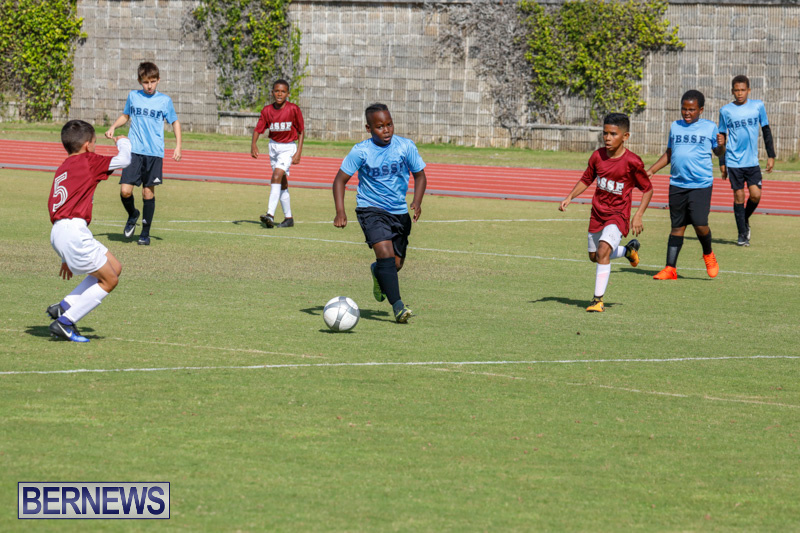 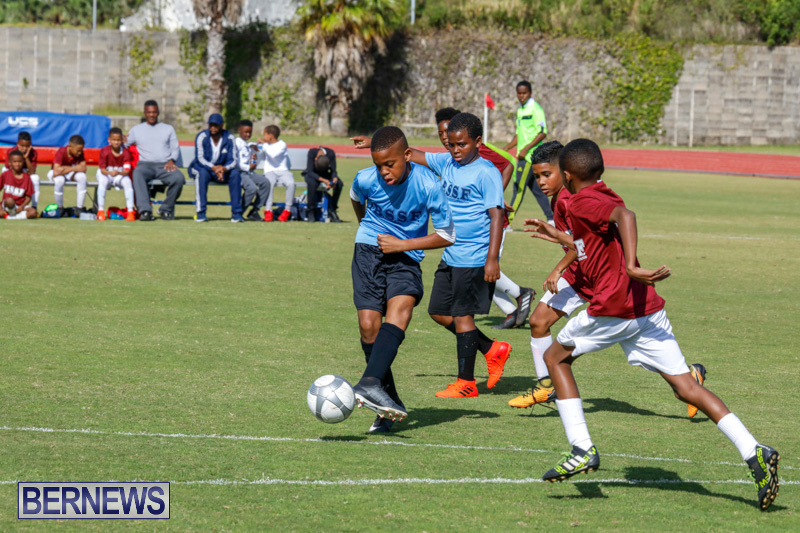 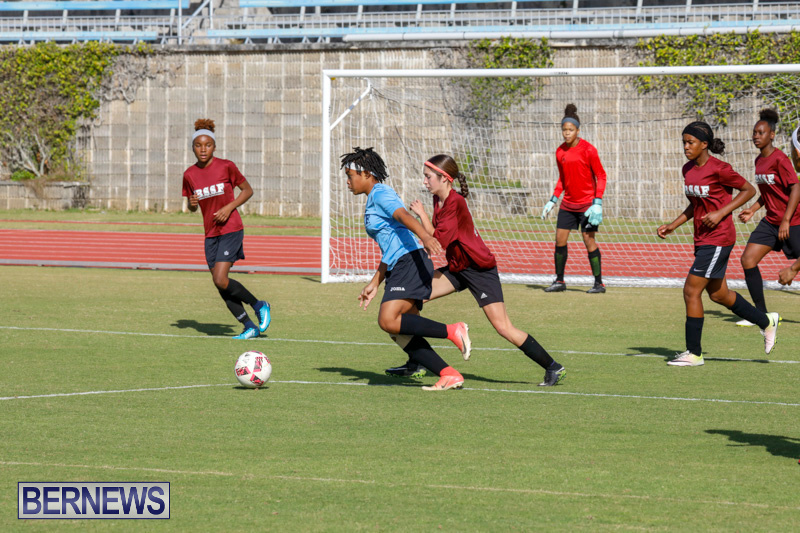 The west won four of the six matches in the 2018 Bermuda School Sports Federation All Star Football matches at the National Sports Center this weekend, as the island’s talented young footballers showcased their skills in east vs west matches. 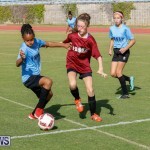 The first match of the day saw the west win 4-1 in the Primary School Girls match. 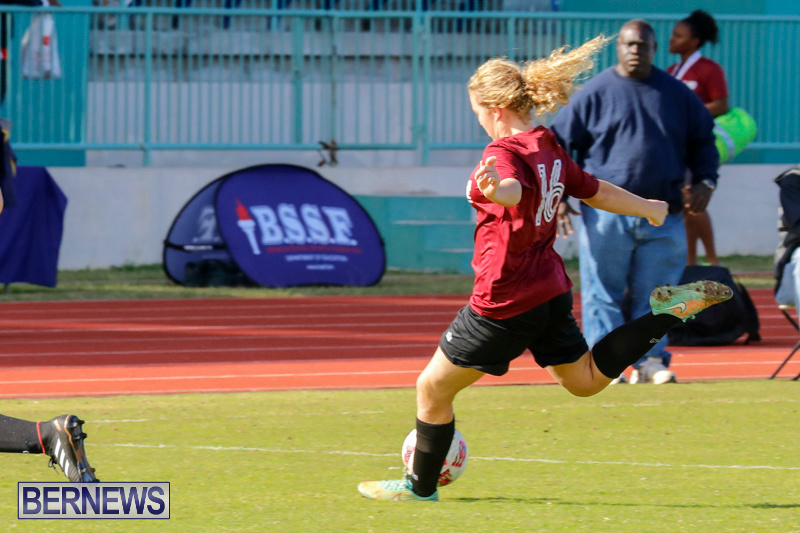 The west took the lead midway through the first half after Izzy Simons from Warwick Academy slotted in the first of her three goals from the penalty spot. 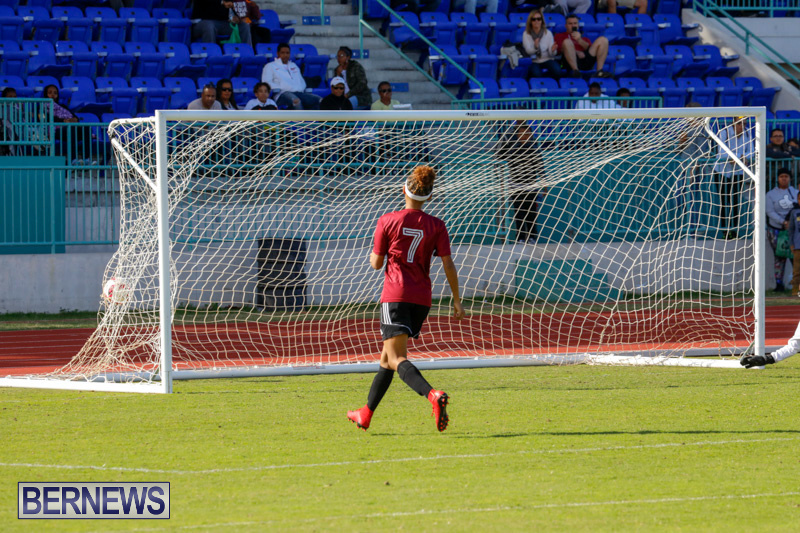 Simons doubled the lead early in the second period finding the back of the net with a cool finish. 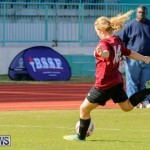 The east would pull one back through Robin-Valana Pearman from Somersfield Academy before Simons completed her hat trick. 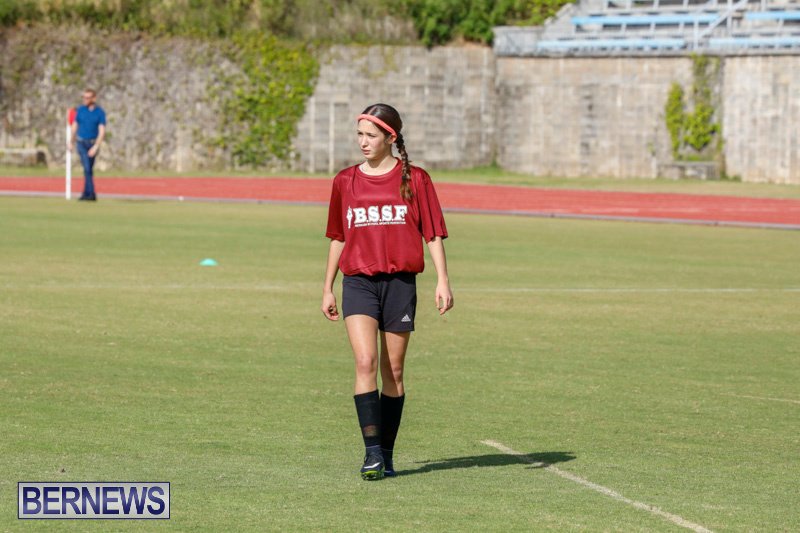 Simons was named MVP for the West while Imogen Judd from Somersfield Academy was MVP for the east. 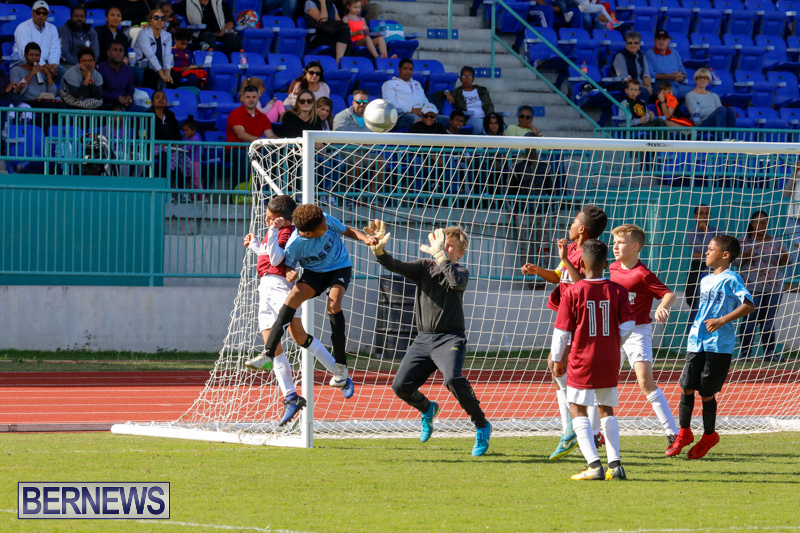 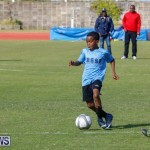 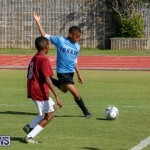 The east won the primary school boys match 5-4 in a penalty shootout after the match ended in a 1-1 draw. 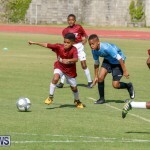 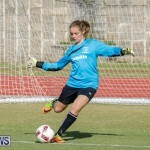 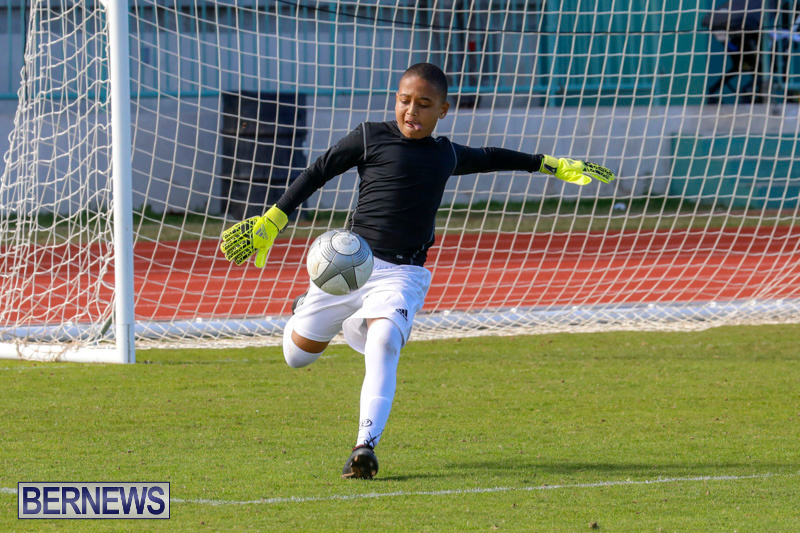 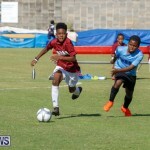 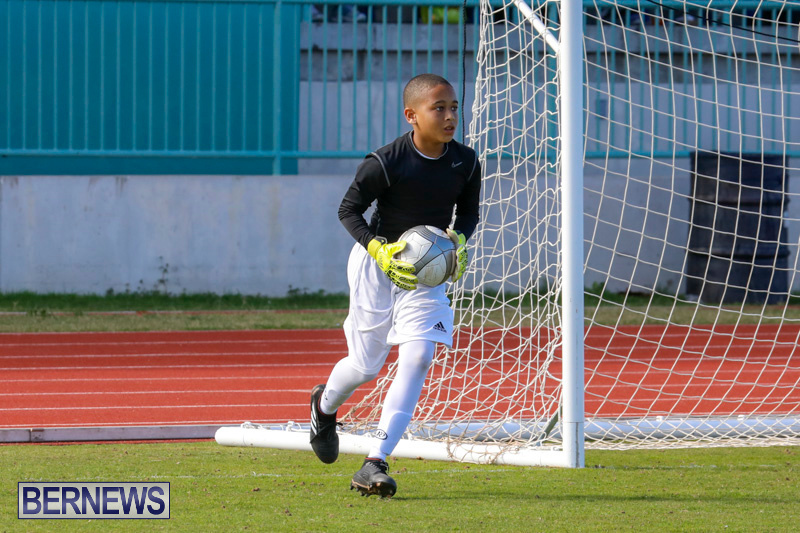 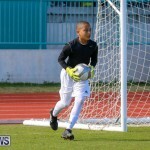 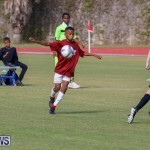 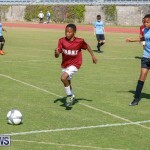 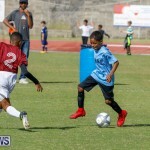 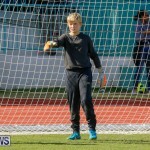 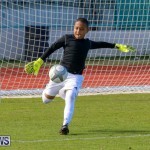 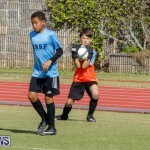 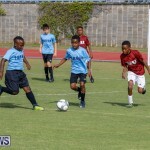 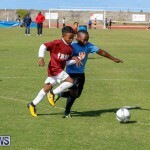 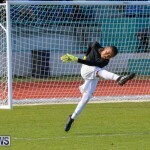 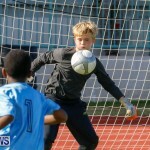 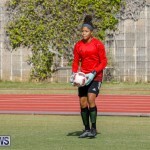 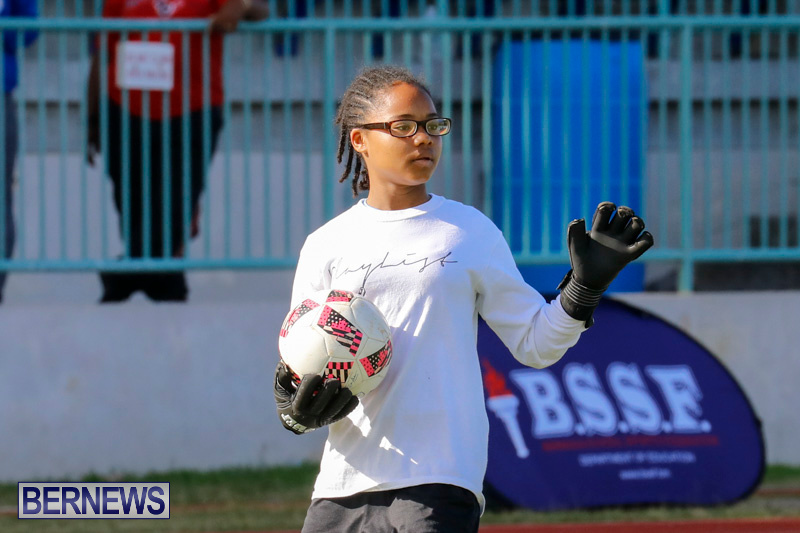 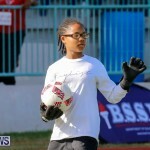 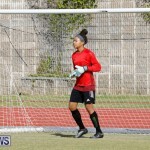 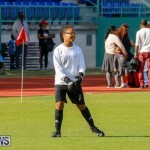 East goalkeeper Skyler Young from Harrington Sound Primary was named MVP along with Saltus Grammar School’s James Morrison. 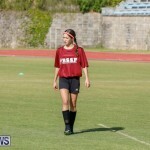 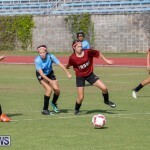 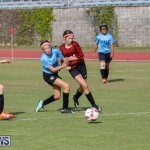 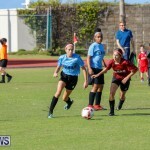 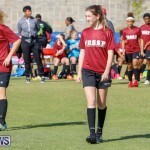 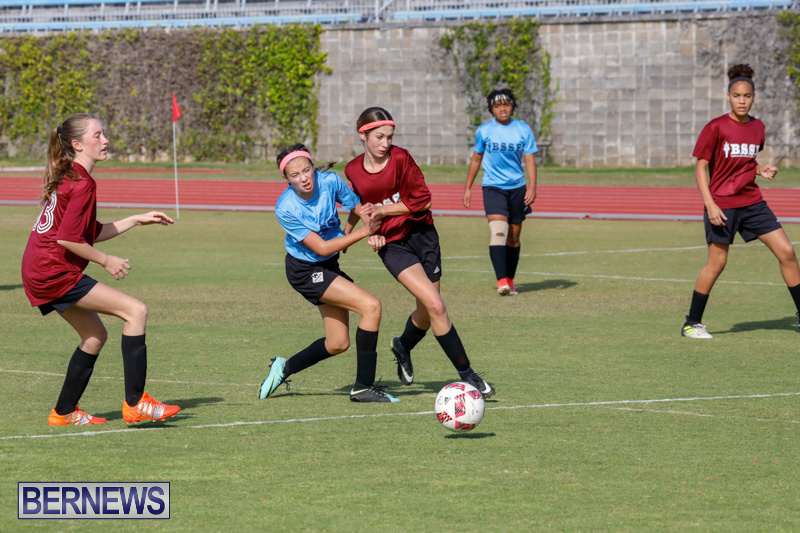 Ellie Richmond scored a hat trick to lead the west to a 3-2 victory in the middle school girls match, as the Warwick Academy student found the back of the net with three well executed goals. 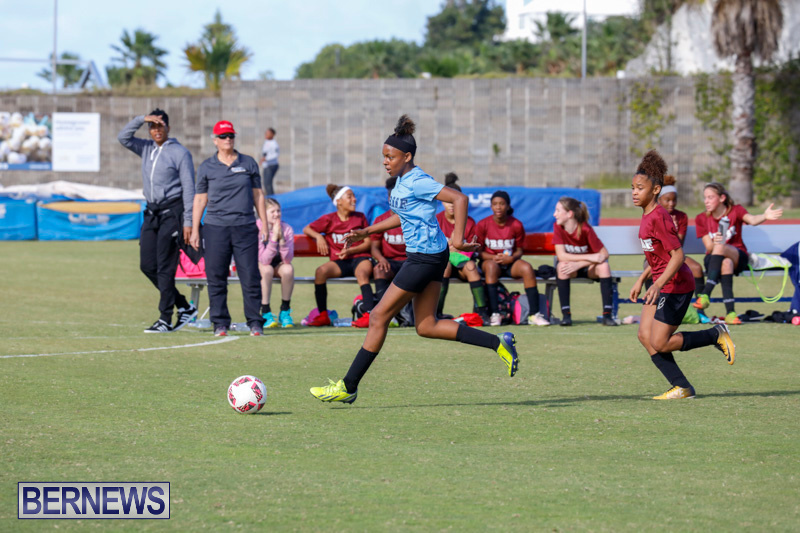 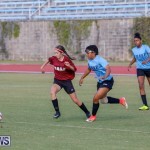 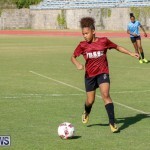 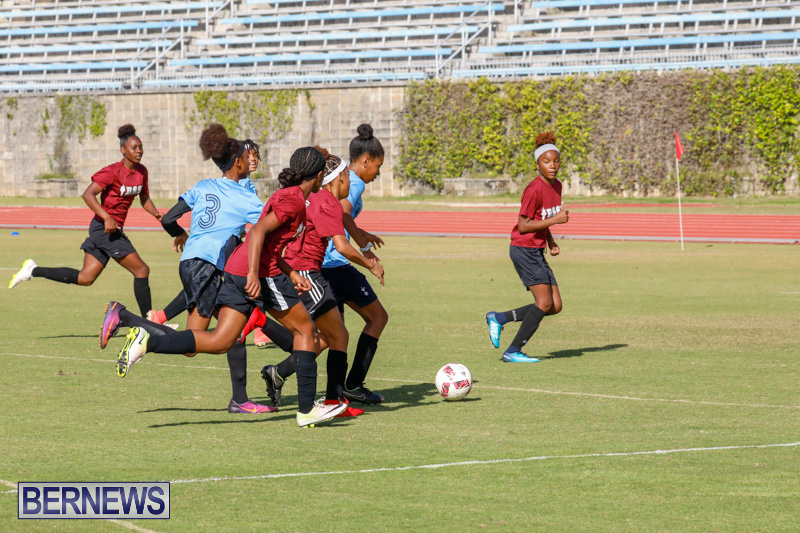 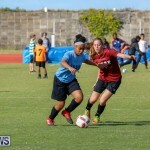 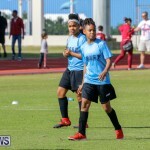 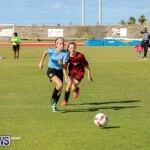 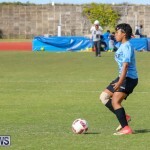 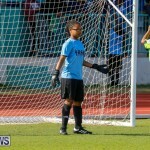 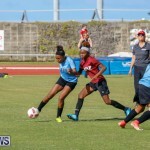 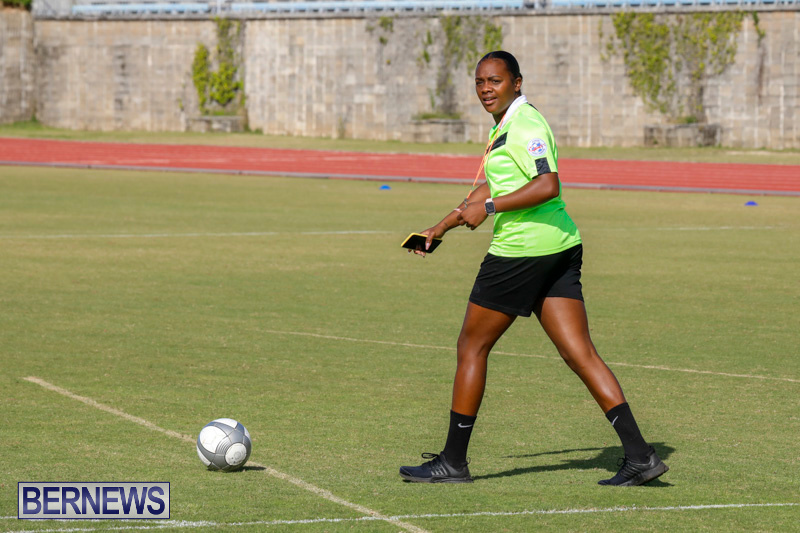 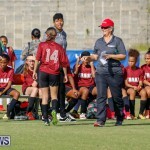 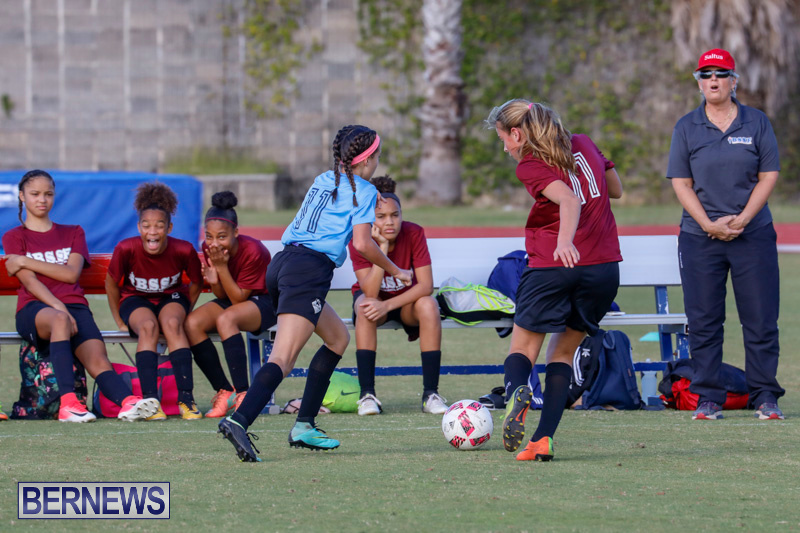 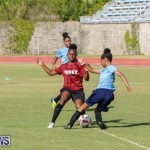 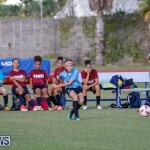 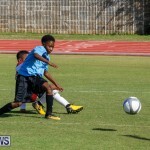 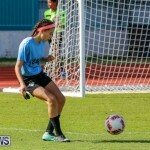 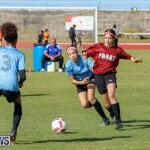 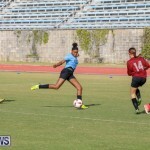 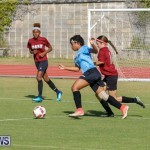 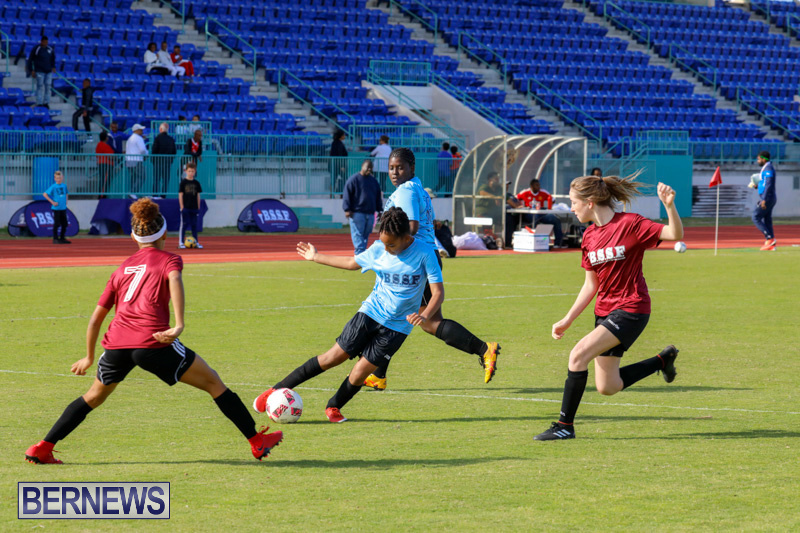 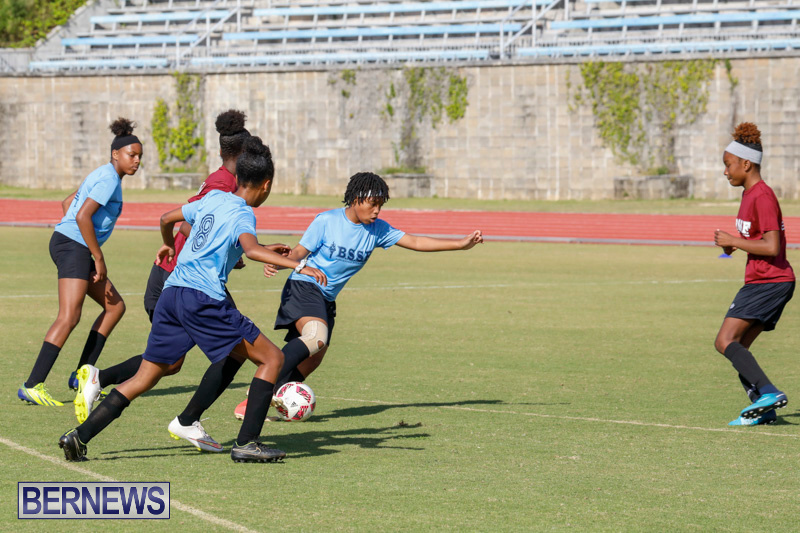 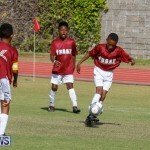 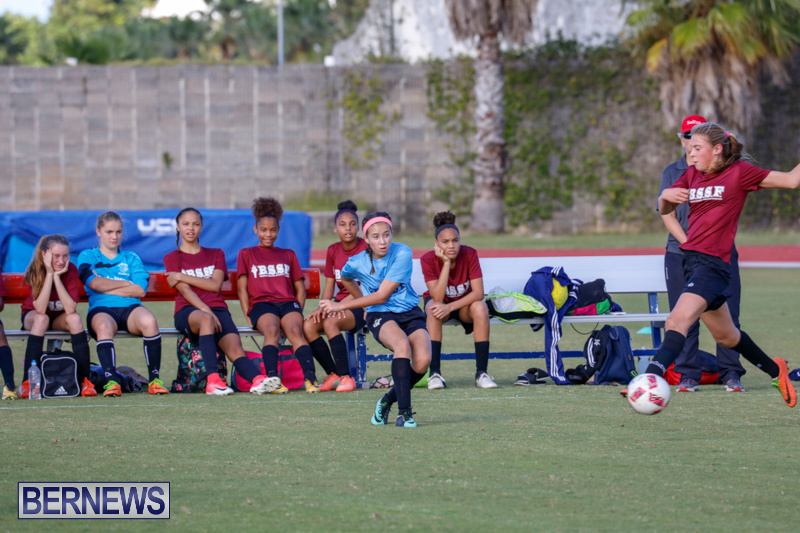 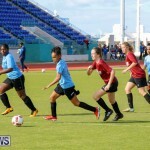 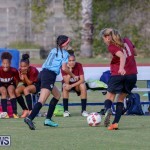 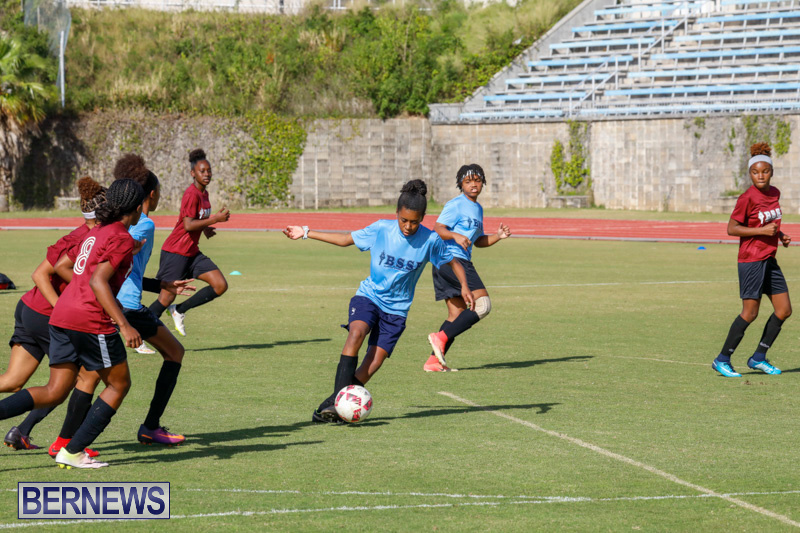 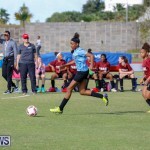 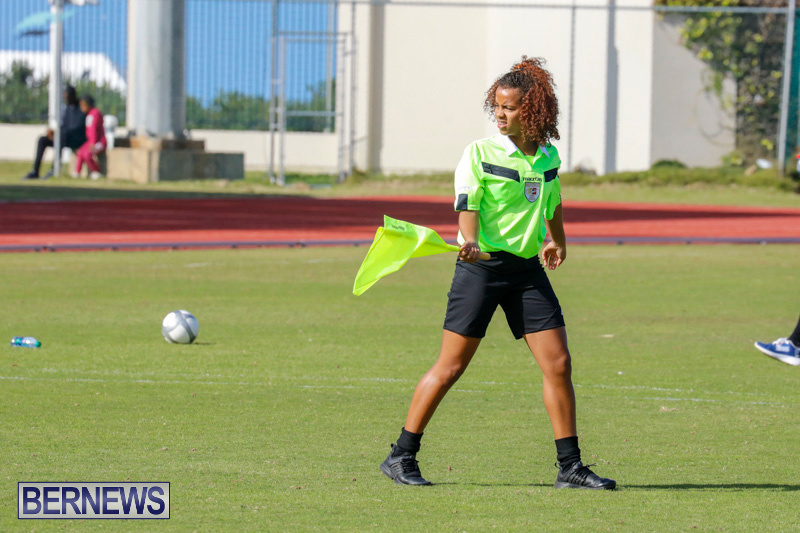 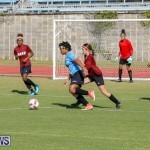 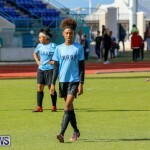 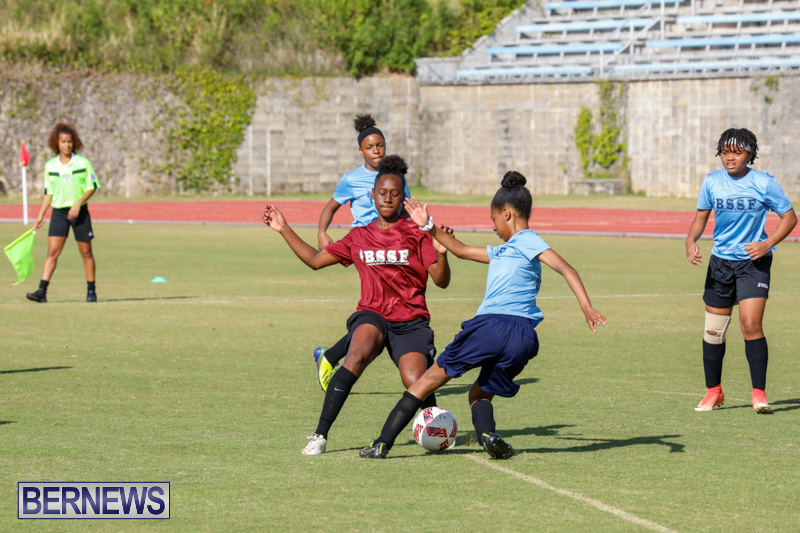 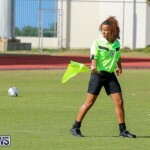 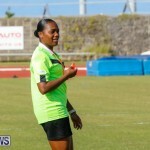 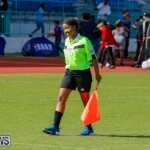 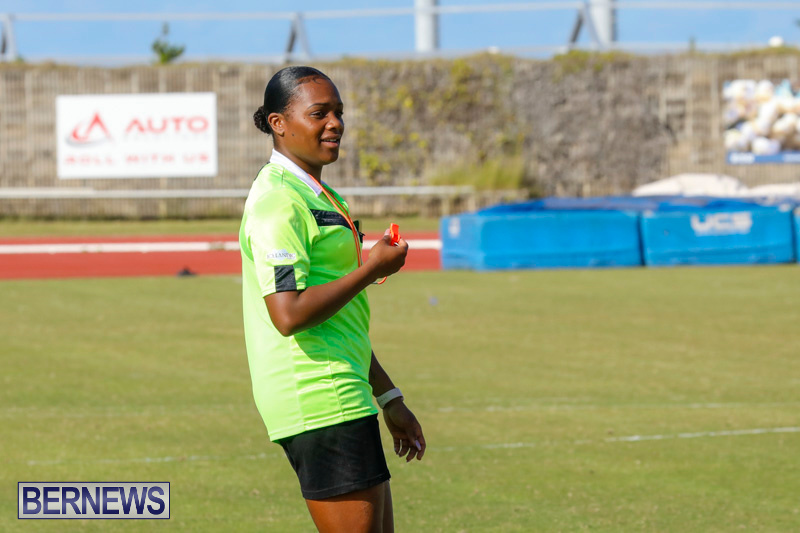 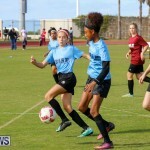 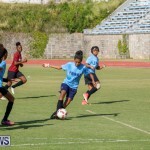 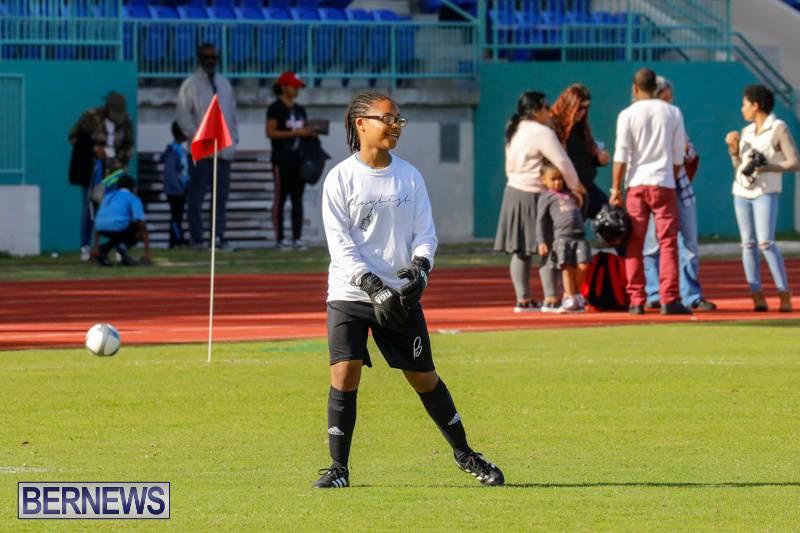 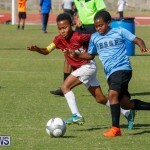 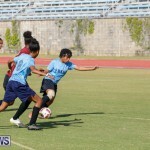 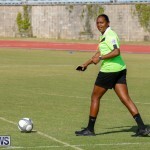 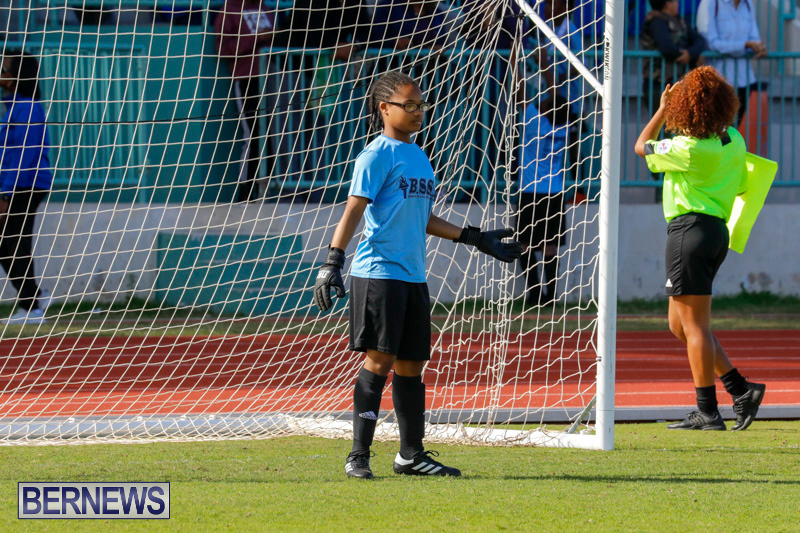 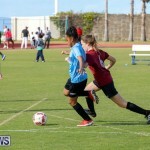 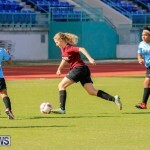 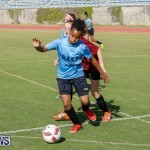 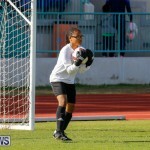 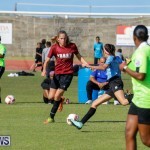 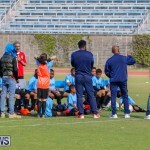 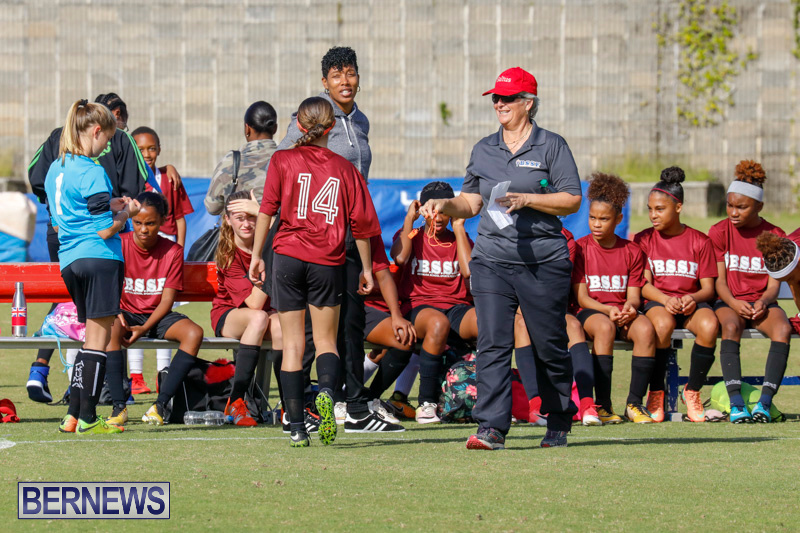 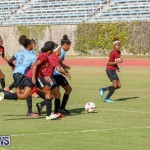 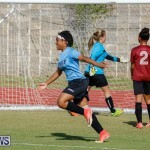 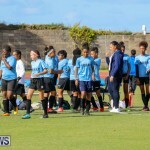 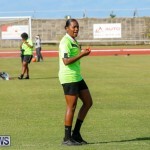 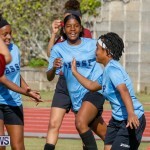 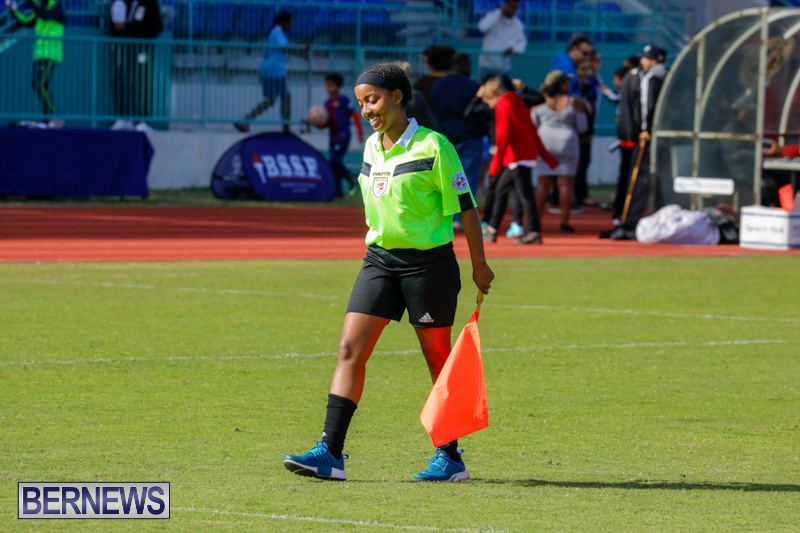 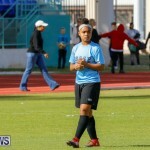 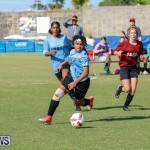 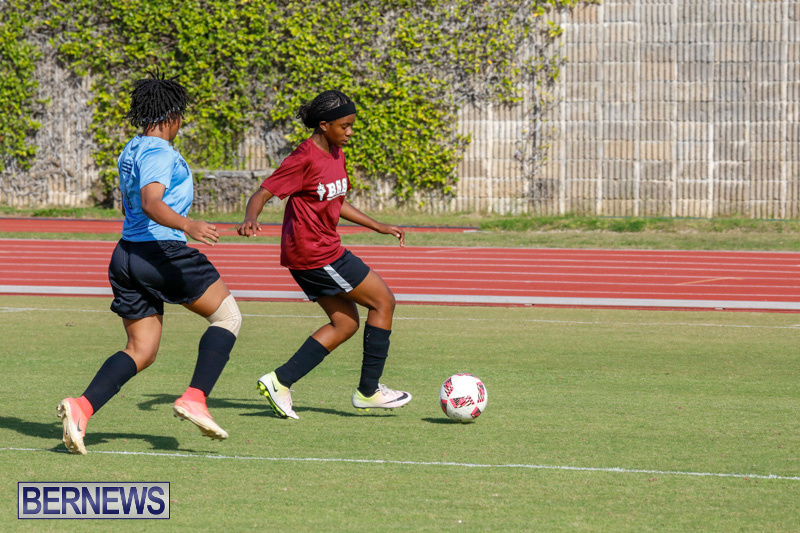 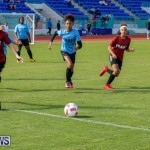 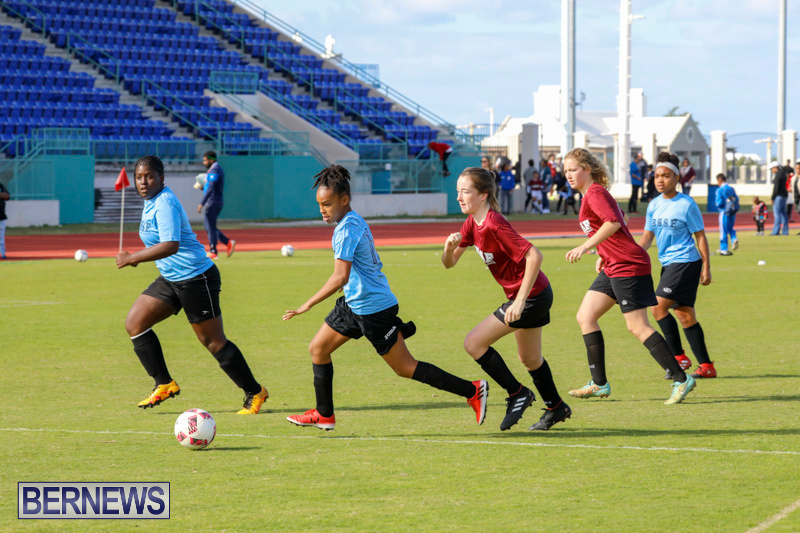 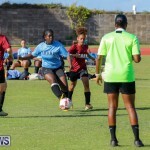 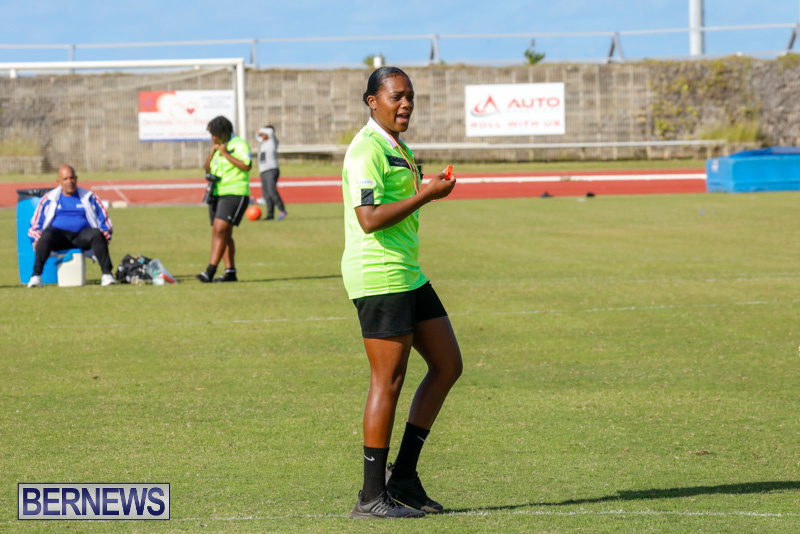 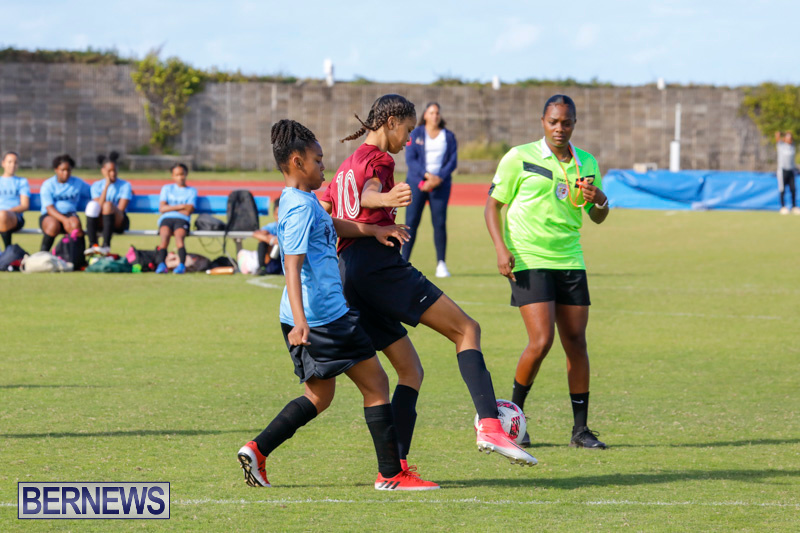 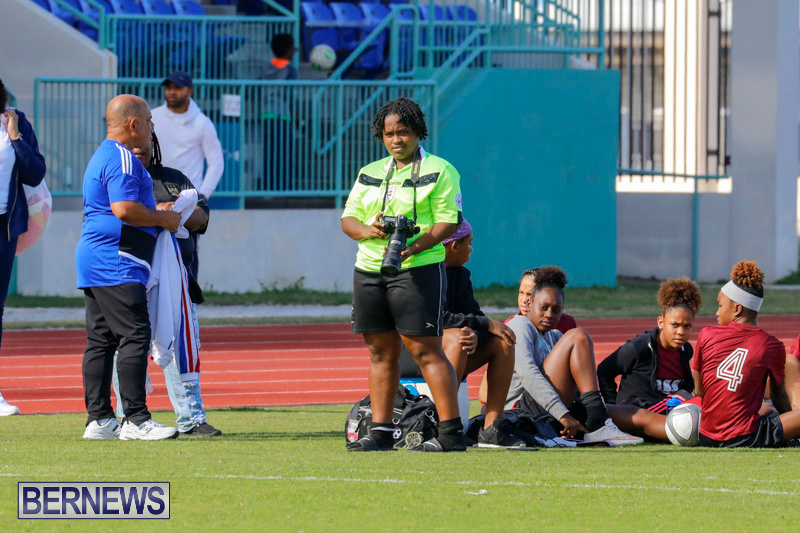 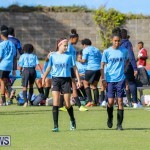 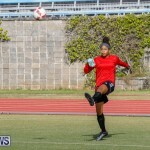 The east got goals from Whitney Institute’s Jahni Simmons and T’aja Williams from Bermuda High School. 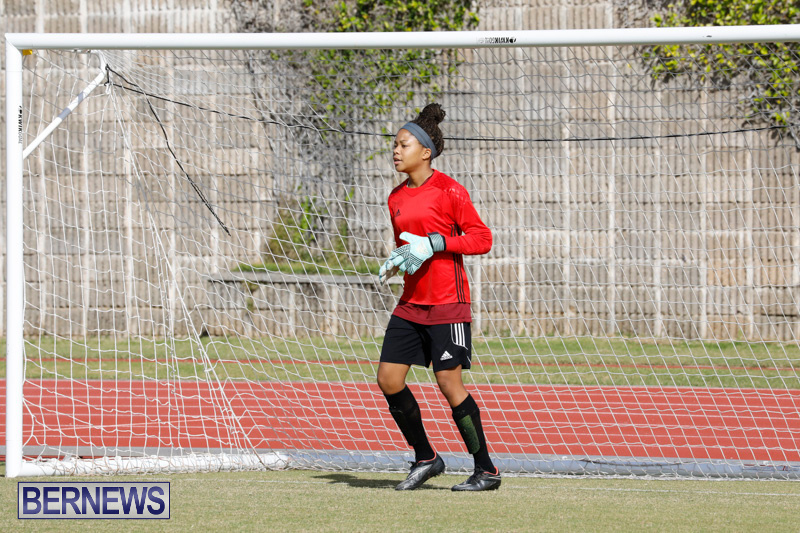 Richmond was named west MVP, while Kenshae’ Richardson from Whitney collected MVP honours for the east. 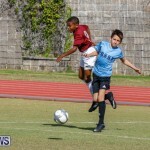 The west would also win 3-2 in the middle school boys match. 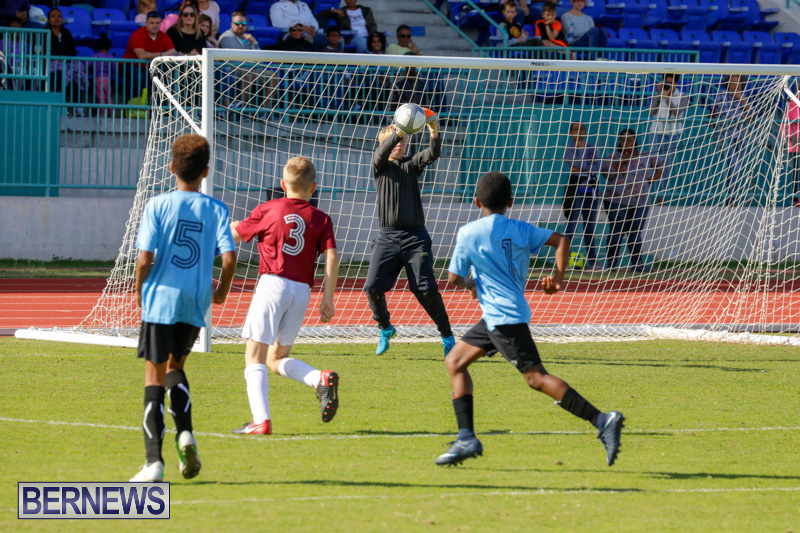 Somersfield Academy’s Hunter Outerbridge would give the east the lead with a stunning long range effort in the first minute. 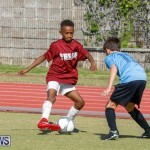 That lead would be short lived as Sekai Tatem from T.N. 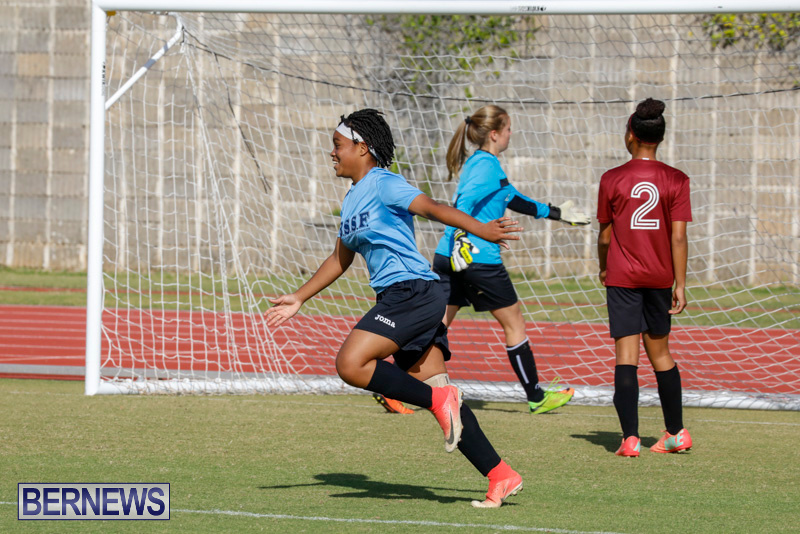 Tatem would level the score two minutes later with a fine finish. 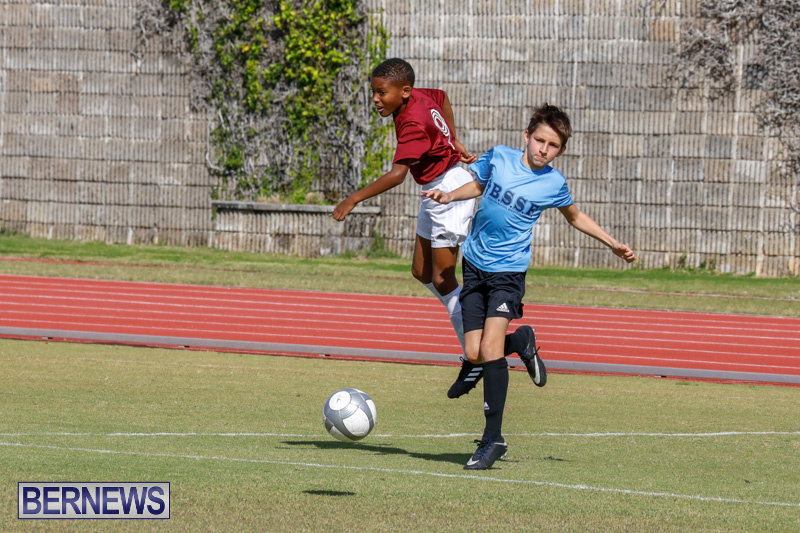 Owen Botelho from Mount Saint Agnes would restore the east lead with a goal from the edge of the box. 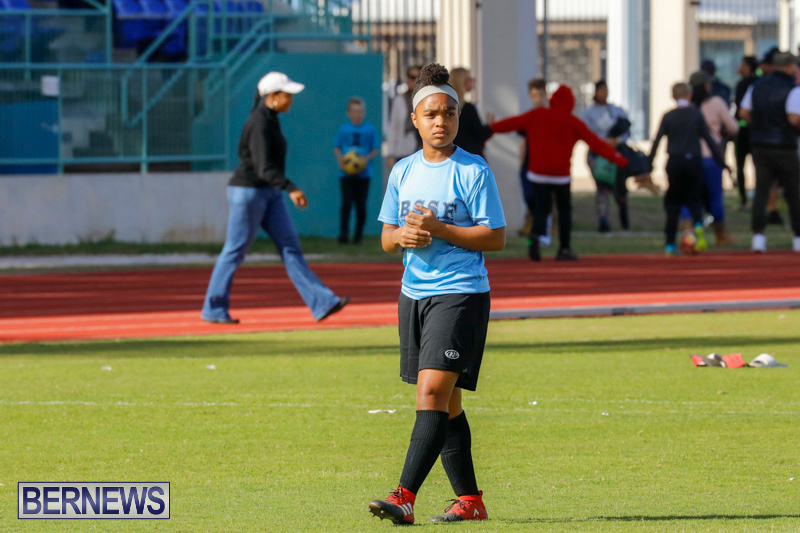 Kydne Mallory would settle things late in the game with two exquisite goals. 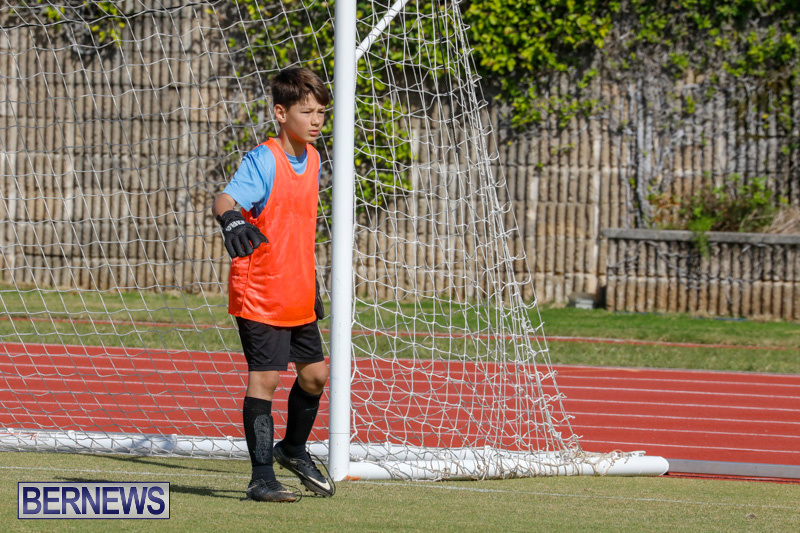 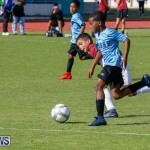 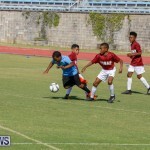 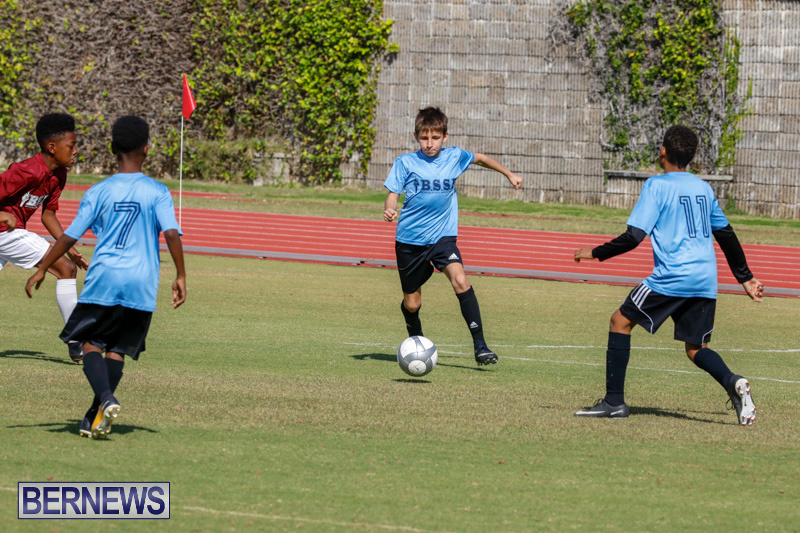 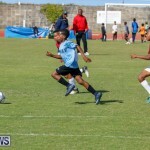 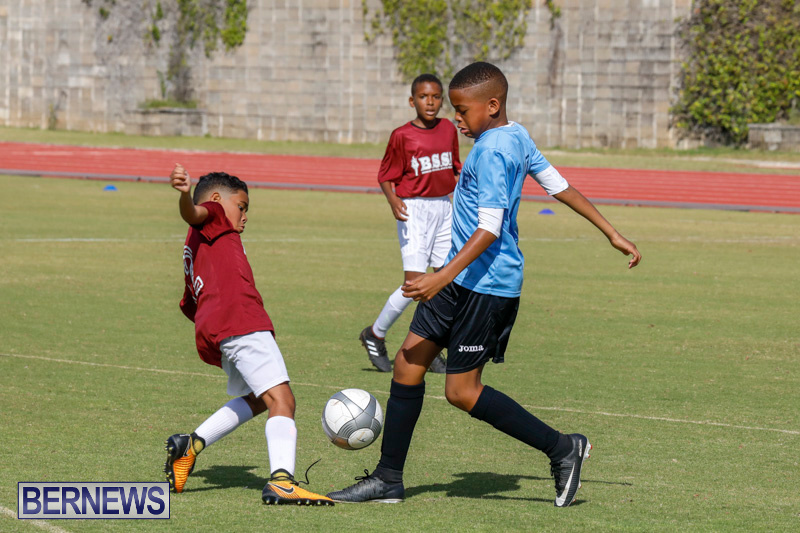 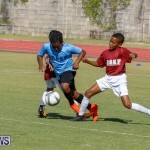 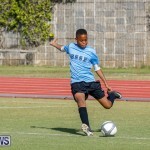 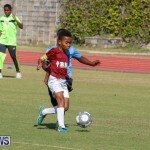 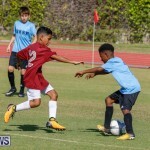 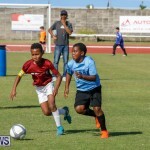 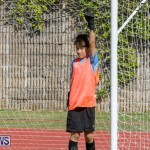 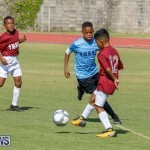 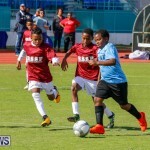 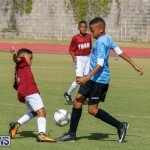 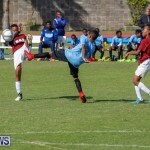 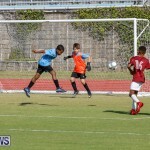 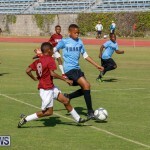 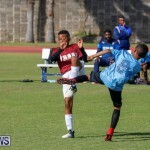 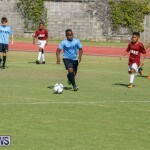 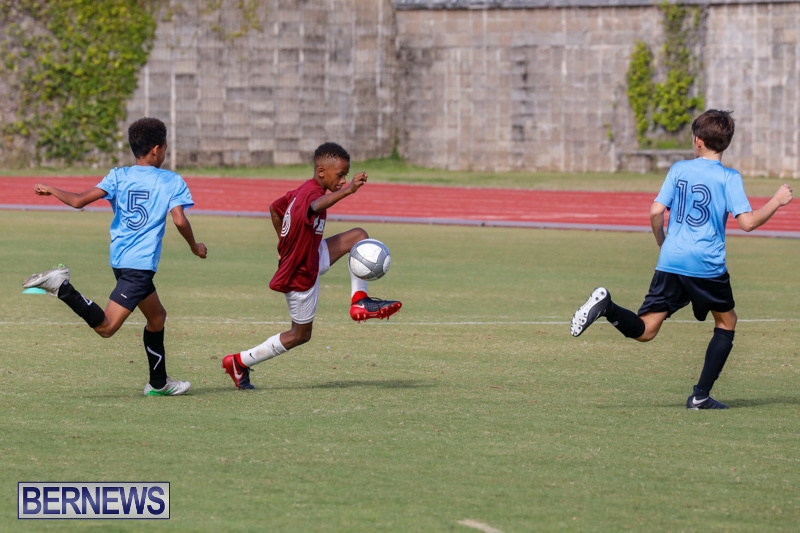 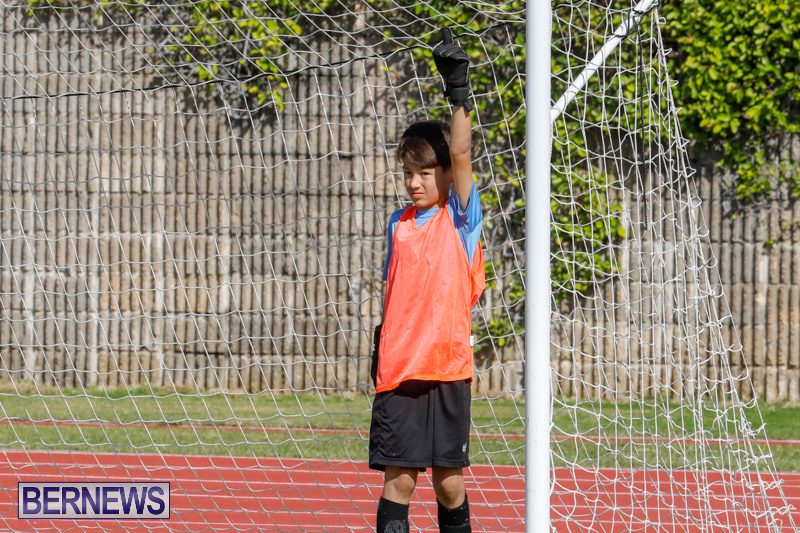 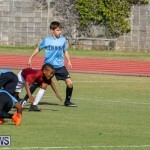 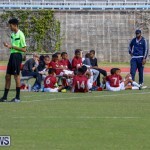 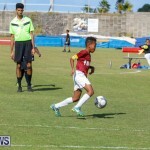 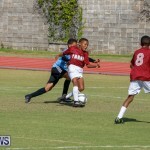 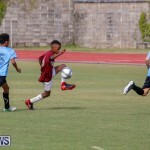 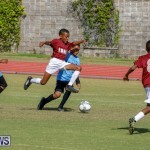 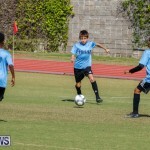 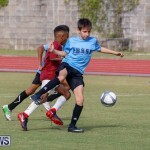 The Sandys Secondary Middle School student scored his first by chipping the advancing keeper, and minutes later he settled the match with another goal. 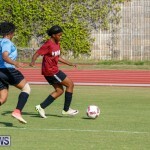 Mallory was named MVP for the West while Zhani Burgess from the Whitney Institute was named the east MVP. 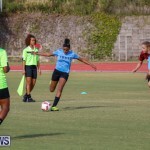 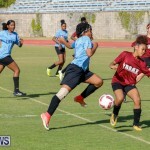 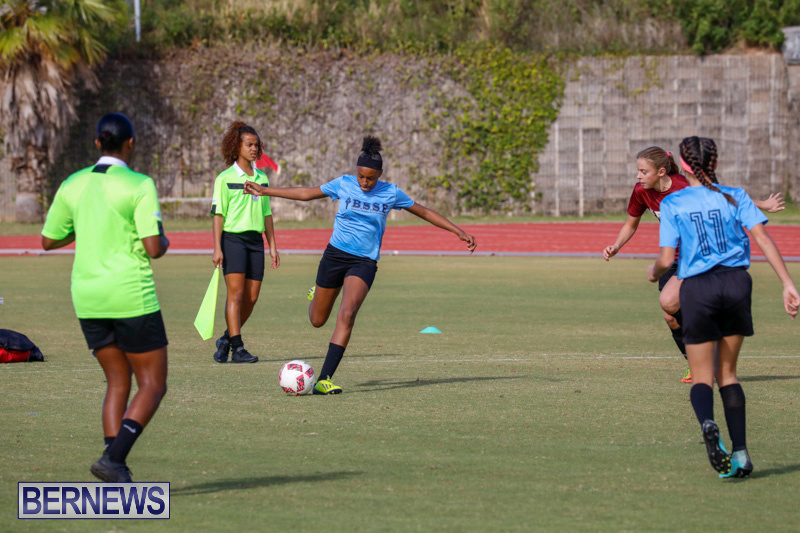 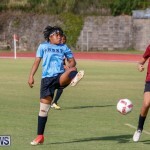 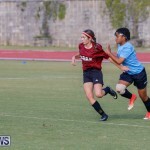 Penalties were needed to determine the senior school girl winners and the east held their nerve to score all five of their spot kicks with the west missing only one. 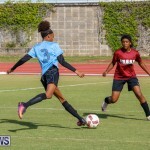 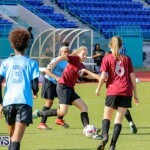 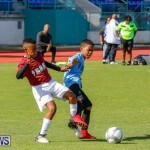 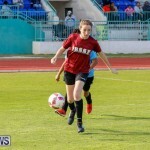 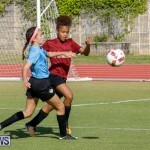 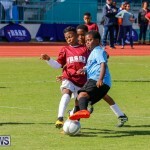 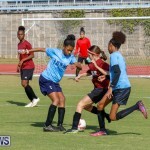 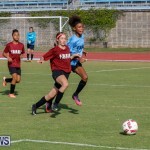 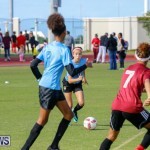 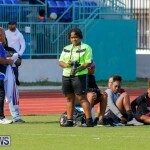 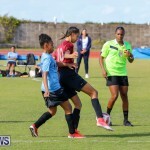 The match had ended 2-2; Jade Stewart from CedarBridge Academy scored in the 3rd minute after the ball was handled in the penalty area by a west defender. 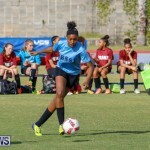 Adia Gibbons from the Berkeley Institute would equalize for the west after beating the east keeper in a one on one situation. 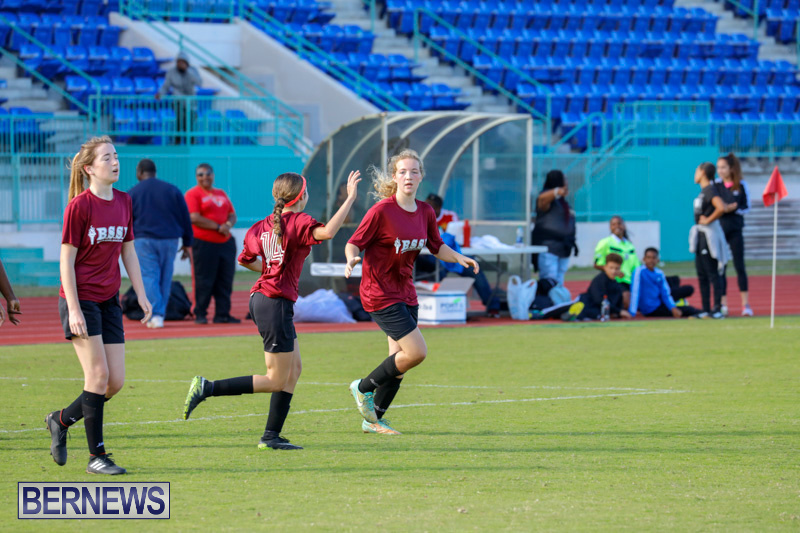 Gibbons would score again after following up on a shot by Teyah Lindo, and Ryley Simmons would equalize for the east with a 35 yard effort. 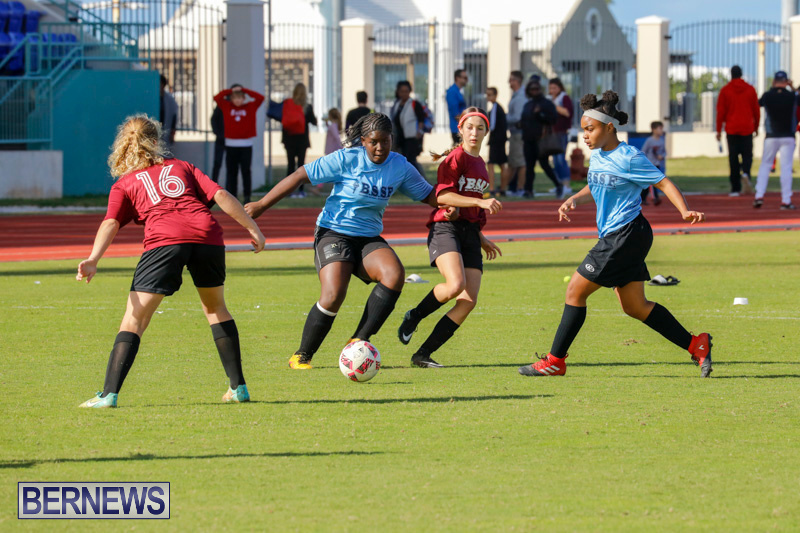 CedarBridge Academy’s Lindo was named MVP along with Saltus Grammar School’s Danni Watson. 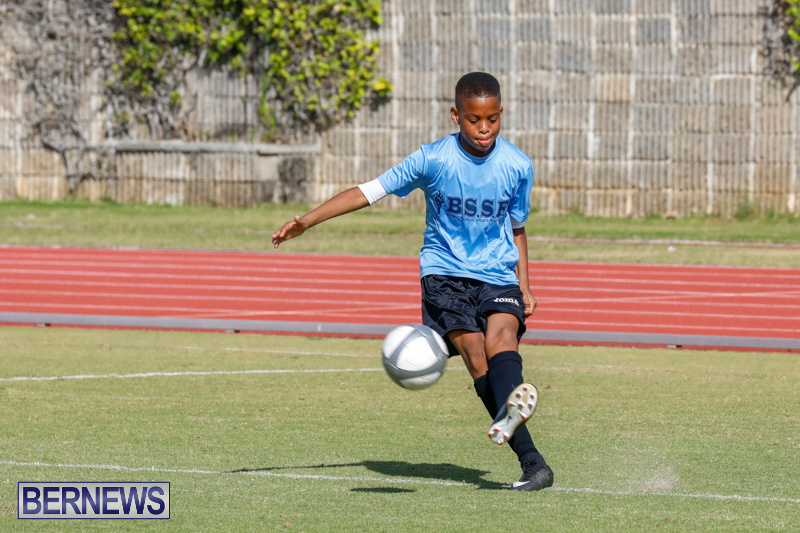 D’Andre Wainwright from the Berkeley Institute would score twice to lead the west to. 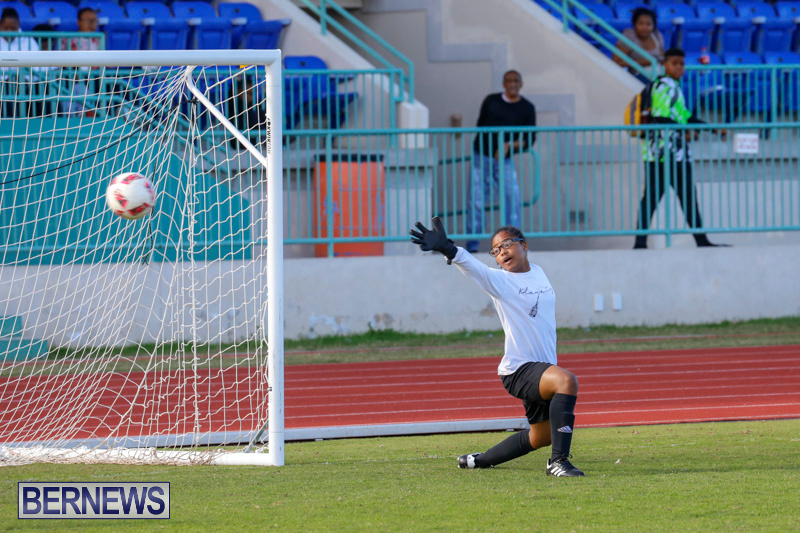 2-1 victor over the east in the senior school boys game. 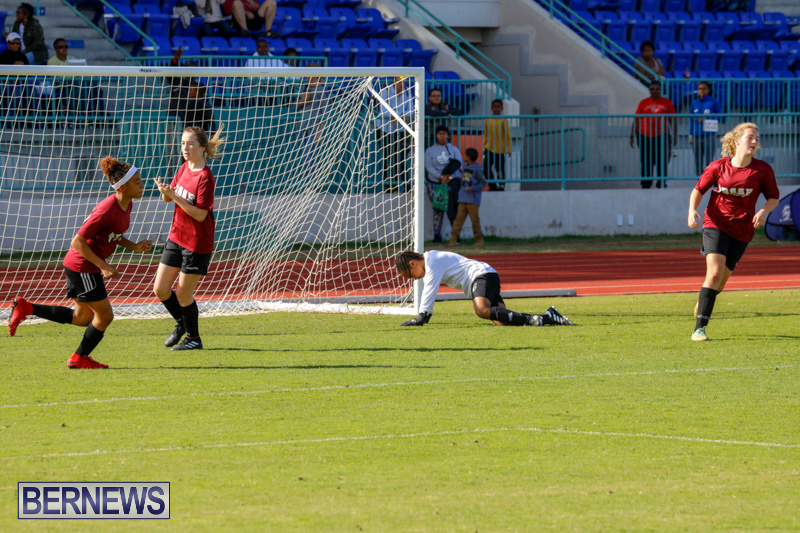 Wainwright would score in the fourth minute after getting a head on the end of a Keishon Bean free kick. 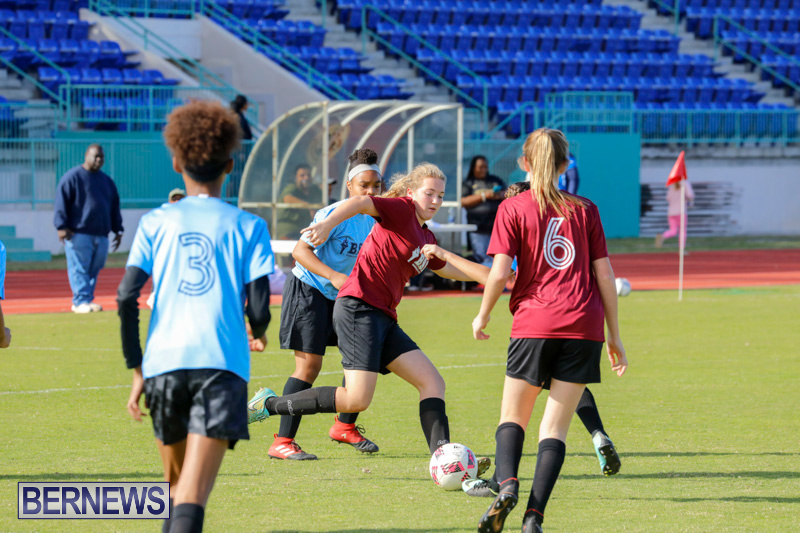 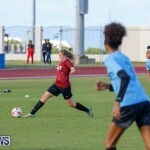 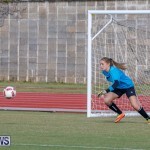 The east would find a second half equalizer after Jeze Butterfield from the Berkeley Institute scored after beating three defenders before sliding the ball past the west keeper. 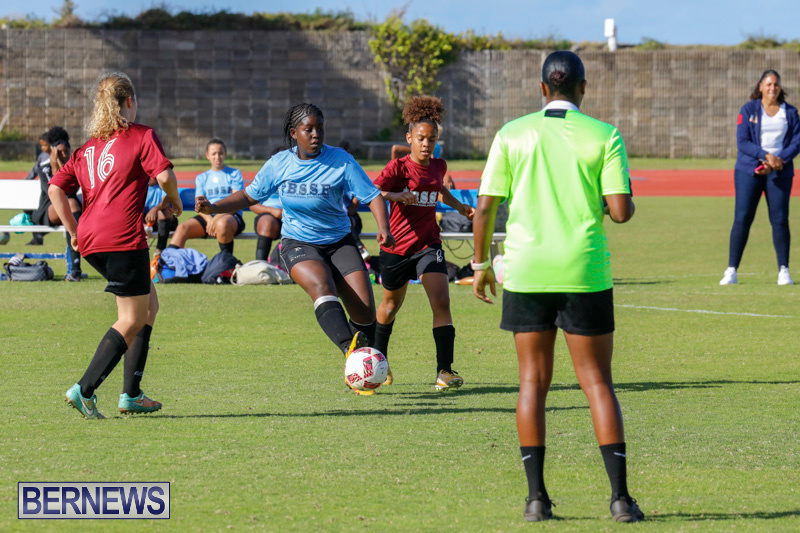 Wainwright would be on hand again to seal the victory for the west with minutes left on the clock. 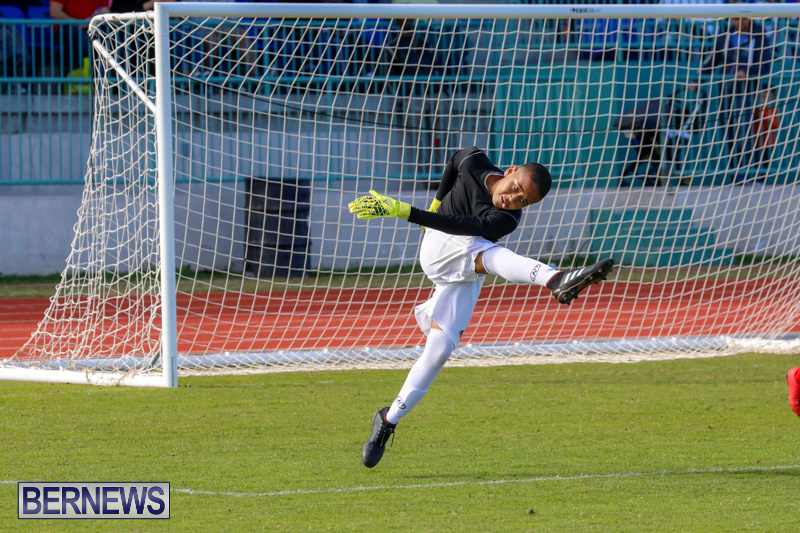 The east MVP was Jalun Hassell from CedarBridge Academy while the West MVP title went to Berkeley’s Jinairo Johnson.